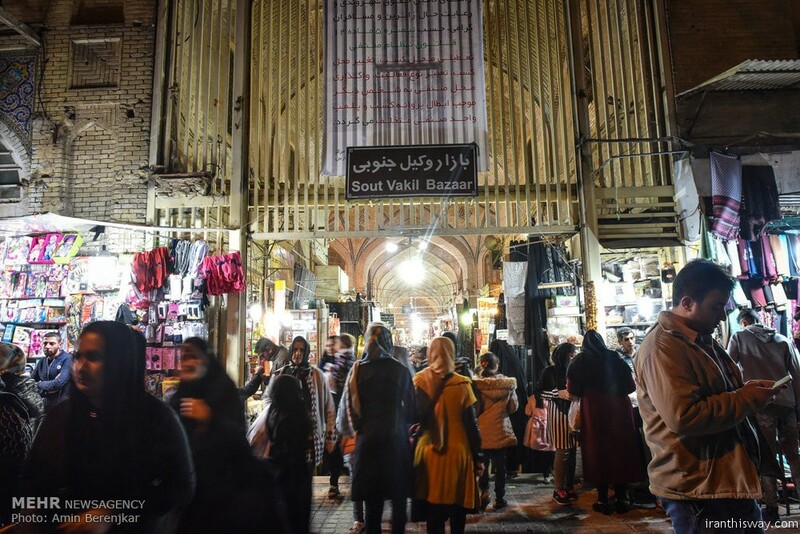 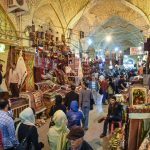 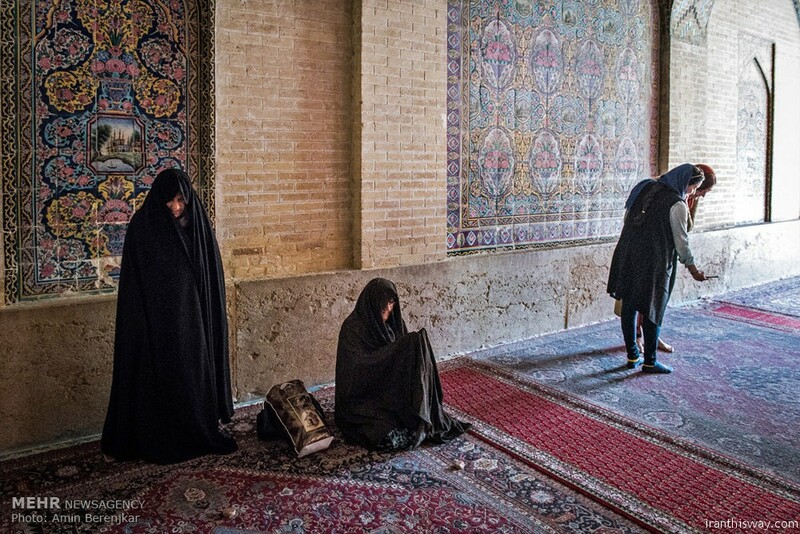 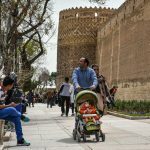 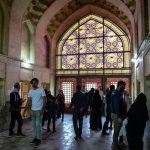 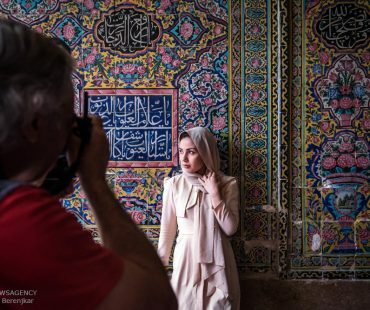 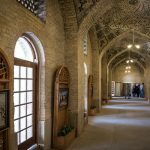 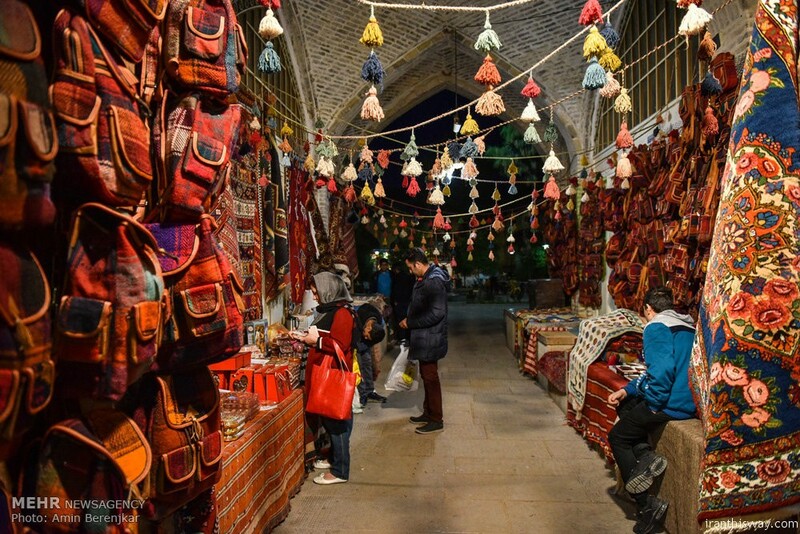 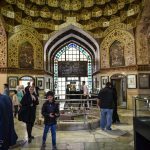 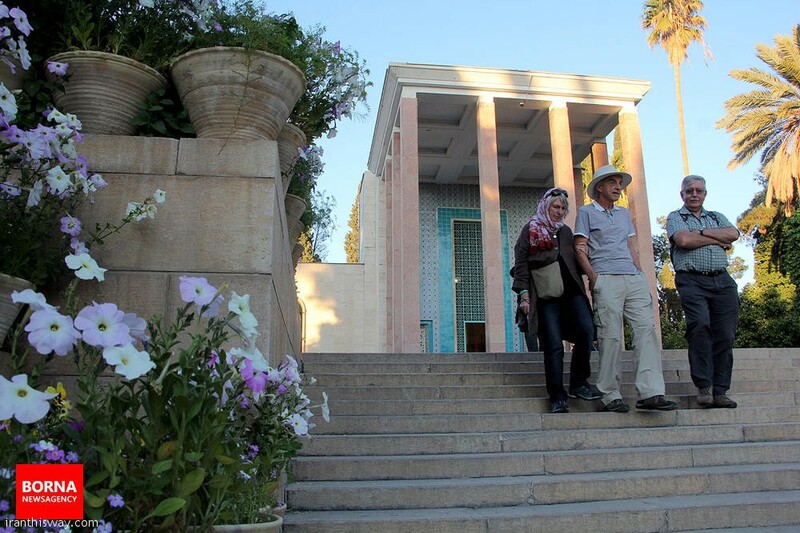 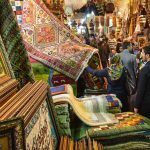 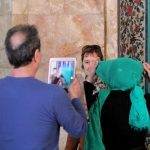 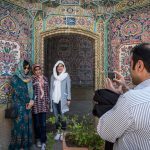 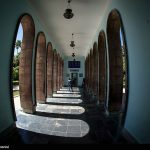 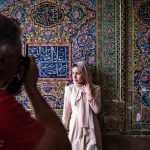 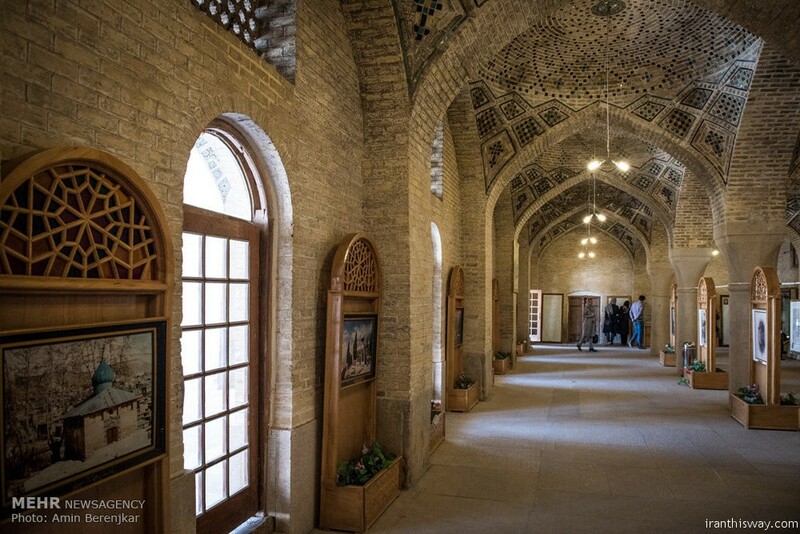 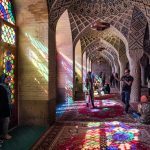 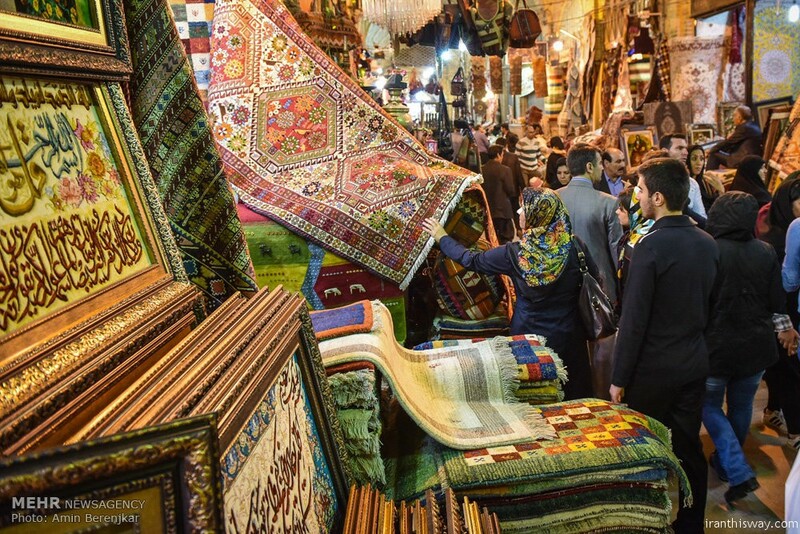 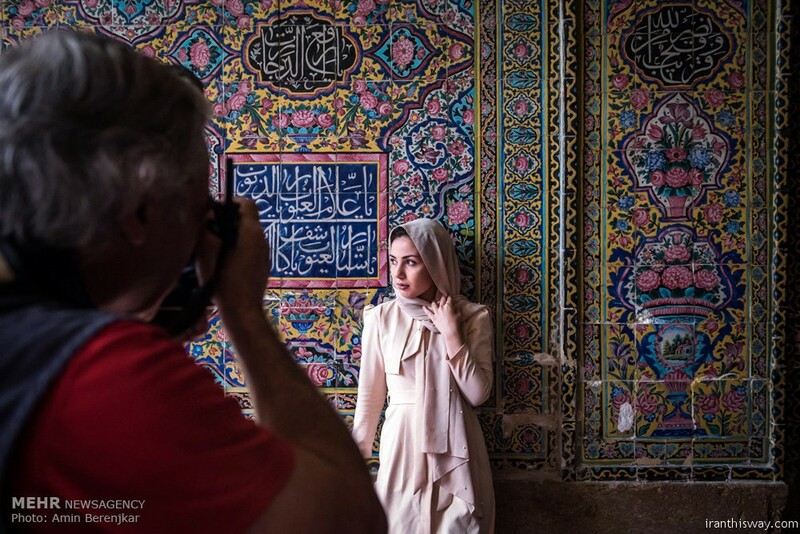 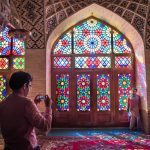 You searched for shiraz - IRAN This Way: Become familiar with Iranian lifestyle! 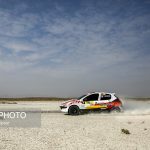 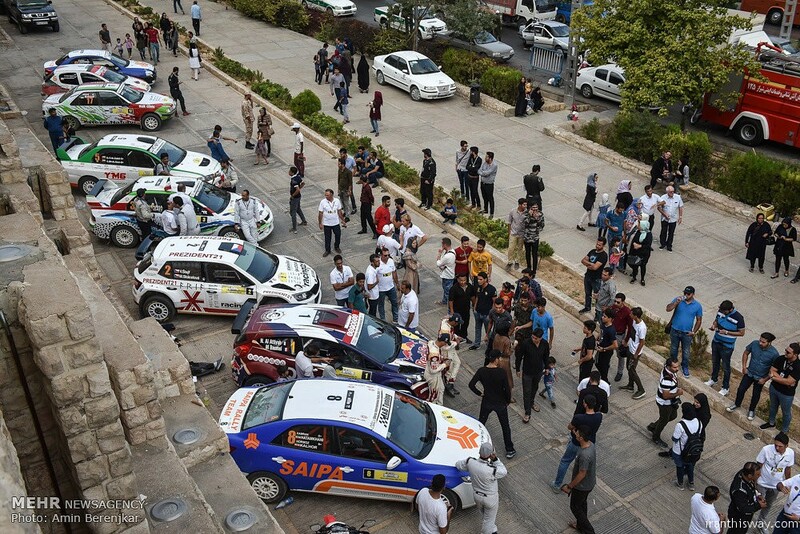 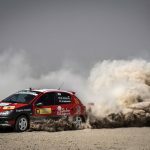 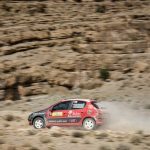 The 5th Middle East Rally Championship wrapped up on Frida with 34 domestic and foreign drivers from Iran, Czech, Oman and Qatar, competing in Shiraz, Fars province. 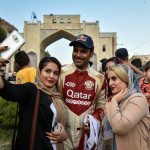 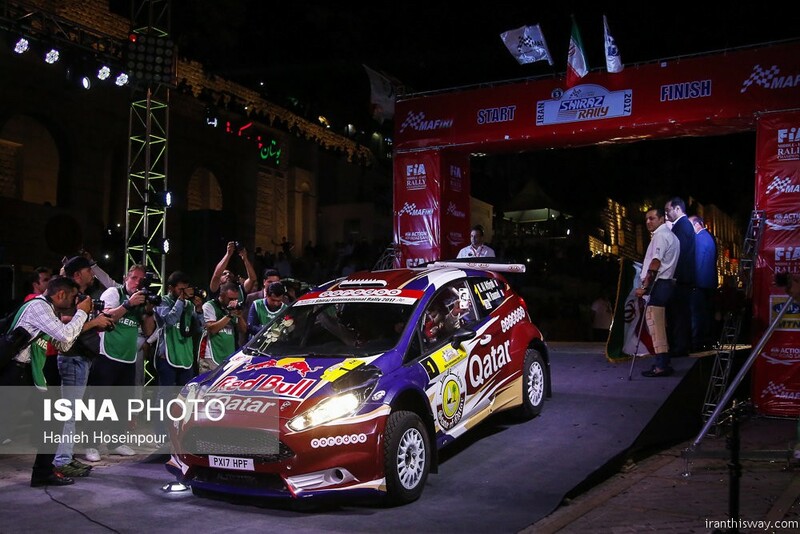 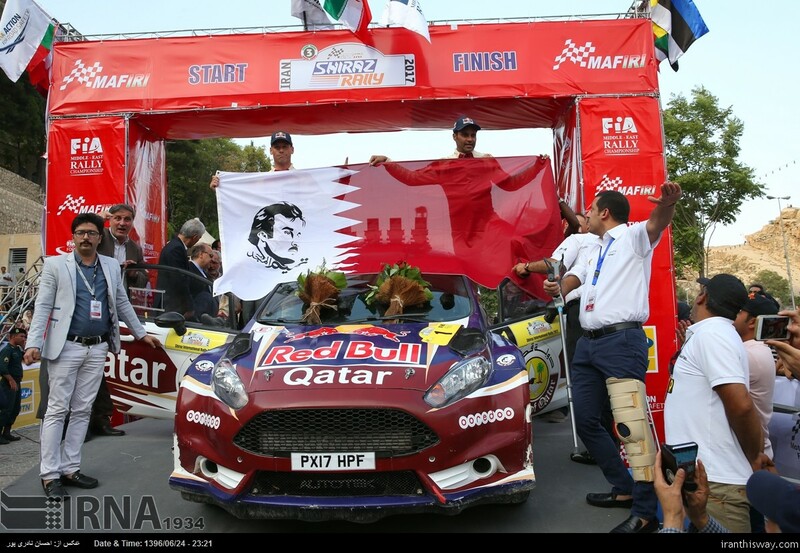 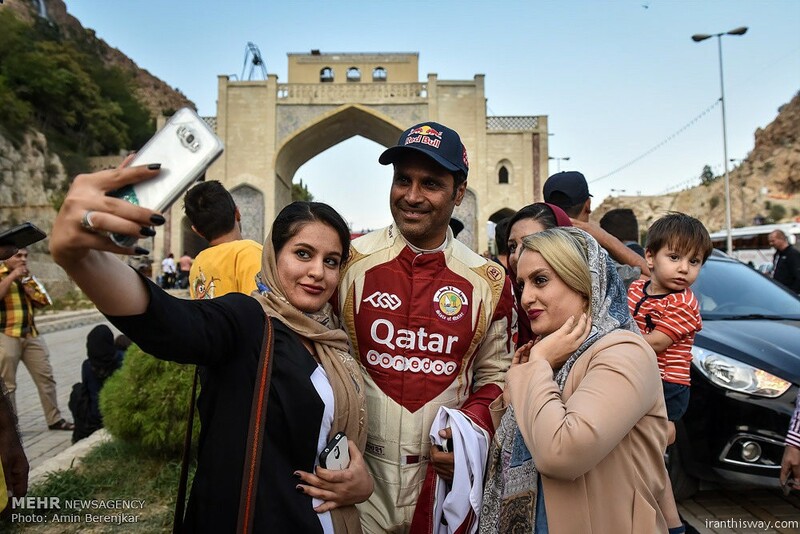 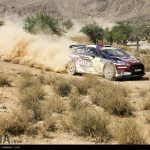 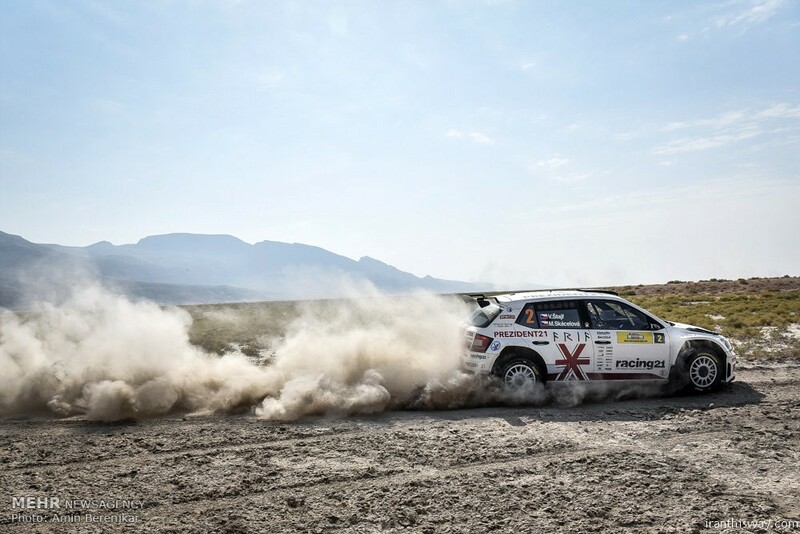 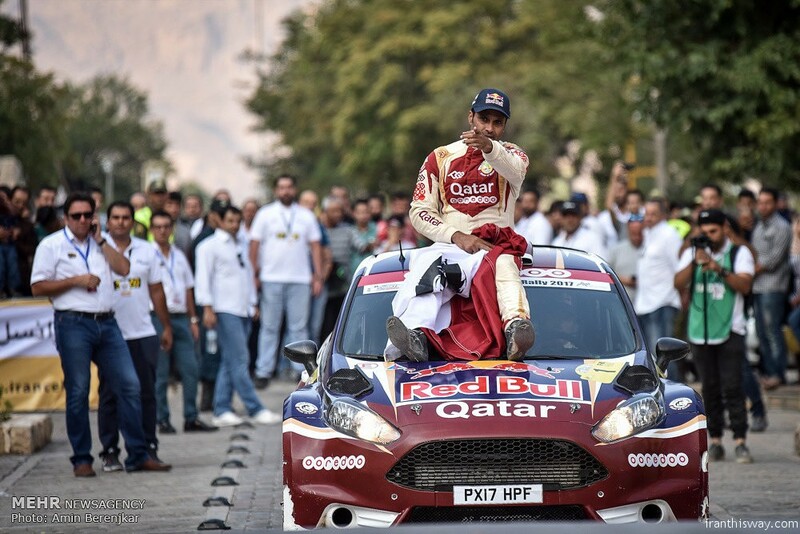 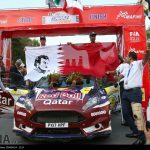 Qatari rally driver Nasser Salih Nasser Abdullah al-Attiyah has showed his class and gumption in Iran International Rally, and swept each stage of the tournament in style to claim the international event’s title. 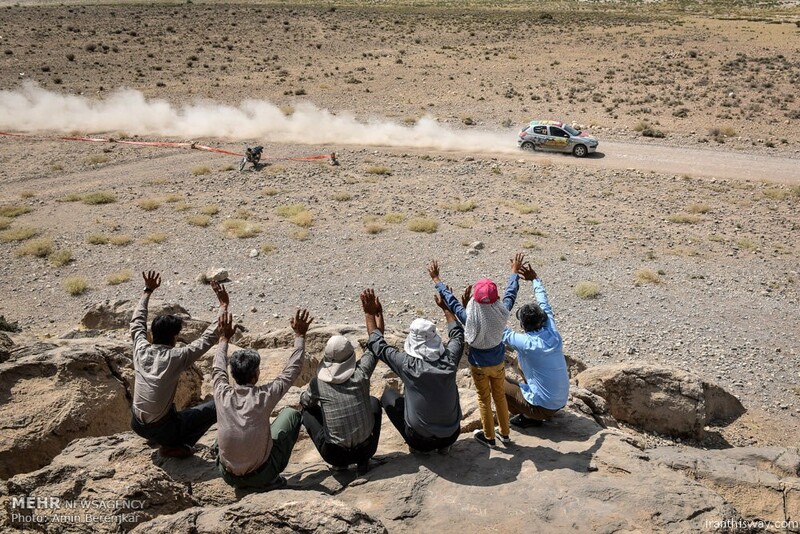 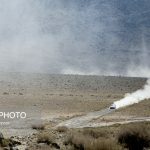 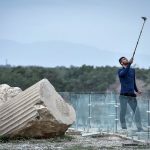 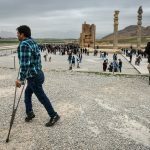 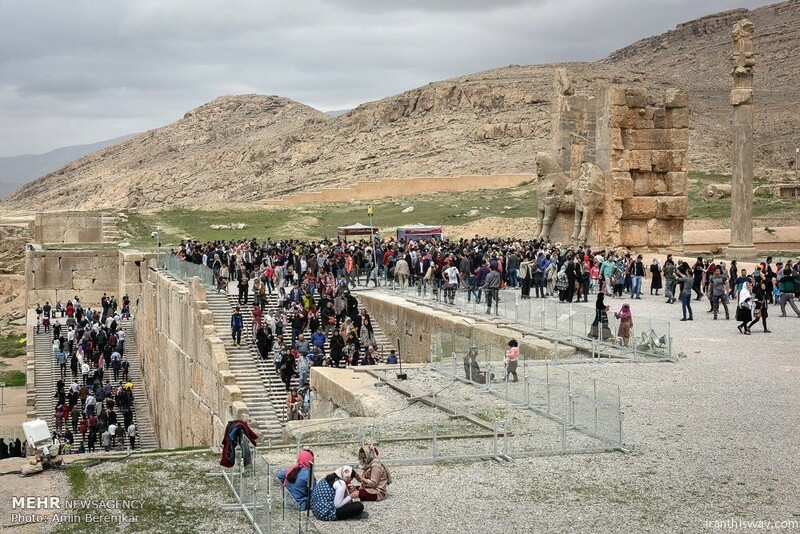 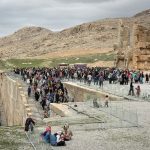 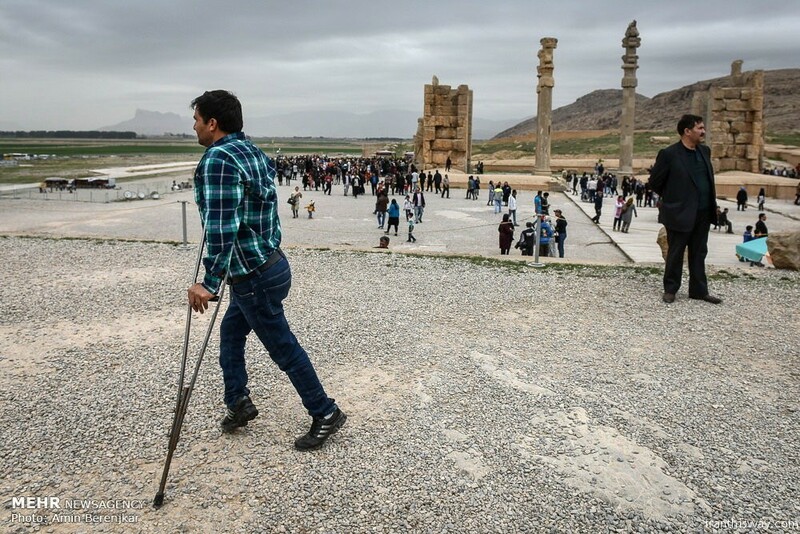 The 46-year-old and French co-driver Matthiew Baumel stormed into the lead in all phases of the cantor, and well managed to cover a distance of 720 kilometers (447.38 miles) from the ruins of Persepolis, situated 60 kilometers (37.2 miles) northeast of the city of the south-central Iranian city of Shiraz, to Kharameh city. 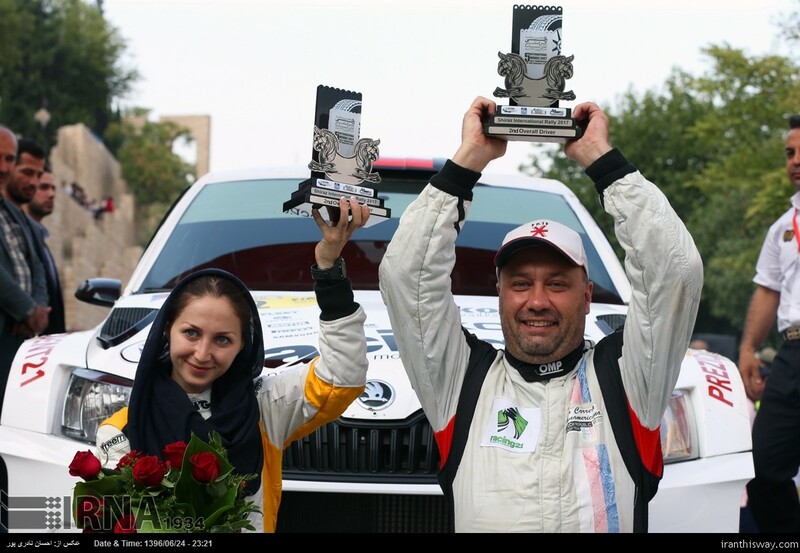 Czech drivers Vojtech Stajf and Marketa Skacelova from Spirit 21 Team took the second position. 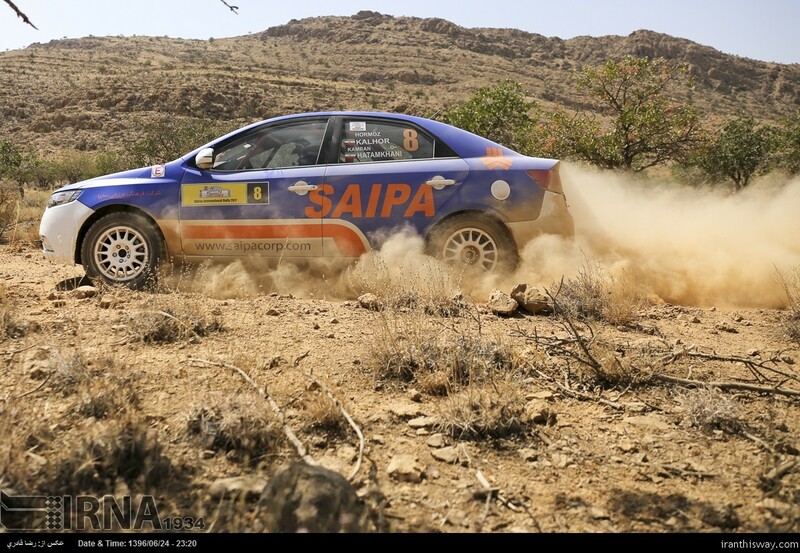 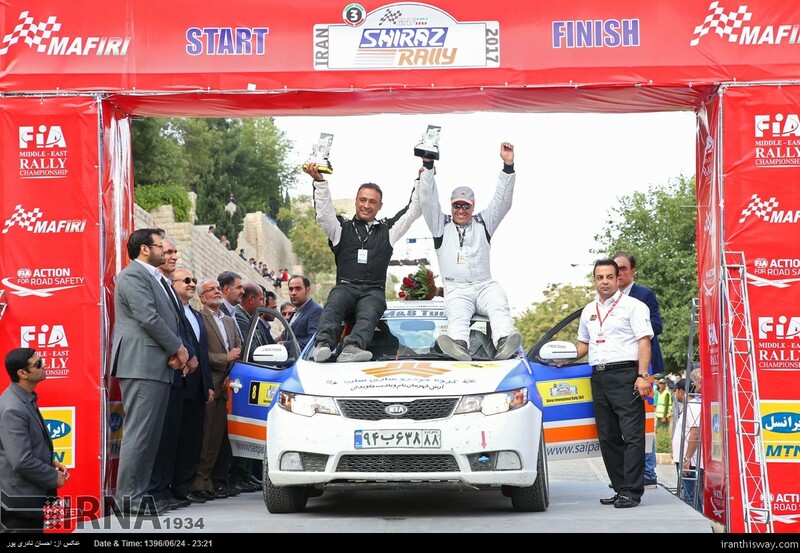 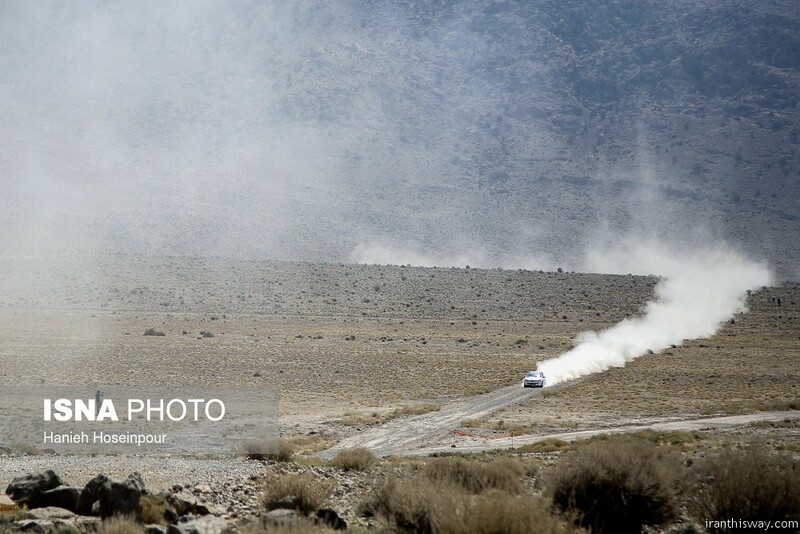 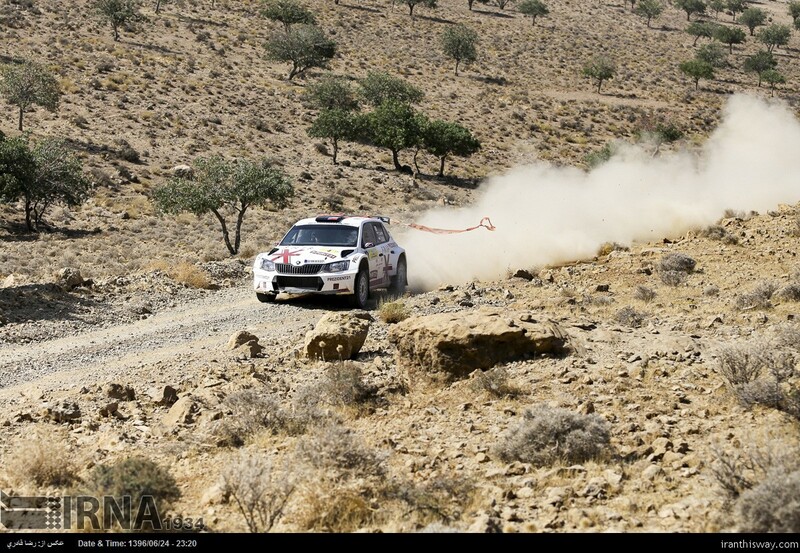 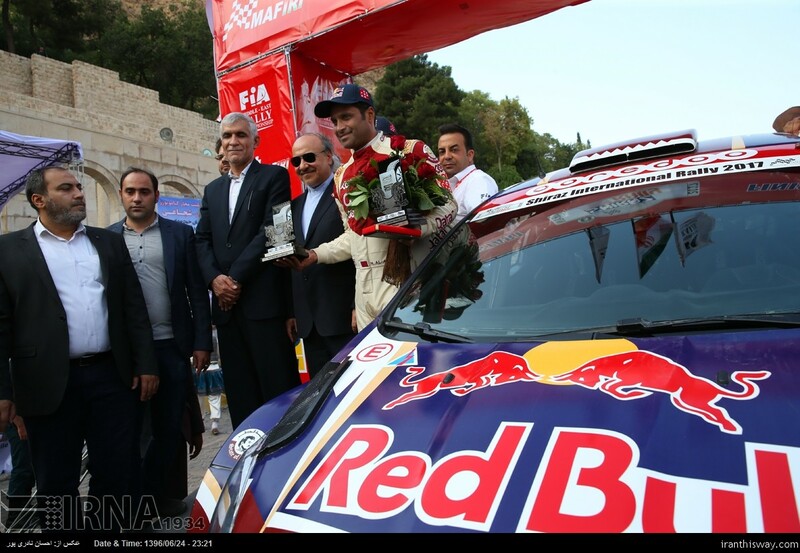 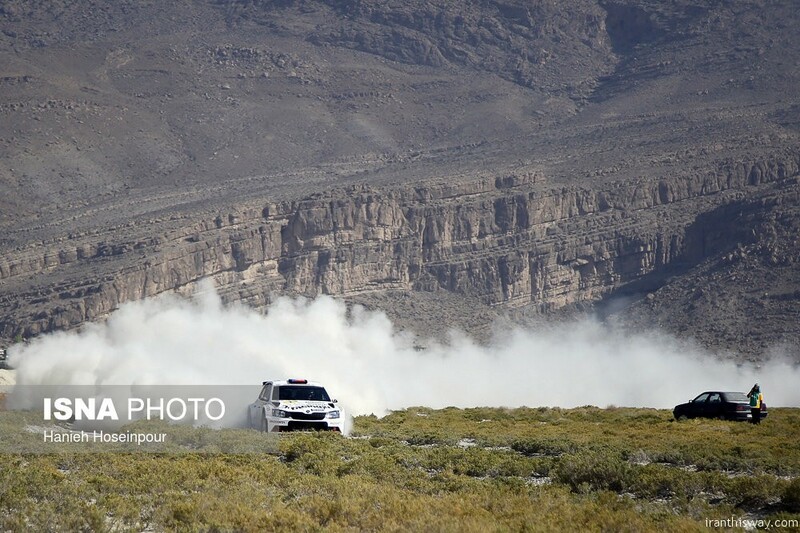 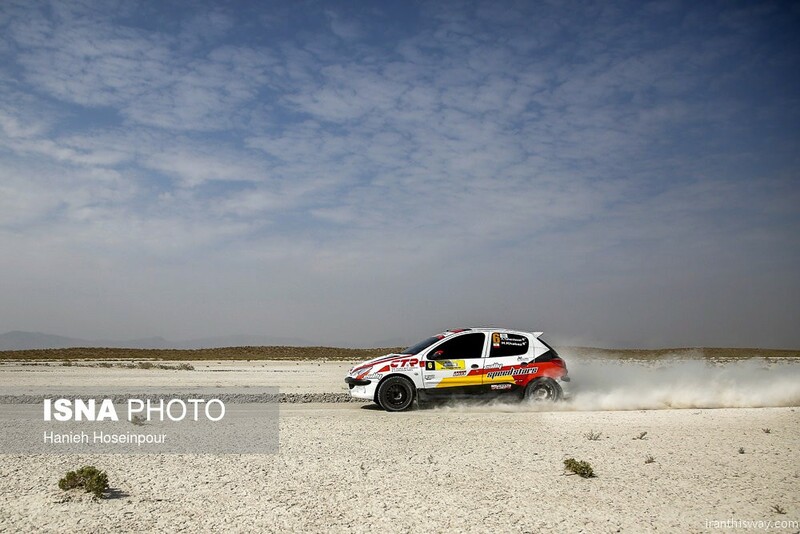 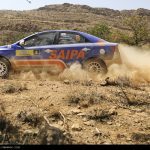 Iranian rally drivers Hormoz Kalhor and Kamran Hatamkhani (SAIPA Team) grabbed the last place on the podium. 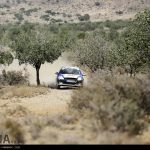 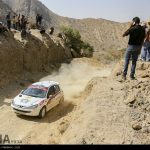 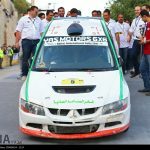 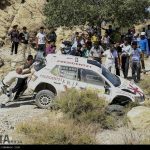 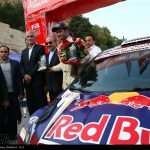 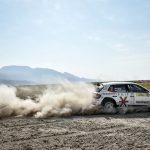 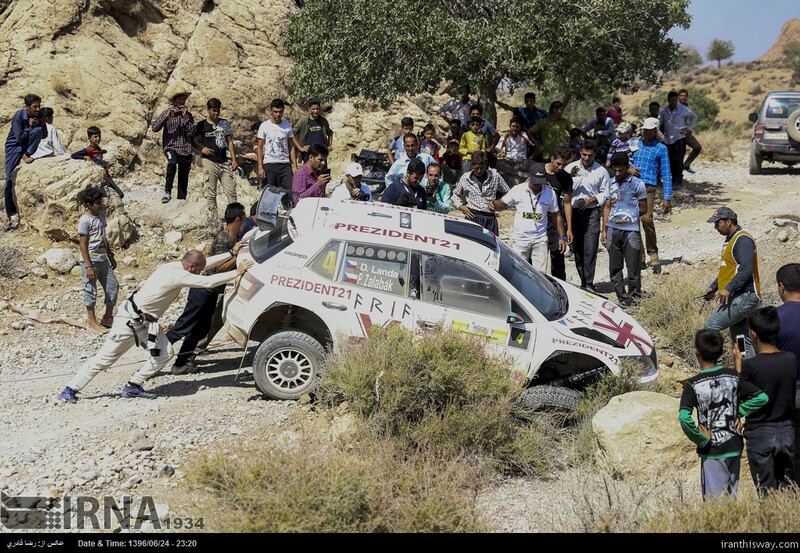 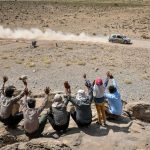 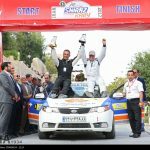 Iran International Rally kicked off on September 13, and finished on September 15, 2017. 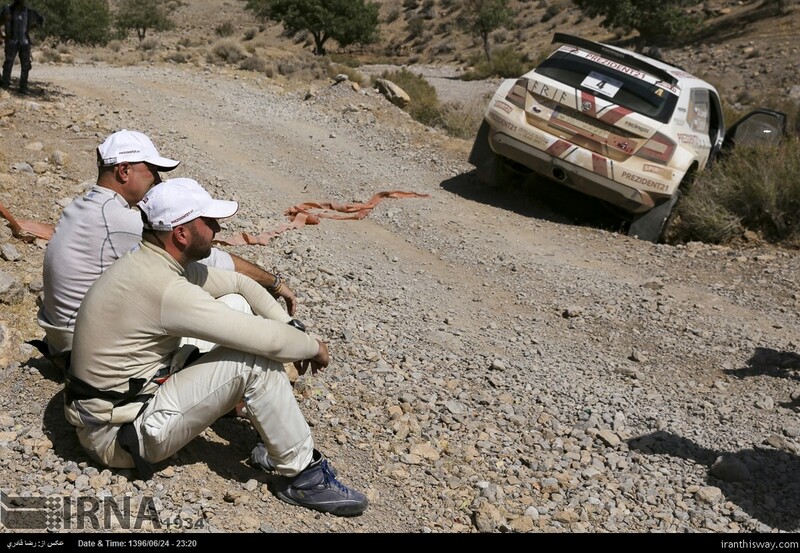 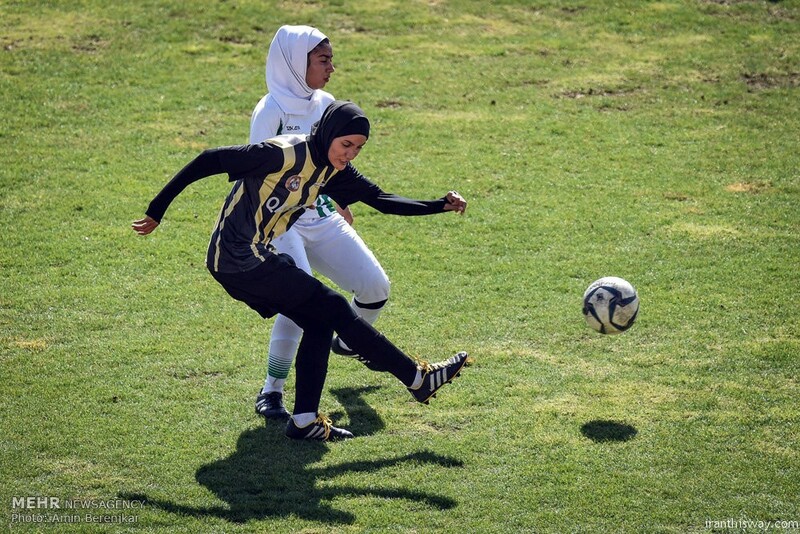 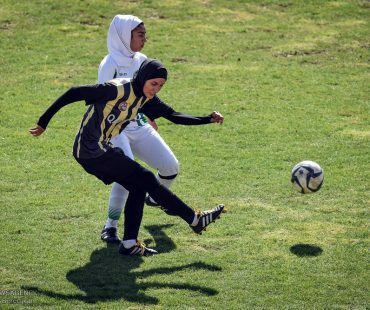 The tournament attracted rally drivers from the Czech Republic, the Islamic Republic of Iran, Oman and Qatar. 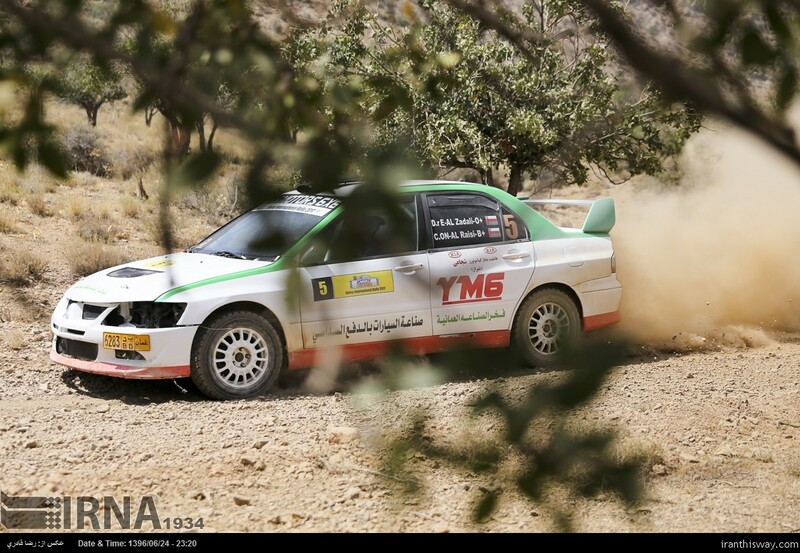 The Shiraz Rally (also known as Shiraz International Rally) is an international rally racing event held at Persepolis, near Shiraz, the capital of the Fars Province in the Islamic Republic of Iran. 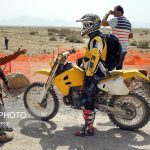 The rally is a gravel and sand event run by the Motorcycle and Automobile Federation of the Islamic Republic of Iran (MAFIRI). 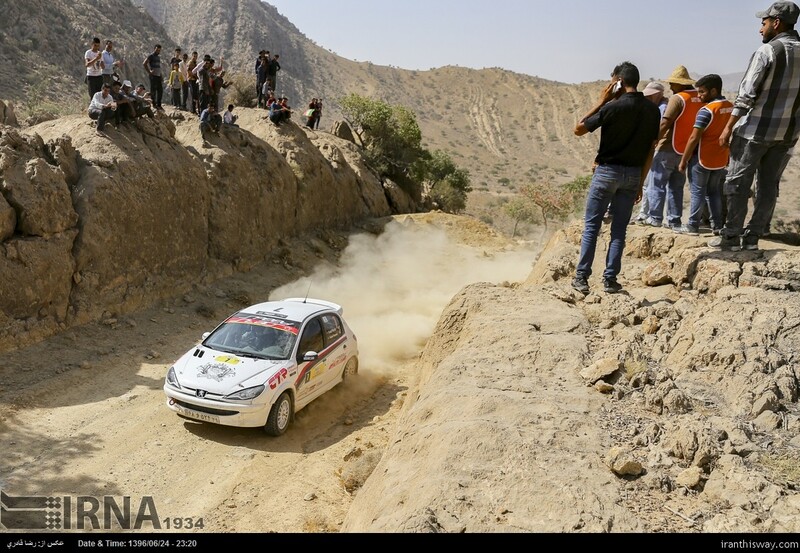 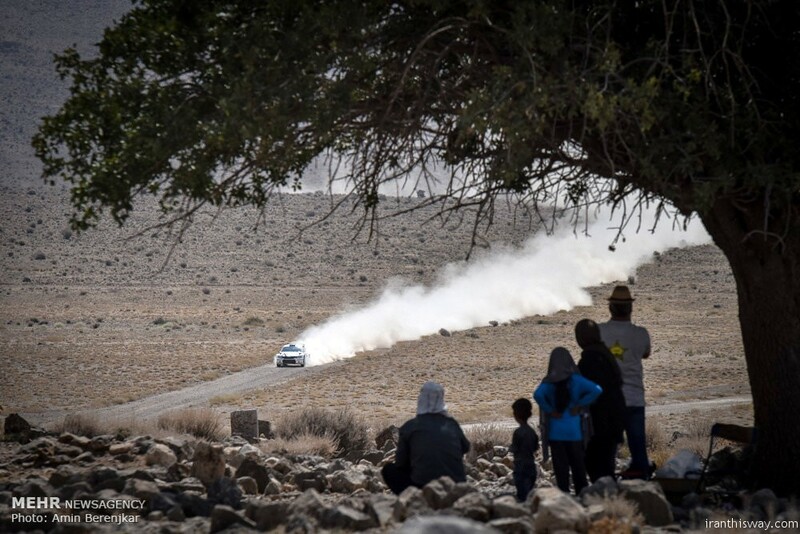 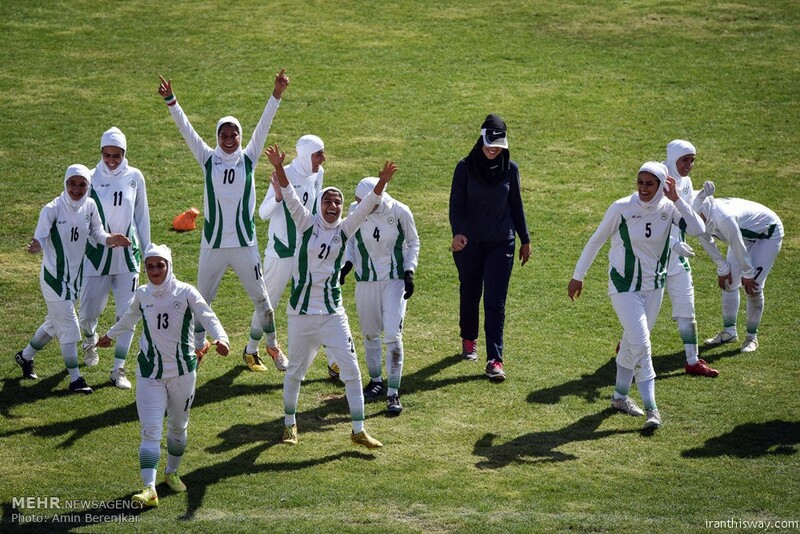 The event was first held as a candidate event in 2014 before becoming a round of the Middle East Rally Championship (MERC) in 2015.The rally is the first international motorsport event to be held in Iran since the 1979 revolution. 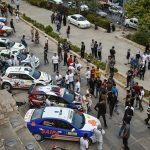 The first event, held in September 2017, attracted approximately 30 entries, mostly locally based Peugeots and Kias. 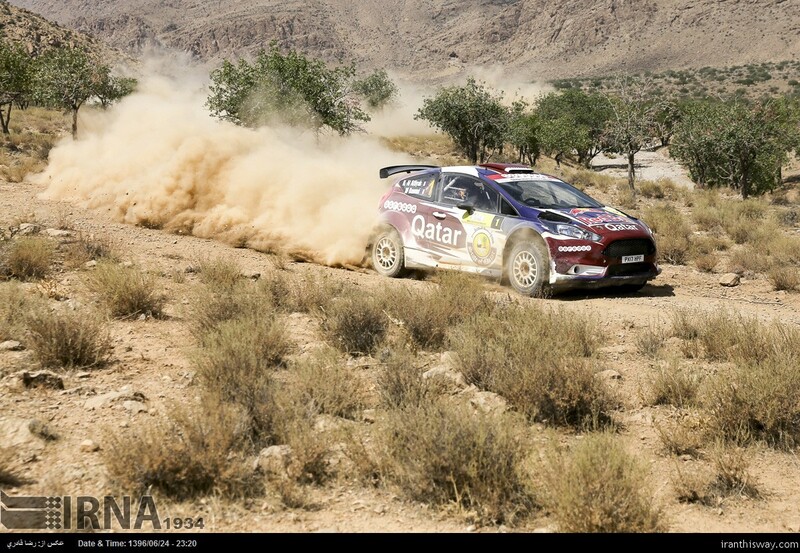 It was won by Lebanese driver Roger Feghali with the only other international team, Qatari driver Khalifa Al-Attiyah second. 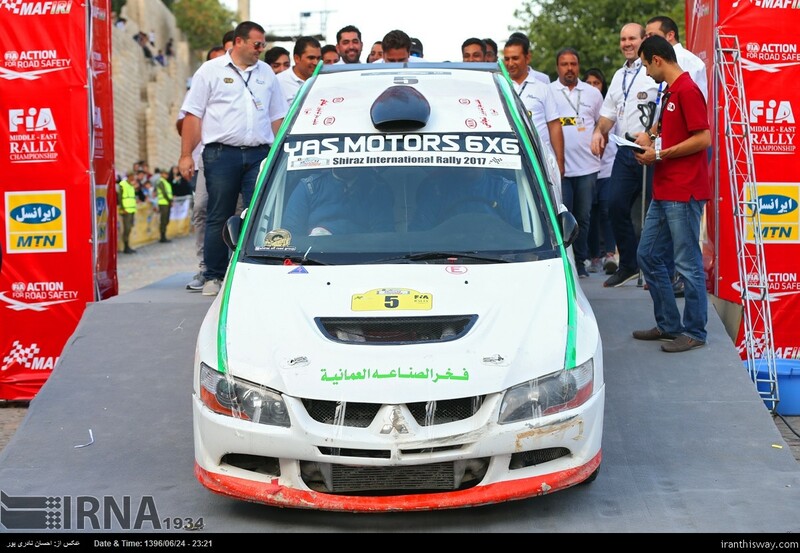 Both teams ran Mitsubishi Lancer Evolutions. 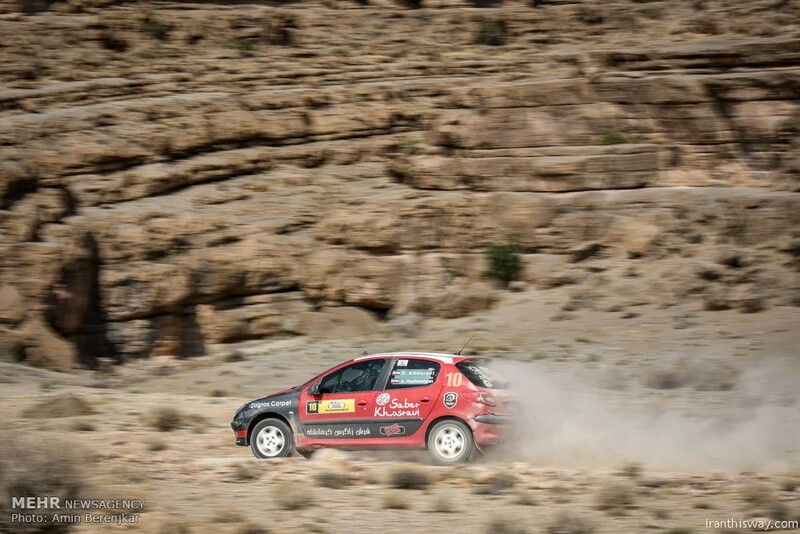 Twelve other teams finished, all bar two of them Peugeots. 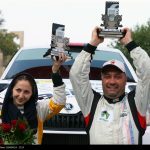 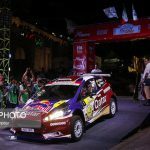 The rally had been cut short after an accident resulted in the death of Iranian co-driver Arash Ramin Yekta. 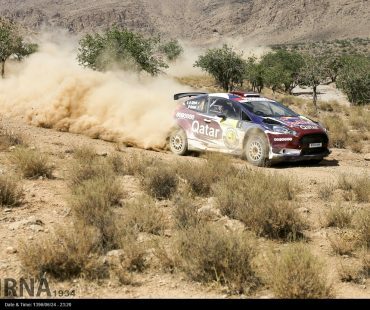 The first MERC rally, held less than eight months later, was won by defending champion Nasser Al-Attiyah ahead of countryman Abdulaziz Al Kuwari and Emirati driver Khalid Al Qassimi. 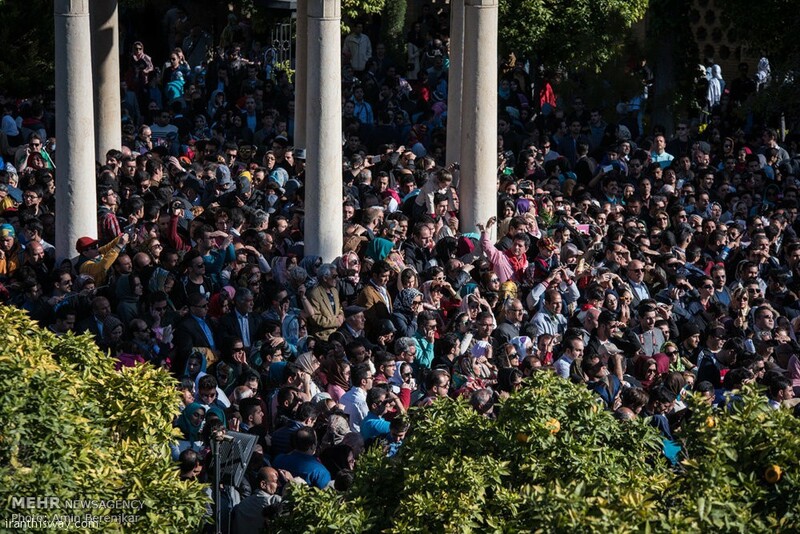 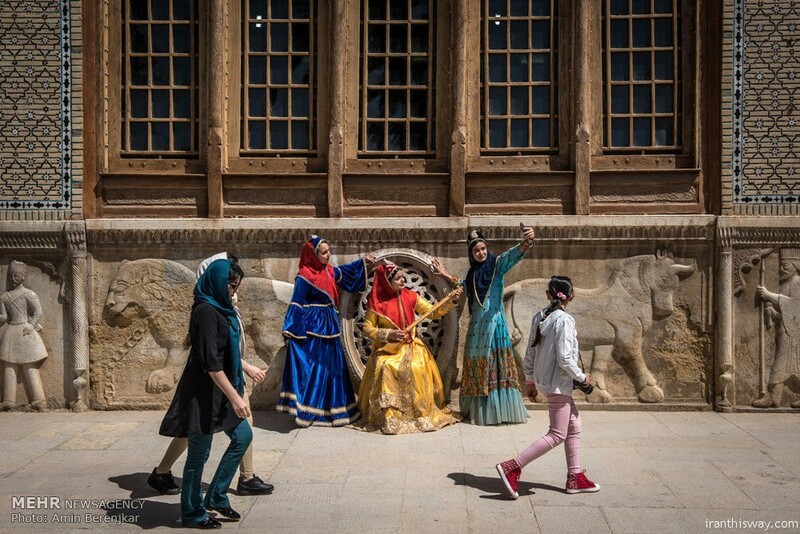 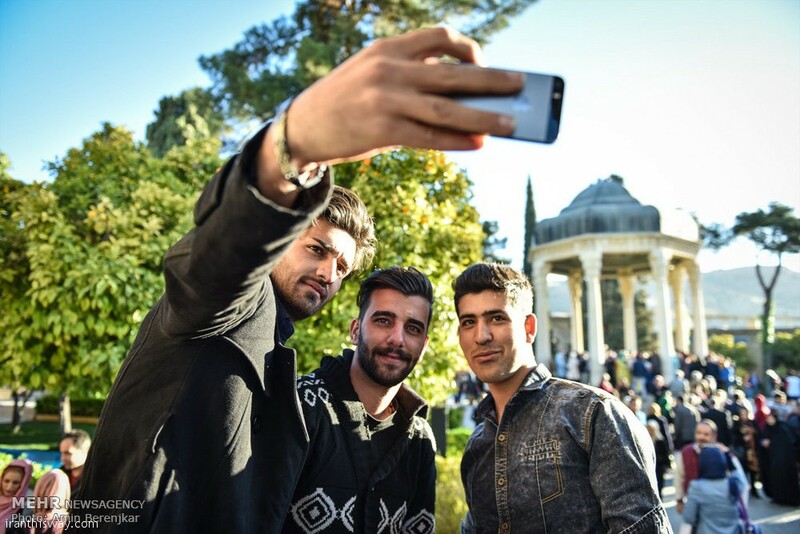 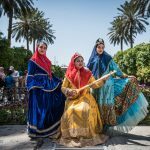 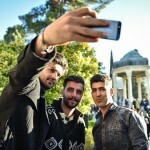 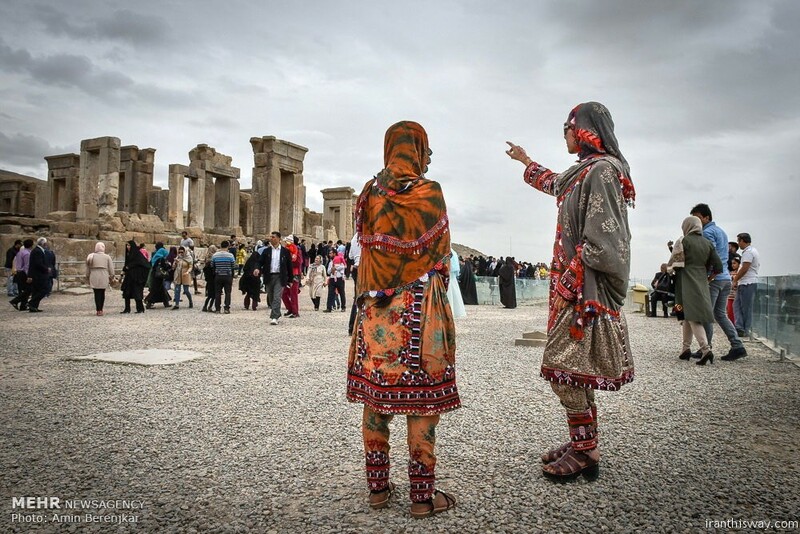 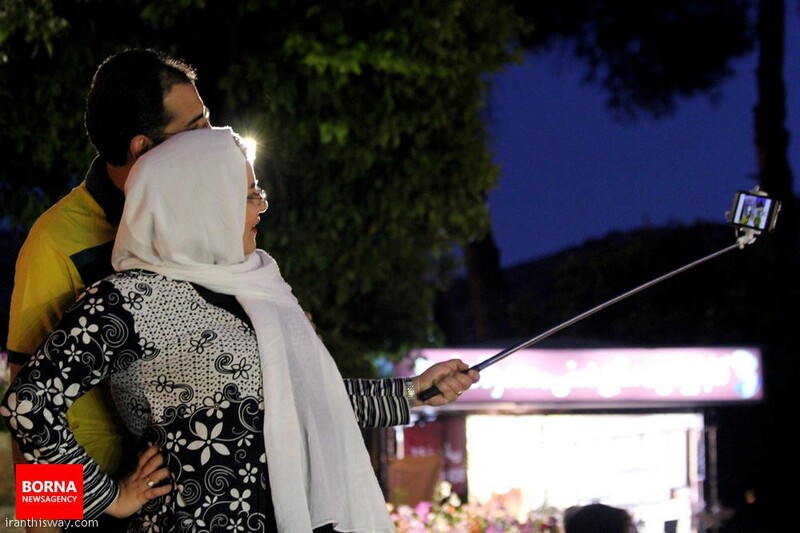 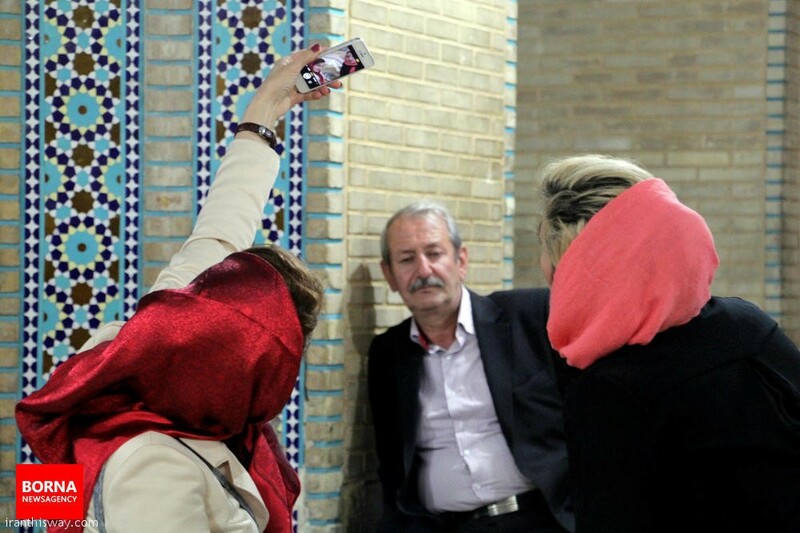 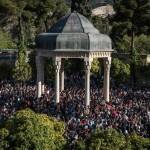 The Iranians come to Shiraz for celebrating Nowrouz. 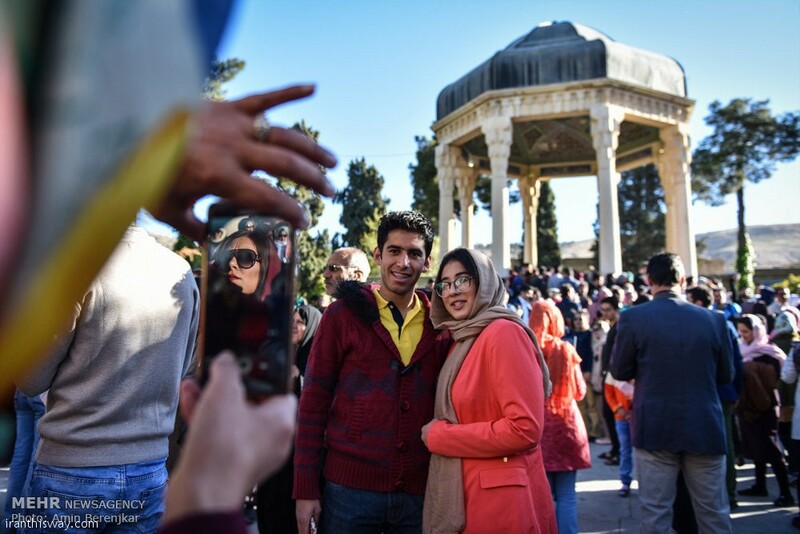 Some people say that it’s the 5,774th time that Iranians across the world are celebrating the ancient Persian New Year festival, Nowruz. 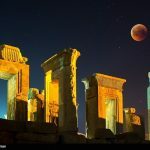 However, some history experts believe that Nowruz has been enshrined and observed for more than 15,000 years, well before the official establishment of the Persian Empire. 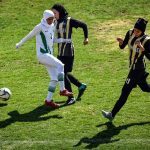 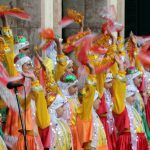 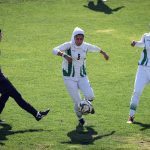 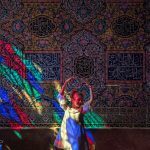 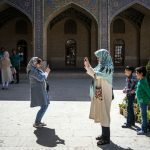 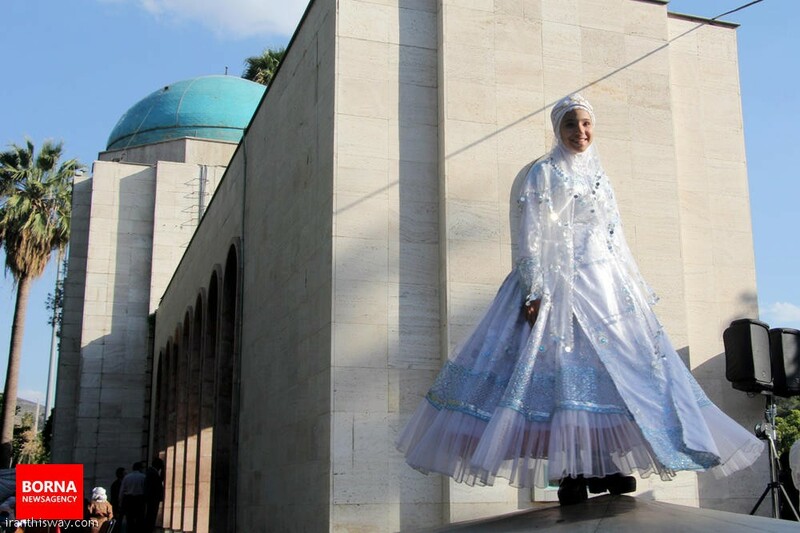 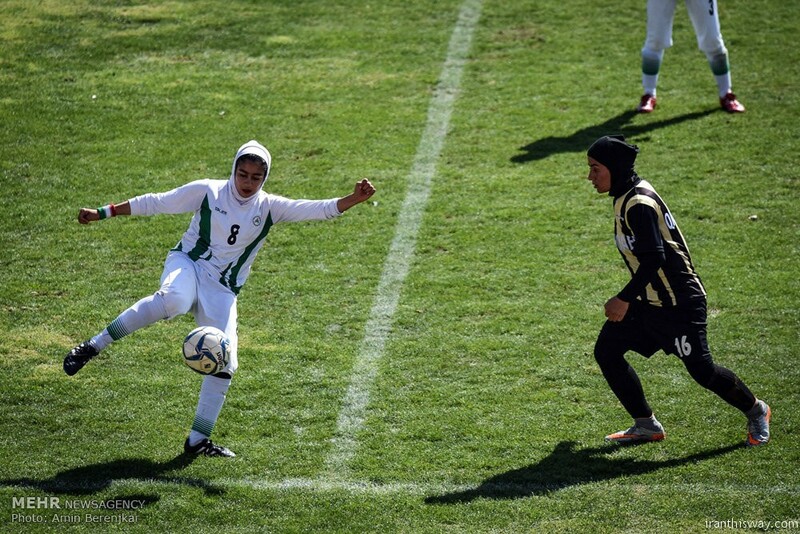 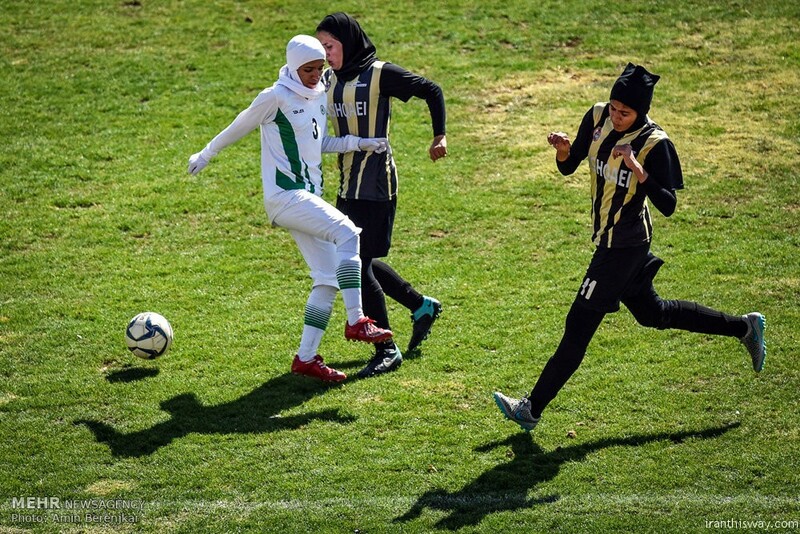 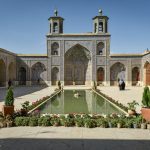 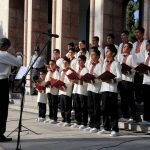 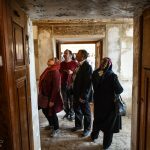 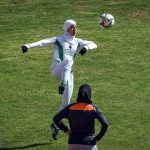 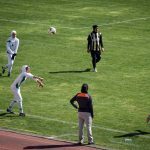 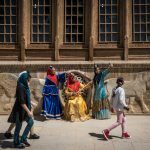 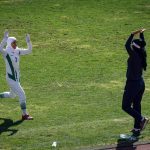 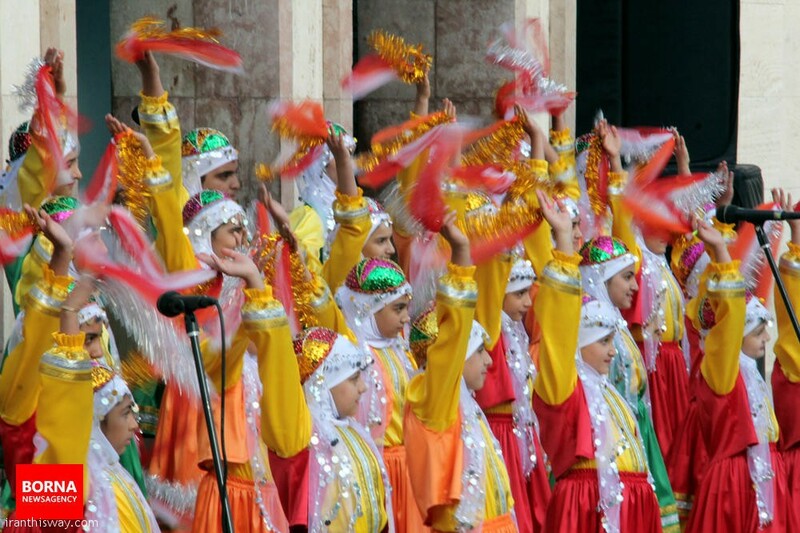 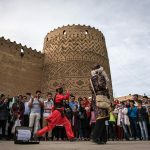 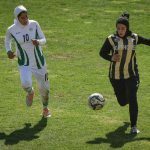 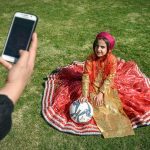 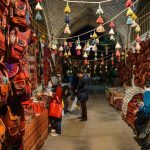 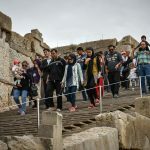 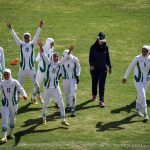 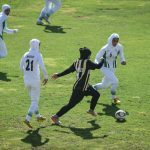 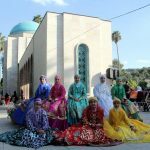 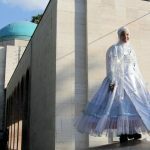 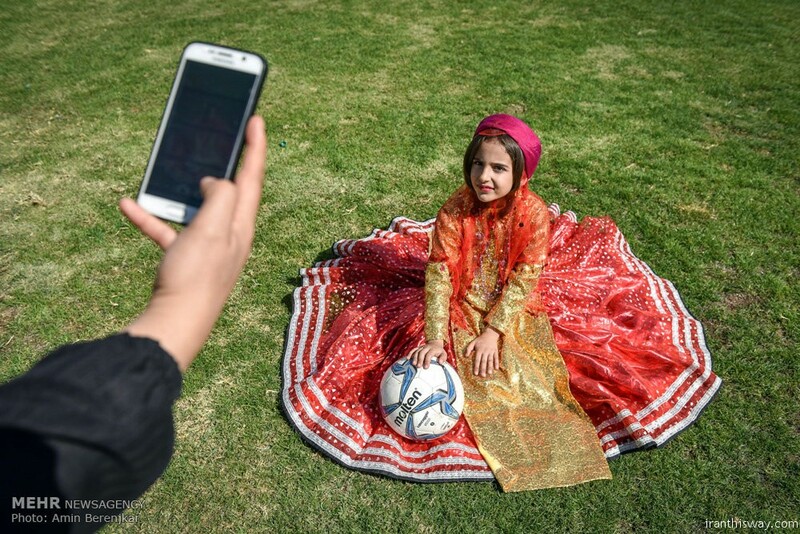 Like Christmas, Nowruz is an elaborate festival that brings millions of people together, but there are certain elements in Nowruz that make it a distinctive tradition, and one of these important elements is its historicity. 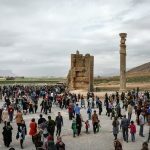 Cyrus the Great, the first king of the Persian Empire, came to throne in 550 BC, but for almost 2000 years before him, when In-Su-Kush-Siranna was the ruler of the Kingdom of Aratta, Nowruz had been celebrated in Greater Iran, which consisted of several provinces that currently constitute modern countries like Afghanistan, Tajikistan, Turkmenistan, Azerbaijan, Armenia, Pakistan, Iraq, and parts of India and Turkey. 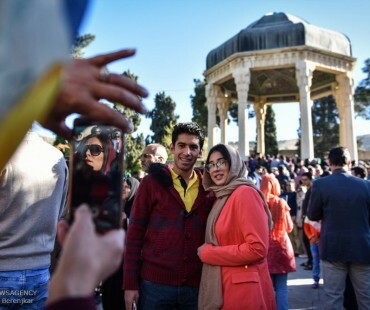 HaftseenNowruz is considered the most important national holiday in Iran as it marks the beginning of a new solar year and the arrival of spring. 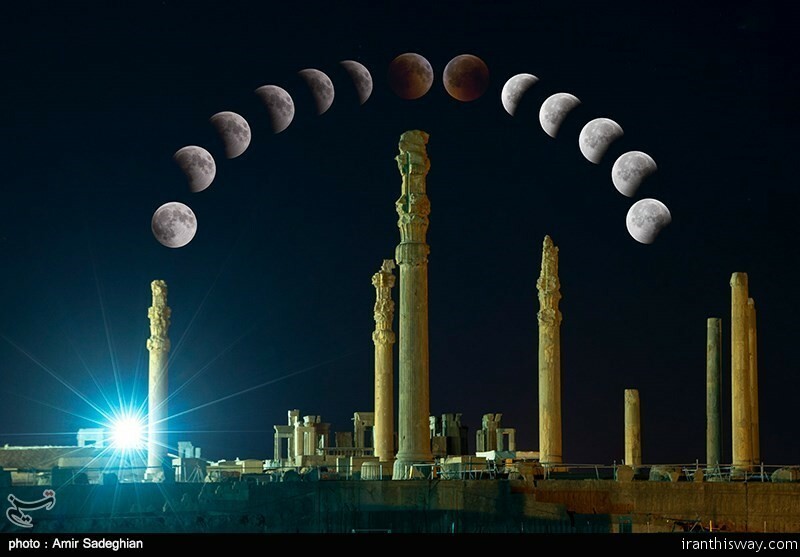 According to the Persian calendar, Nowruz begins on the vernal equinox, which starts on March 20 or 21. 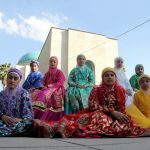 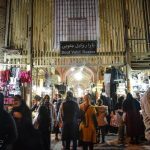 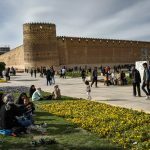 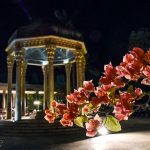 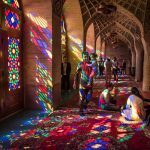 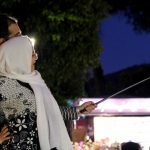 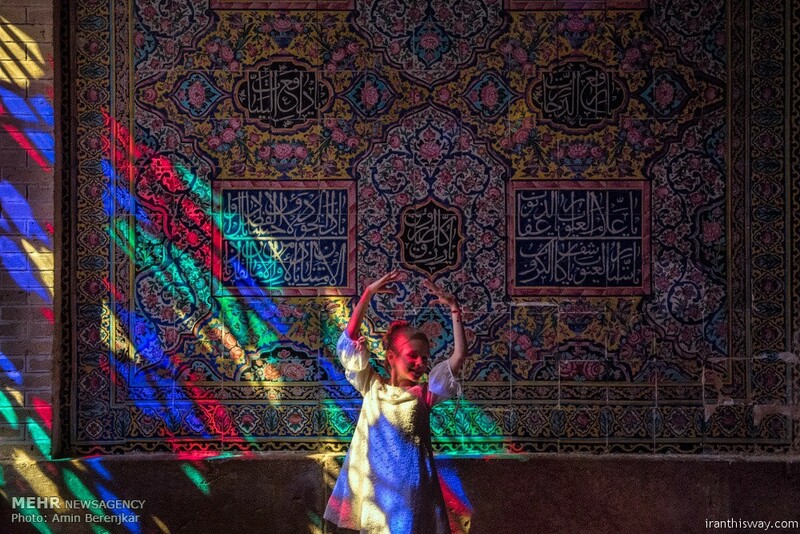 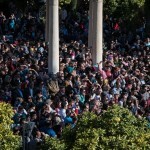 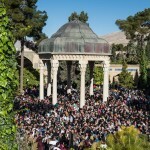 The beauty and wonderfulness of Nowruz is that it starts on a unique moment each time and people excitedly and breathlessly wait for the announcement of what is known as the moment of the transition of the year. 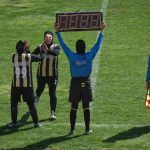 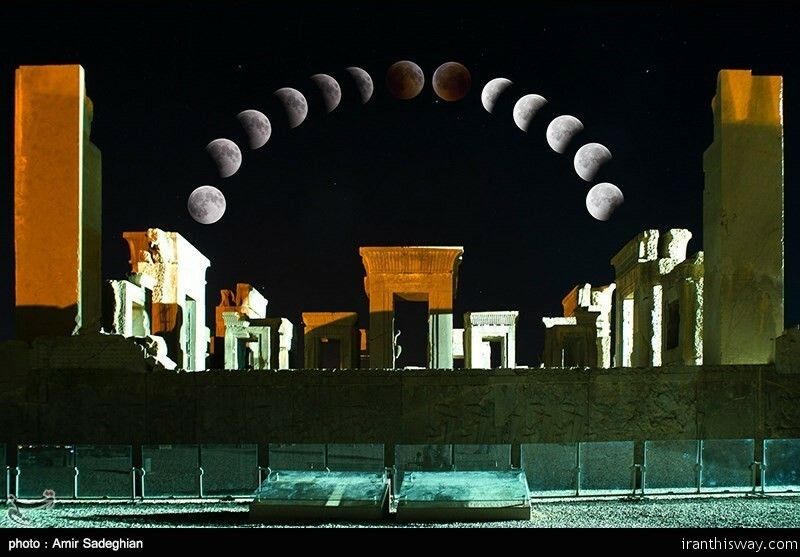 This moment is astronomically calculated according to the Jalali solar calendarand officially inaugurates the New Year. 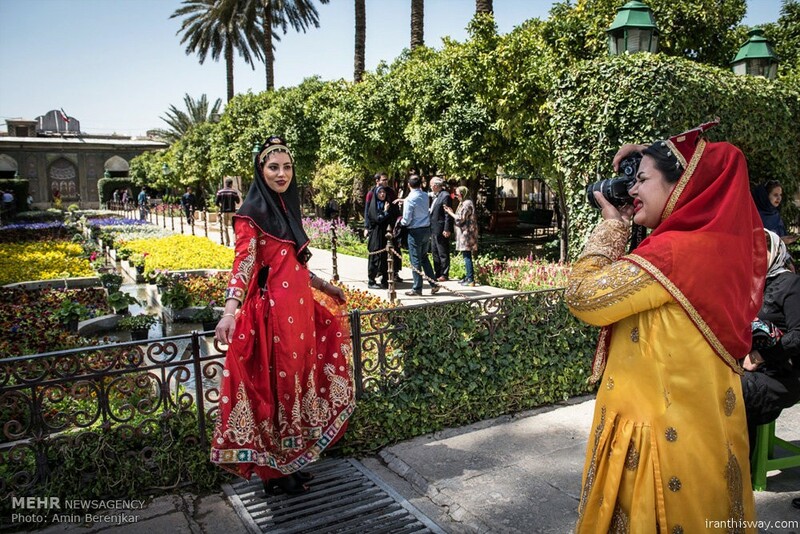 Unquestionably, Nowruz is one of the prominent hallmarks of the Persian culture and Iranian civilization. 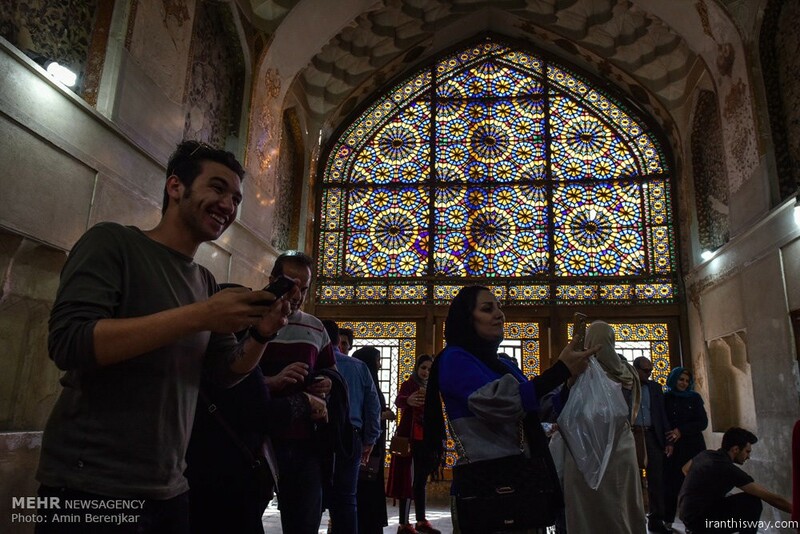 It represents the glory and magnificence of ancient Iran and manifests a sense of national pride and dignity for Iranians around the world. 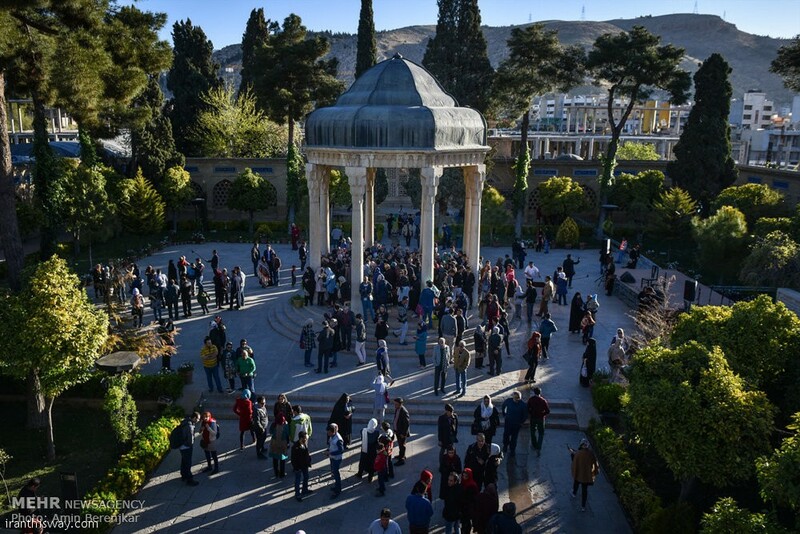 In his long epic poem, Shahnameh, the 10th century Iranian poet and philosopher Ferdowsi talks in detail about the origins and roots of Nowruz. 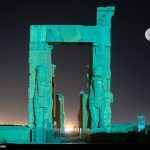 He says that when the legendary, prehistoric Iranian king Jamshid Jam conquered the world and ascended the throne, he declared that day as Nowruz and the beginning of Iranian New Year. 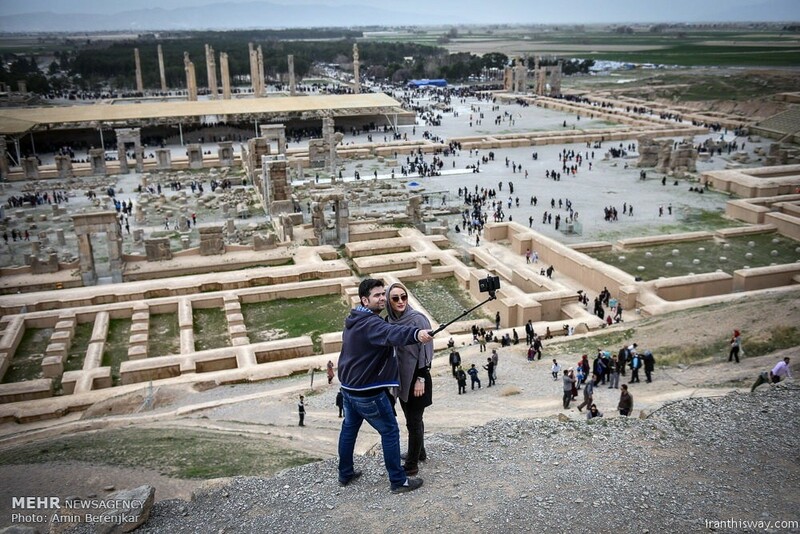 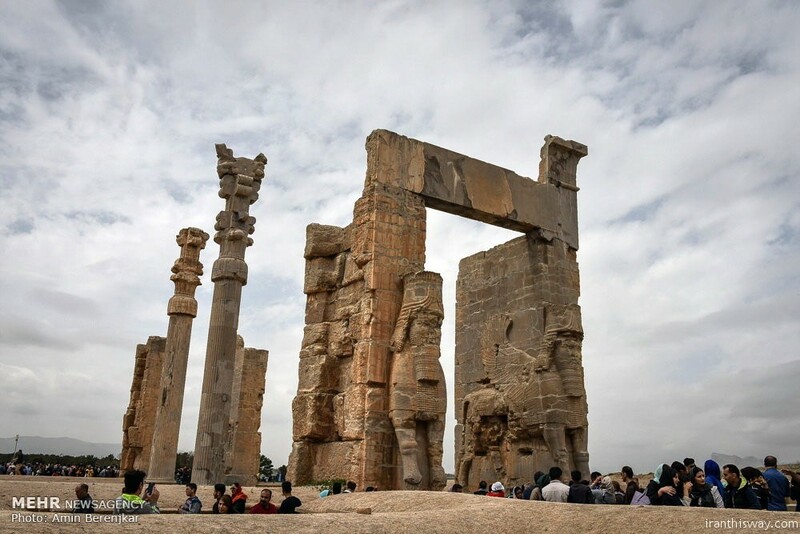 On that day, Iranians from across the country would come to visit Persepolis (the ancient capital of the Persian Empire) to hold festivals, receive rewards and gifts from the king, enjoy eating festive meals of dried nuts, fruits, and sweetmeat, sing happy songs, and perform plays. 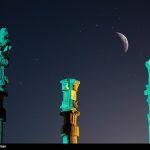 Nowruz is important in that it comes as winter ends, and that is why Iranians believe Nowruz is a feast of rebirth and rejuvenation that injects fresh and warm blood into the veins of the frosty and frozen nature. 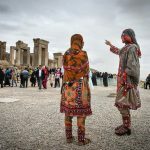 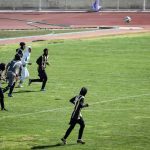 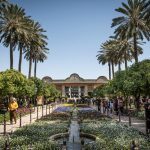 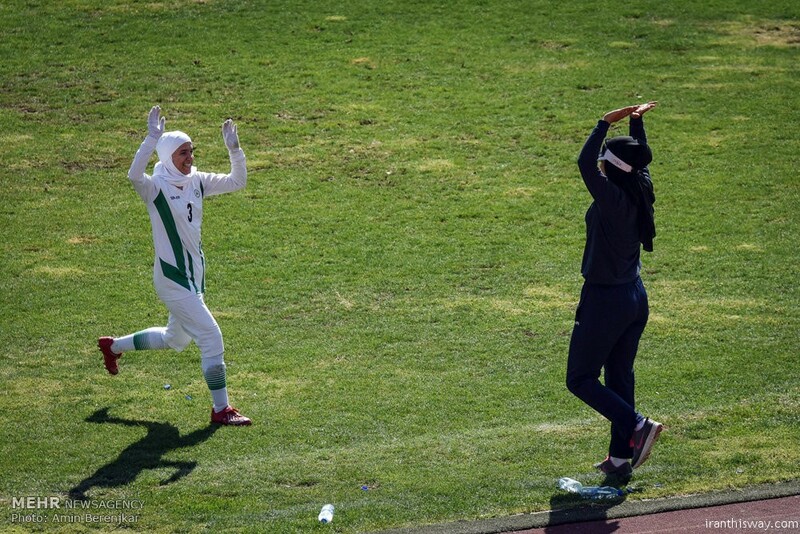 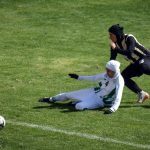 Iran, which is famous for its climatic diversity and unique nature, is very beautiful in the spring, and especially during the 13 days of Nowruz festivals. 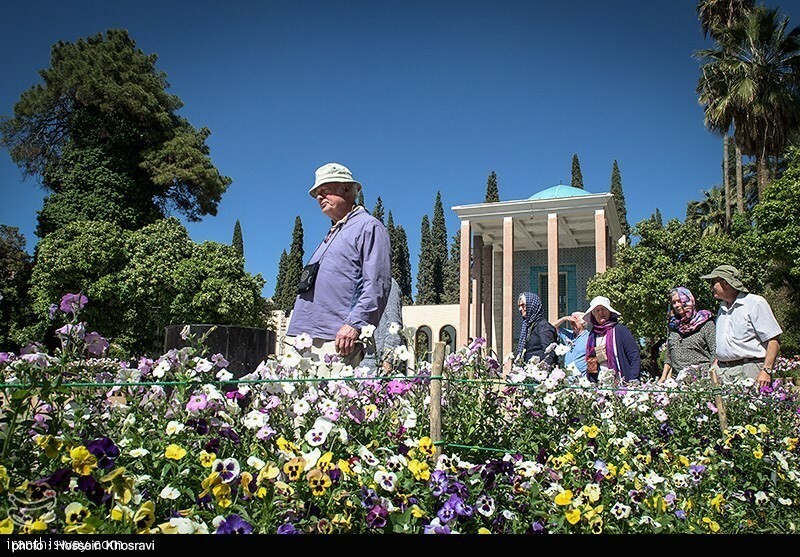 Fragrant flowers and attractive plants grow in large quantities in northern, central, and southern parts of Iran, and the weather is predominantly mild and moderate in the majority of the cities all around the country. 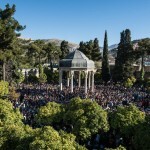 Nowruz is celebrated from the Farvardin 1 to 13 (Farvardin is the first month of the solar calendar whose name is taken from the Zoroastrian word “Faravashis” meaning “the spirits of the dead.” Iranians believe that the spirits of their deceased beloved ones will return to the material world in the last 10 days of the year.) 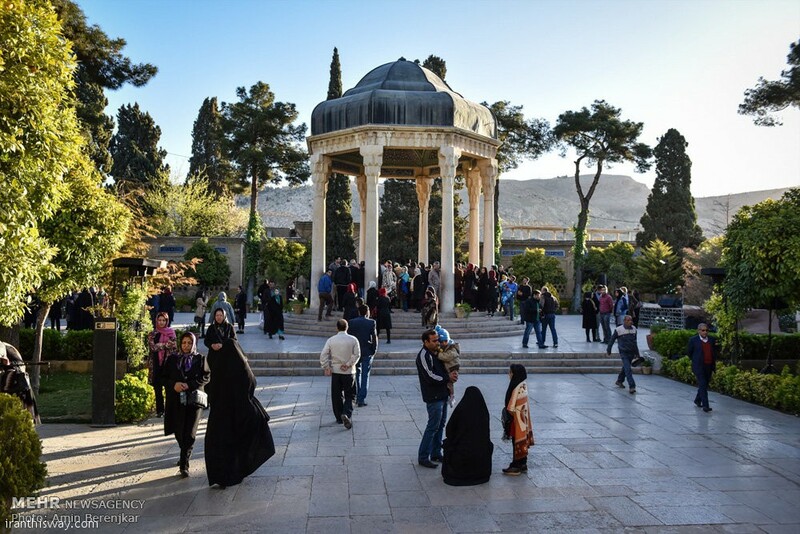 One of the common traditions of Nowruz that the Iranians are strongly committed to is paying visit to the elderly and meeting the other members of the family. 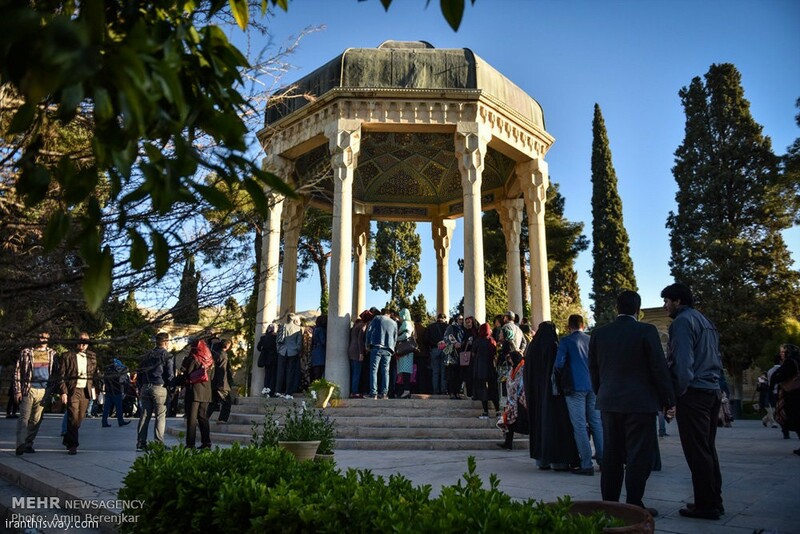 In such meetings, Iranian families entertain each other with delicious Iranian cuisines, spring fruits, dried nuts, candies, confections, deserts, rice-cakes, pastries, and cookies. 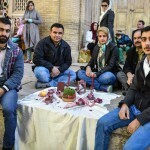 Setting the “Haft-Seen” table is also one of the customs of Nowruz that is seen as a quintessential part of the New Year celebrations. 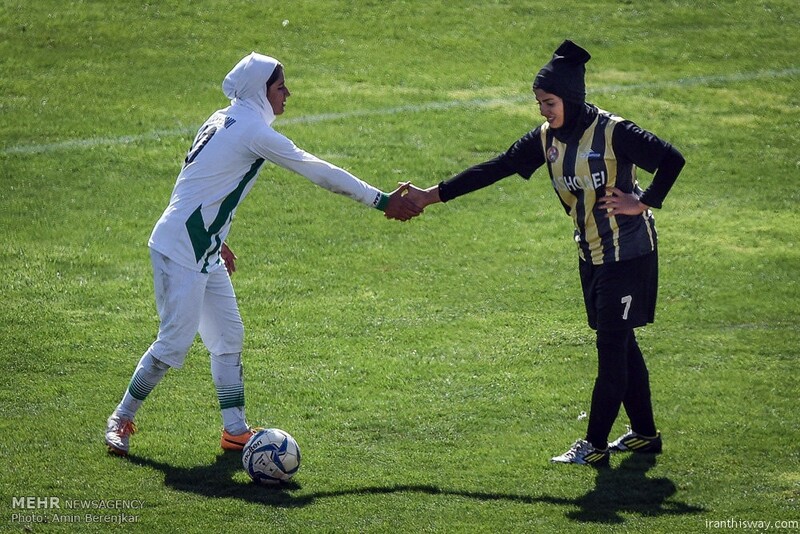 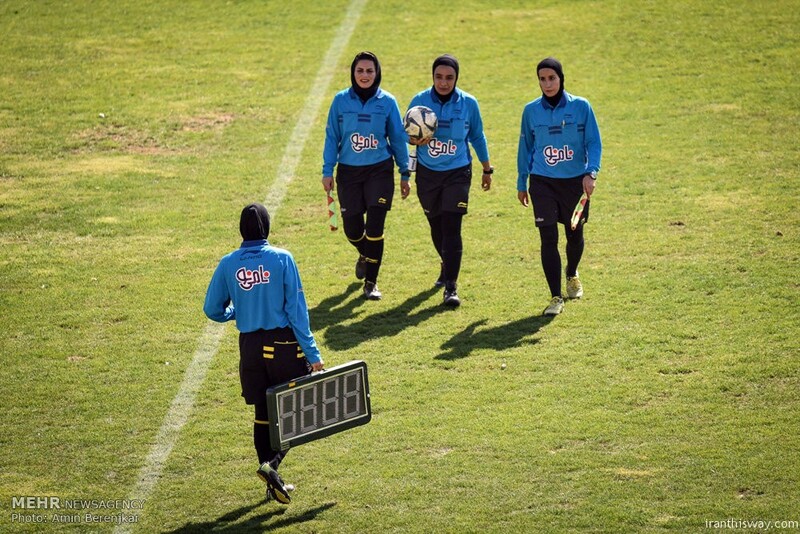 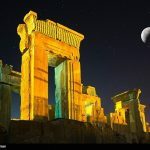 Haft means “seven” in Persian, and “seen” stands for the sign of the 15th letter of Persian alphabet which sounds “s”. 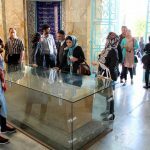 The Haft-Seen table is named so because there are seven items on this table whose name start with the Persian letter “seen”. 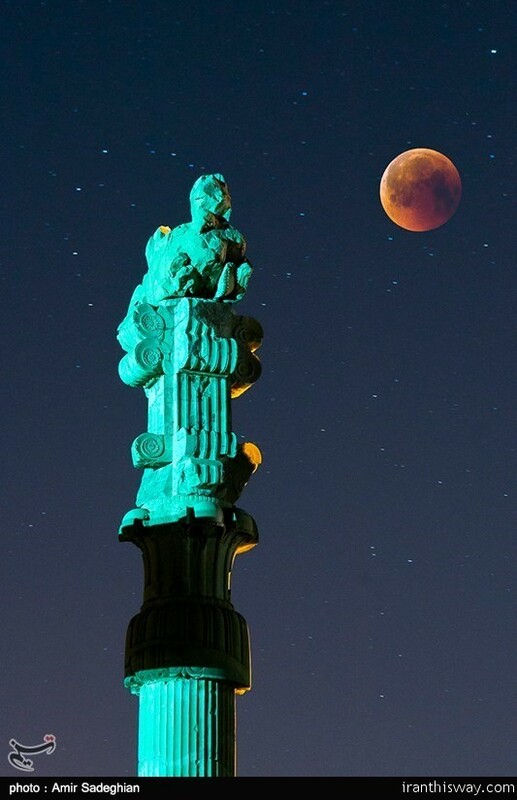 Each of these seven items signifies a certain meaning. 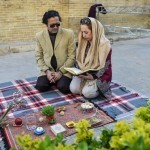 These items include “Senjed”, or silver berry, the sweet, dry fruit of the lotus tree, which denotes love and affection; “Sumaq”, or sumac, the crushed spices of berries, which symbolizes sunrise and the warmth of life; “Seeb”, or red apple, which stands for health and beauty; “Seer”, or garlic, which indicates good health and wellbeing; “Samanu”, a sweet paste made of wheat and sugar that represents fertility and the sweetness of life; “Sabzeh”, or sprouted wheat grass, which is a sign of renewal of life; and “Sonbol”, or the purple hyacinth flower, which represents prosperity and goodwill in the New Year. 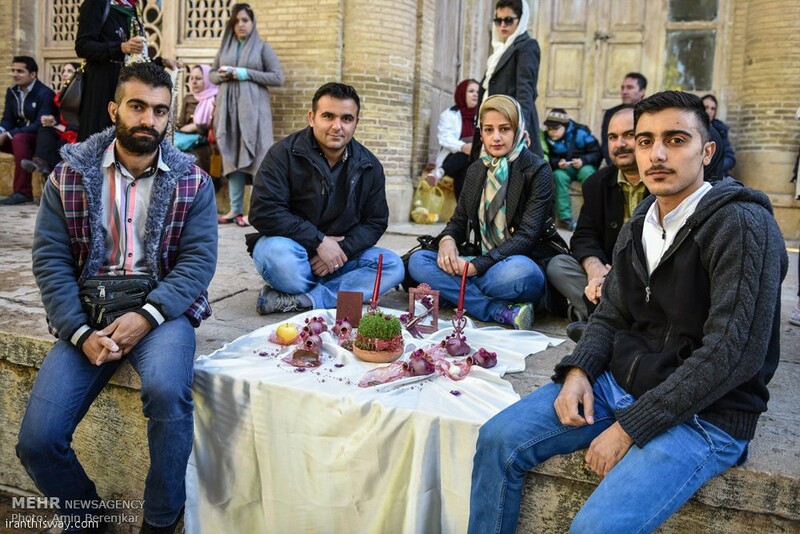 However, the majority of Iranian families put more than 7 items on their “Haft-Seen” table settings. 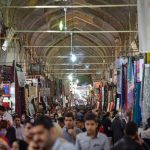 The additional things are “Sekkeh”, coins that herald wealth and affluence; “Serkeh”, vinegar that symbolizes age, patience, and the toleration of hardships; and “Sangak”, a plain whole wheat sour dough flatbread that characterizes blessing and good luck. 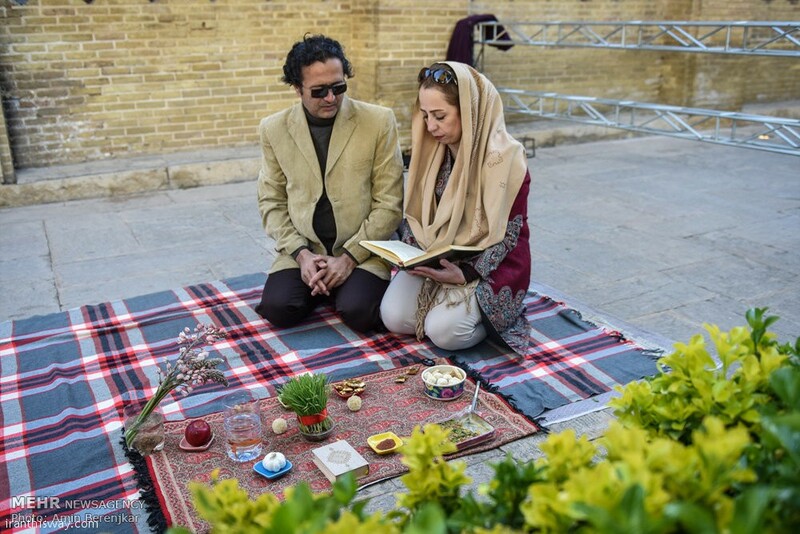 Iranians also put colored eggs and a bowl of goldfish on their traditional Haft-Seen table and consider these two elements as signs of fertility, welfare, and happiness. 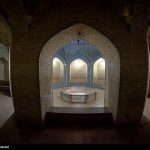 One of the other elements placed on the beautiful Haft-Seen table is a mirror, a symbol of purity, reflection, and honesty. 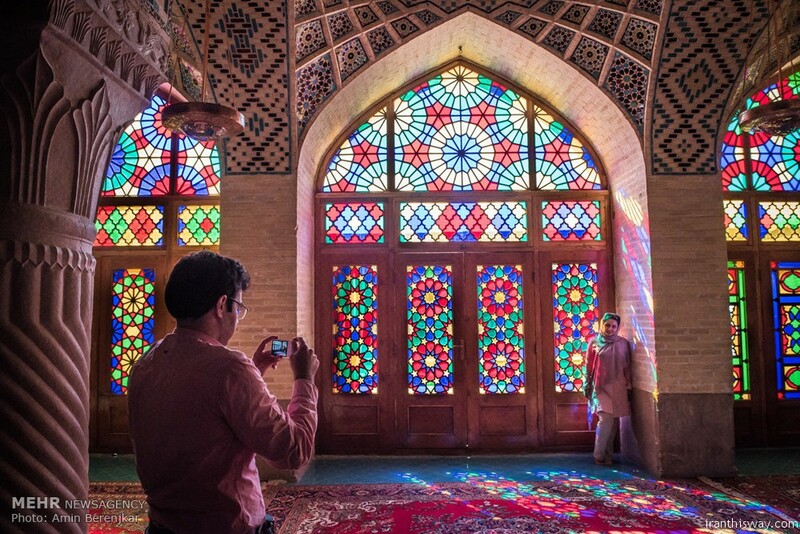 Iranians never forget to put a beautifully adorned and decorated mirror on their traditional table setting. 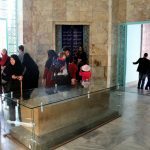 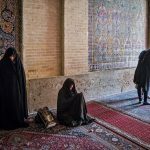 They also put a copy of the Holy Quran on their Haft-Seen table, which they believe will guard their life in the coming year. 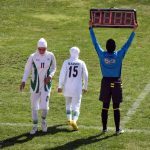 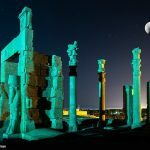 But why is Nowruz extended for 13 days? 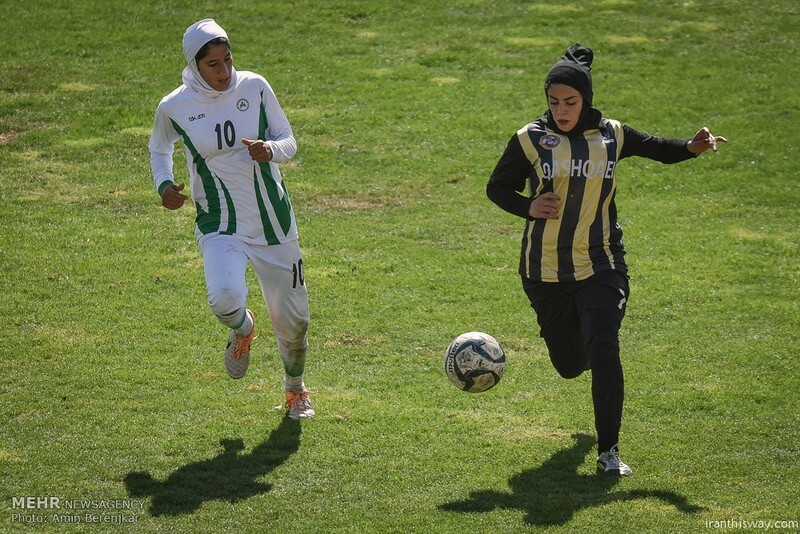 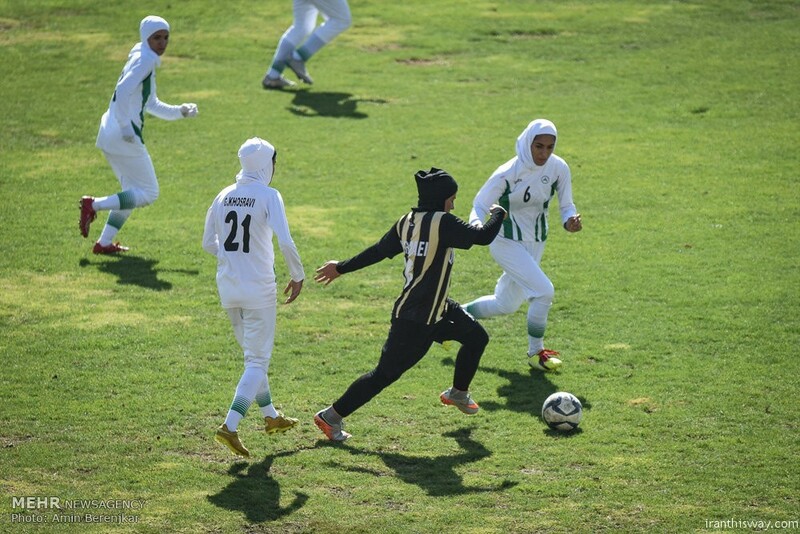 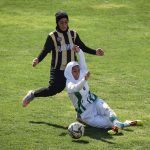 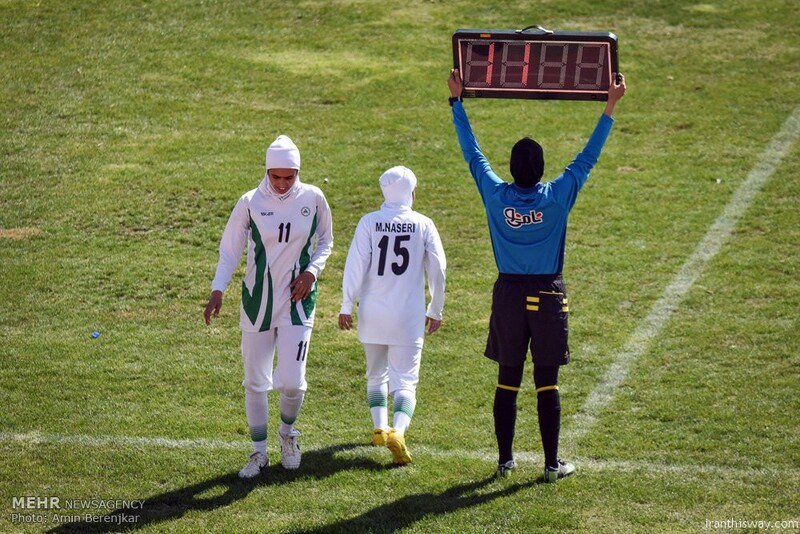 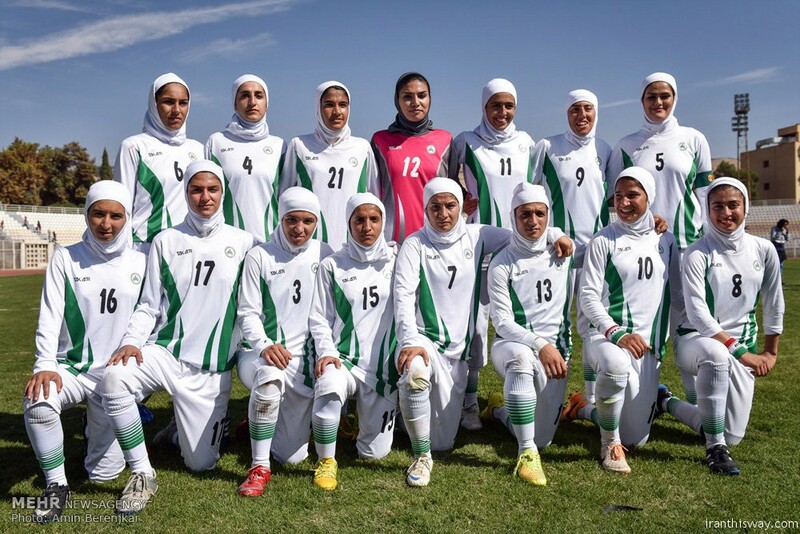 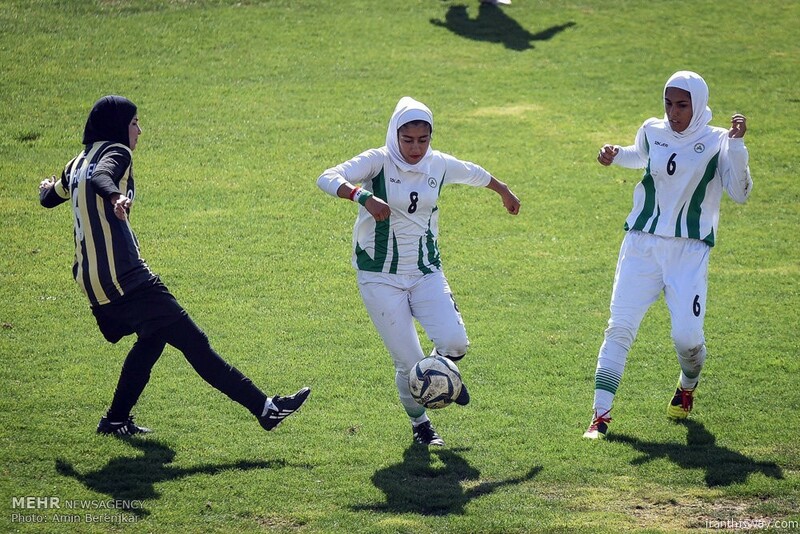 According to the ancient belief of the Iranians, 13 is an inauspicious number. 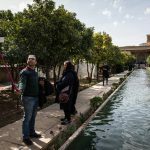 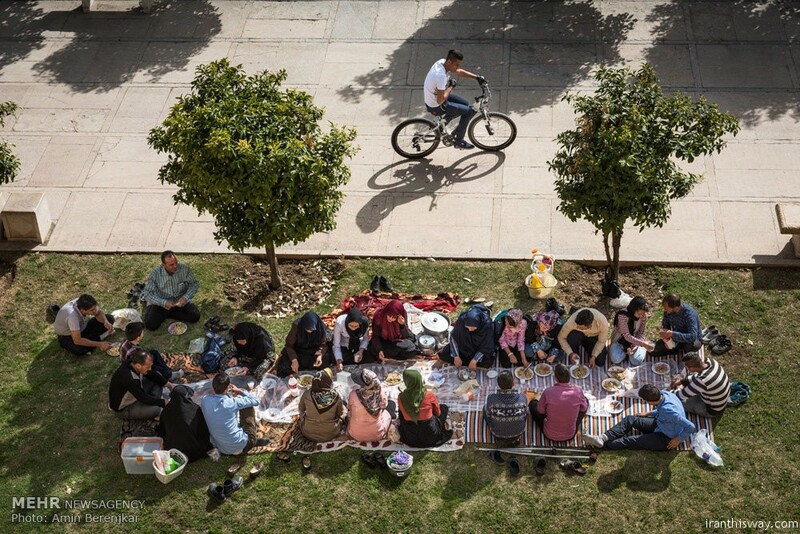 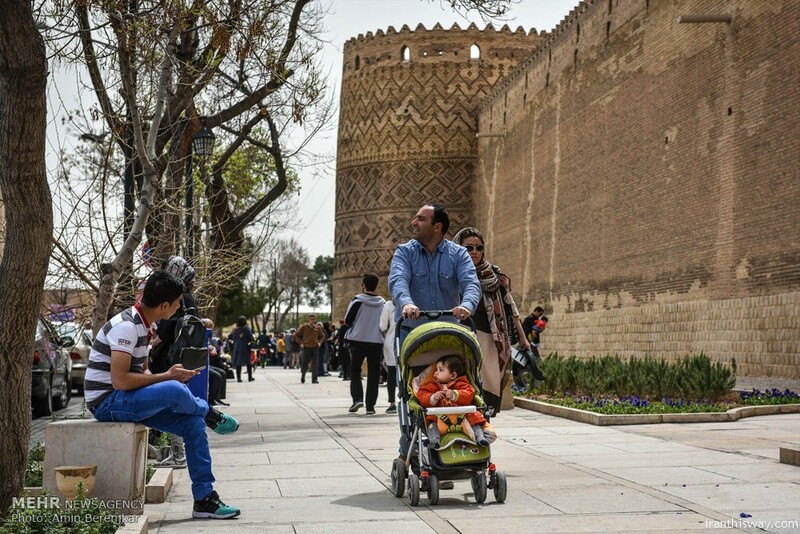 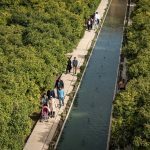 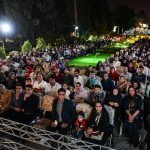 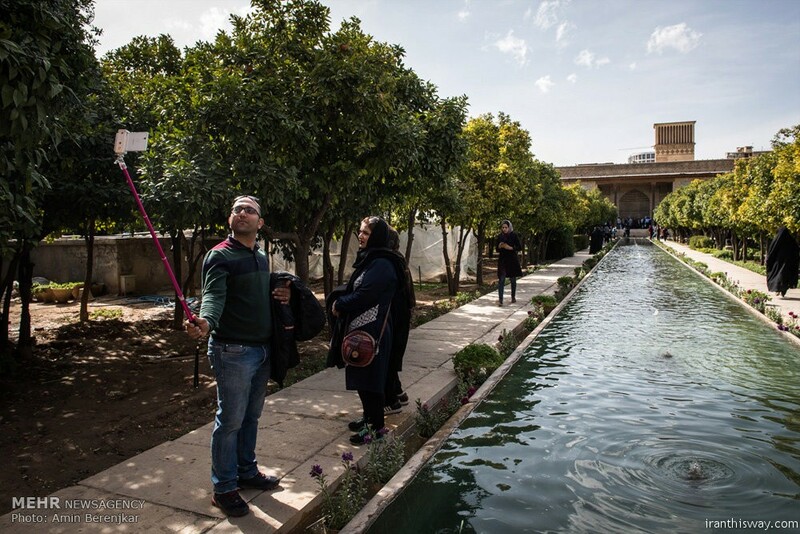 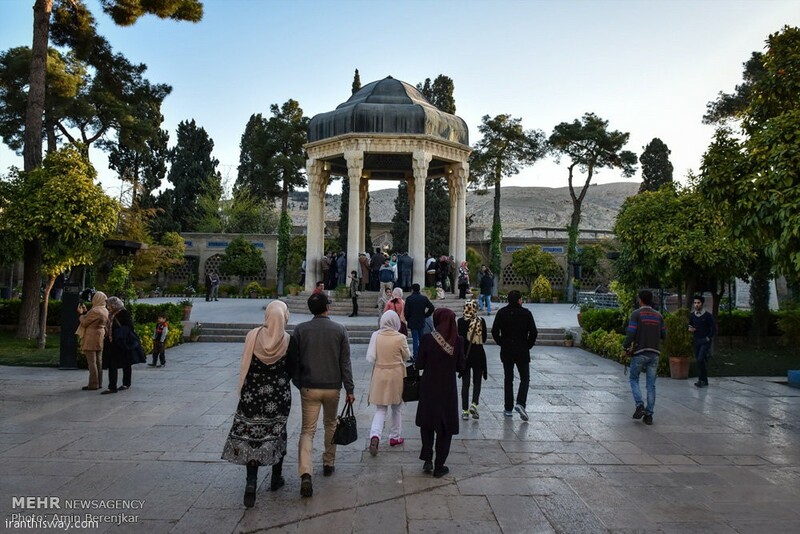 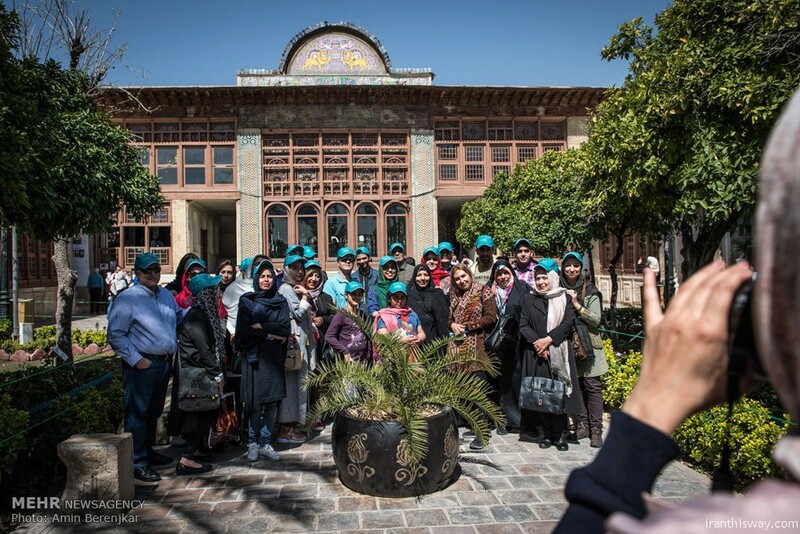 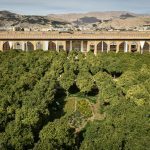 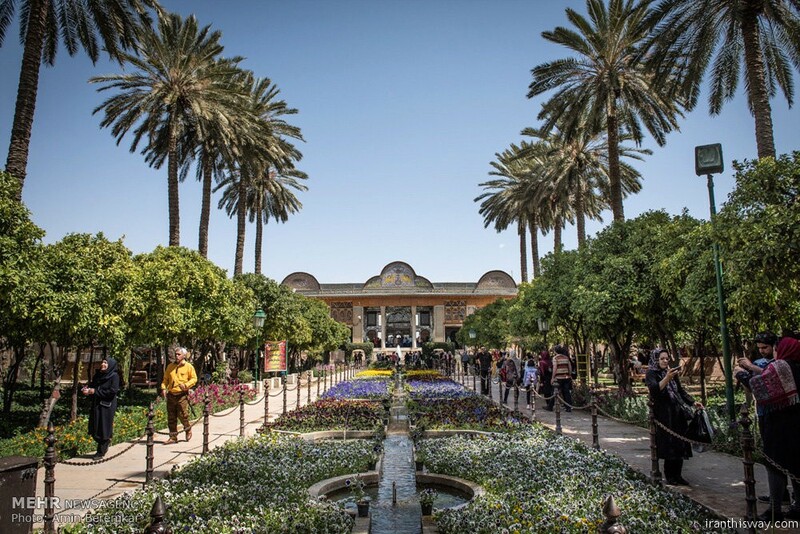 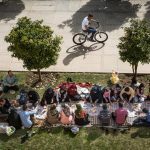 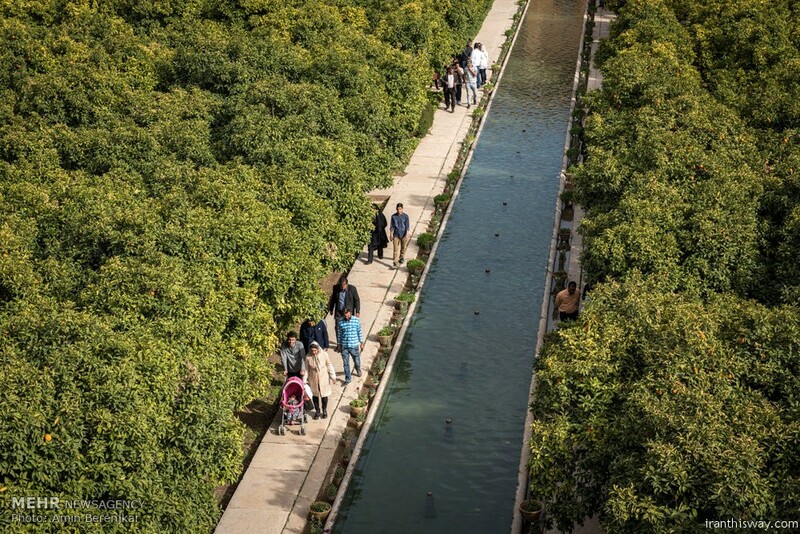 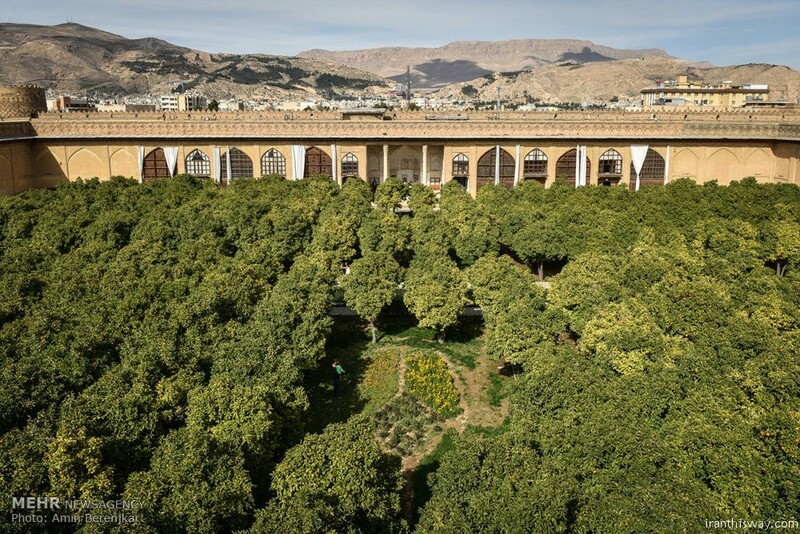 On the 13th day of Farvardin, Iranian families gather in parks, gardens, farms, and other green places to eat cuisines containing certain local herbs and have friendly conversations. 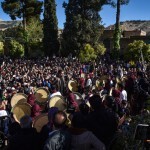 They also throw sprouted wheat grasses into rivers believing that by leaving the “Sabzeh” in the waterways, they throw away the misfortune associated with the number 13 and the 13th day of the year, and this way, they guarantee their New Year and prevent hardships and calamities from coming into their life. 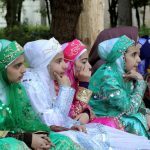 They think that the Sabzeh that is pitched into the rivers will take the bad luck with itself to an unknown destination. 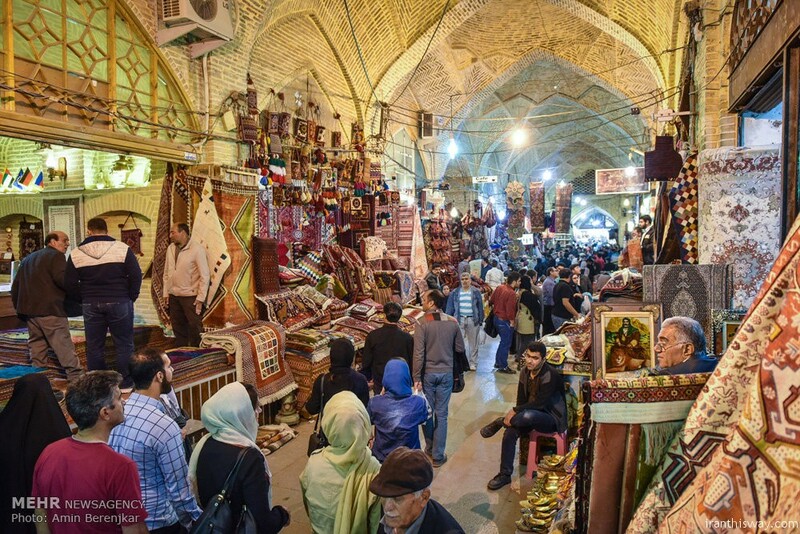 In Nowruz, the adults in the family pay the younger members certain amounts of cash as a gift for the New Year. 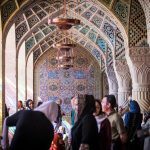 This reward is called “Eidi” and is not usually spent during the whole year but saved and kept as a token of blessing and wellbeing. 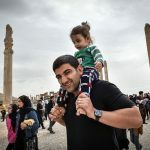 With all of its beauties and splendor, Nowruz is now considered a global festival as it was officially recognized and registered on the UNESCO List of the Intangible Cultural Heritage of Humanity in February 2010. 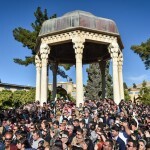 The same year, the UN General Assembly recognized March 21 as the International Day of Nowruz, describing it as a spring festival of Persian origin which has been celebrated for thousands of years. 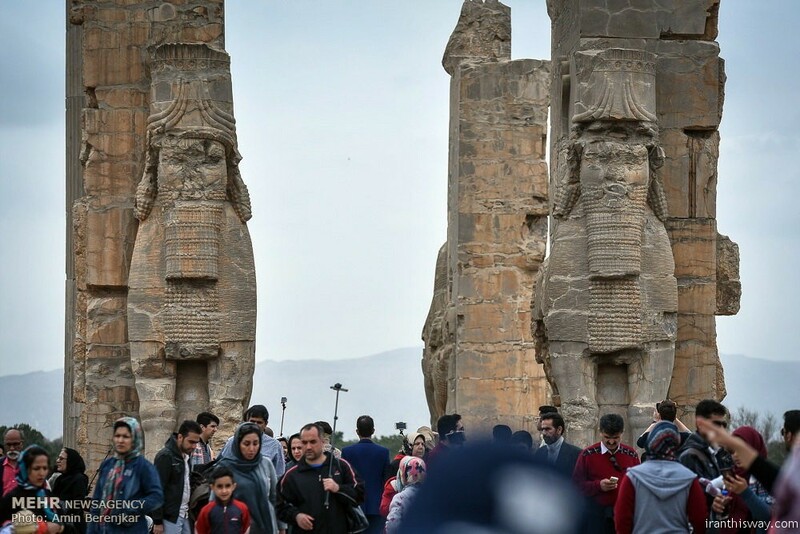 An Aviation official has announced that Shiraz-Vienna direct flights will be soon performed aiming to boost aviation ties with major European airlines. 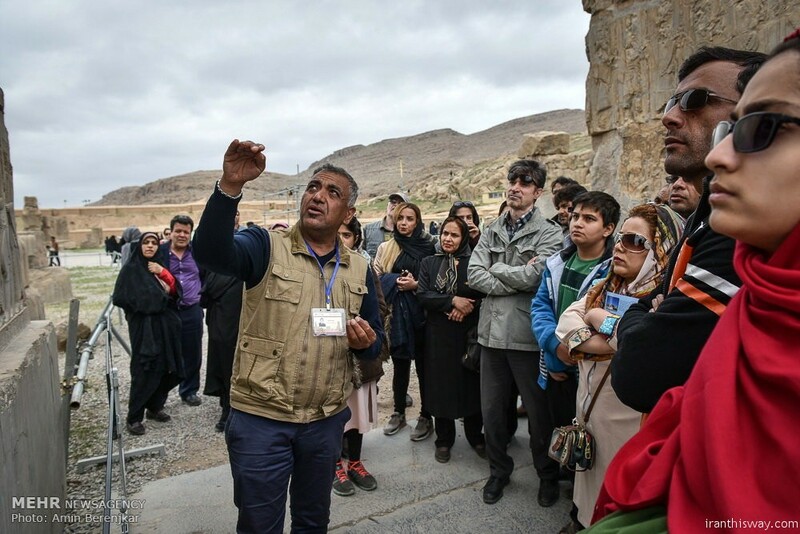 General for Airports Department of Fars Province Reza Badi’ee Fard said launching of direct flights between Fars province and European states will play a significant role in prosperity and development of tourism expressing hope that these flights will be performed in the near future. 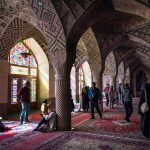 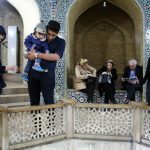 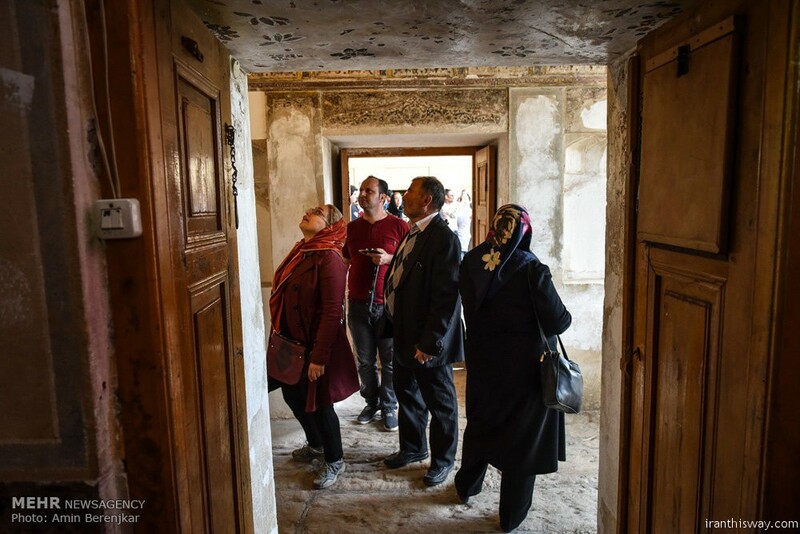 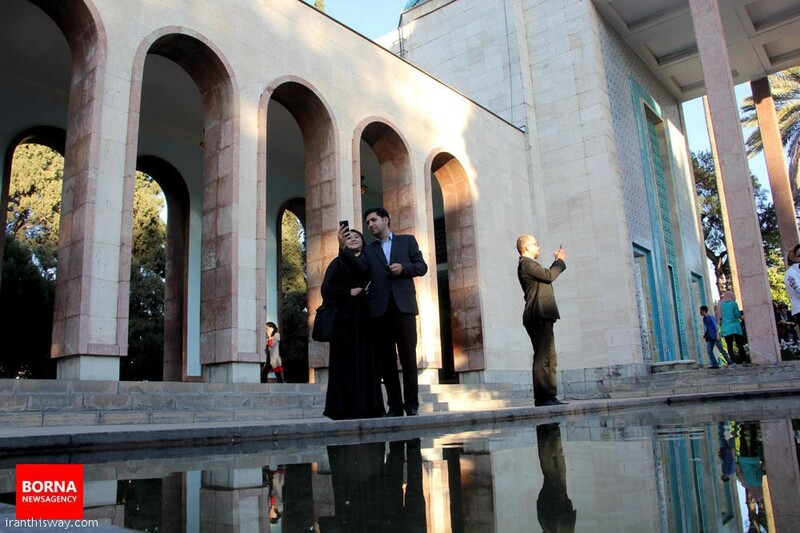 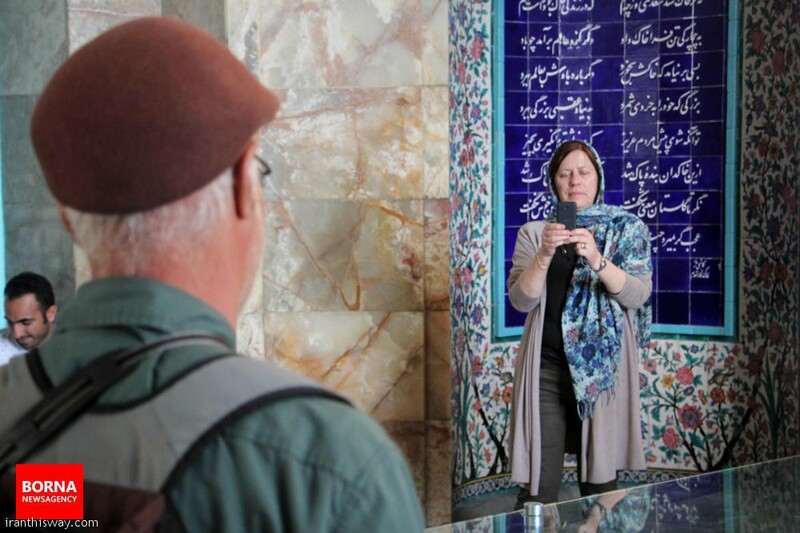 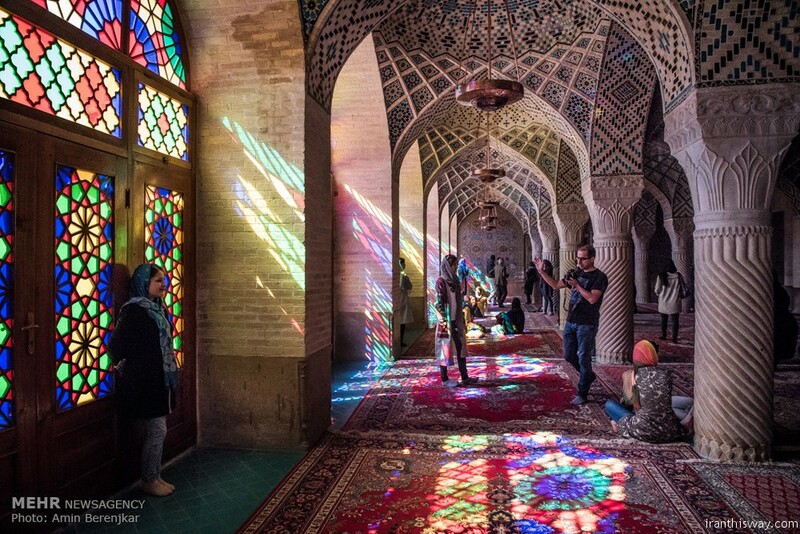 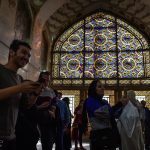 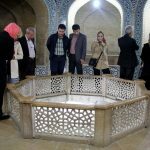 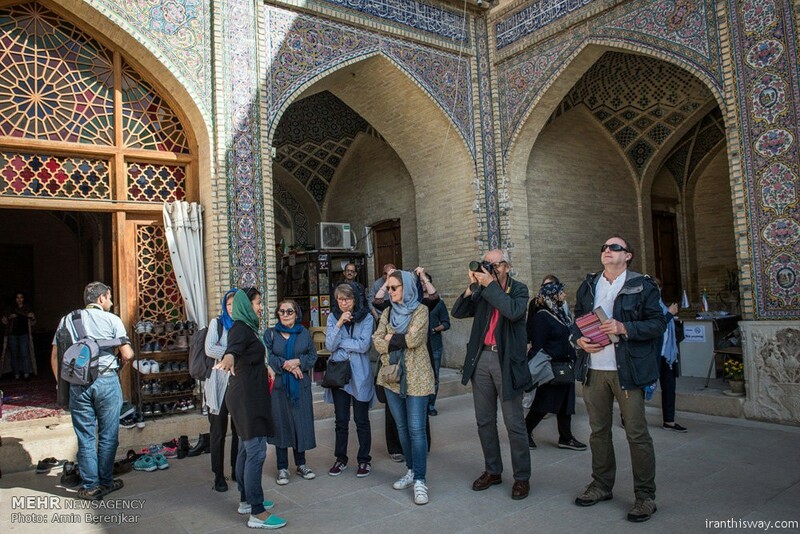 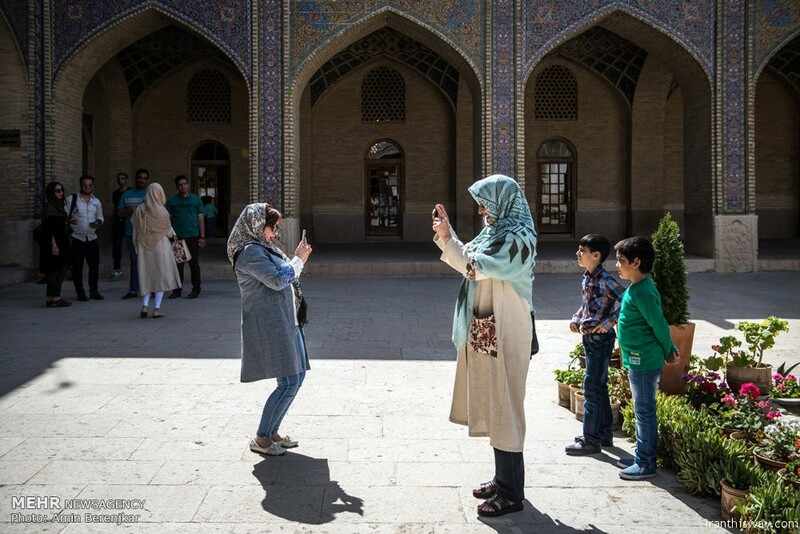 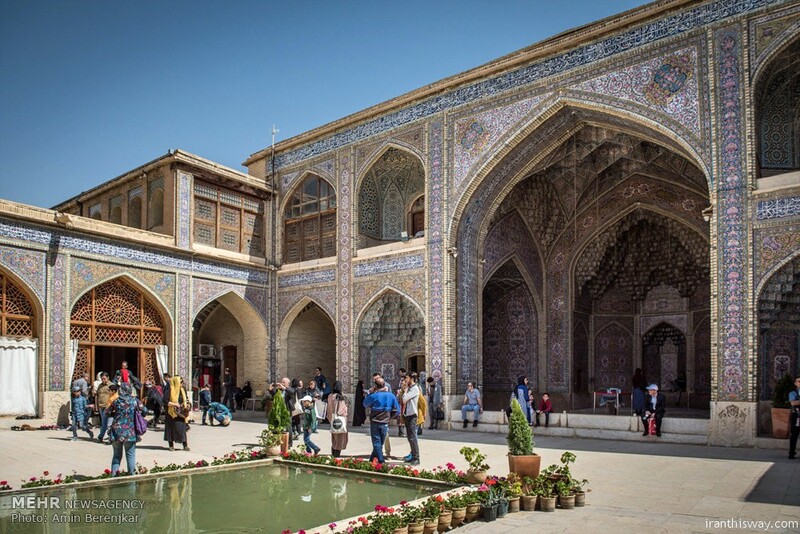 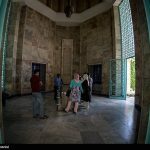 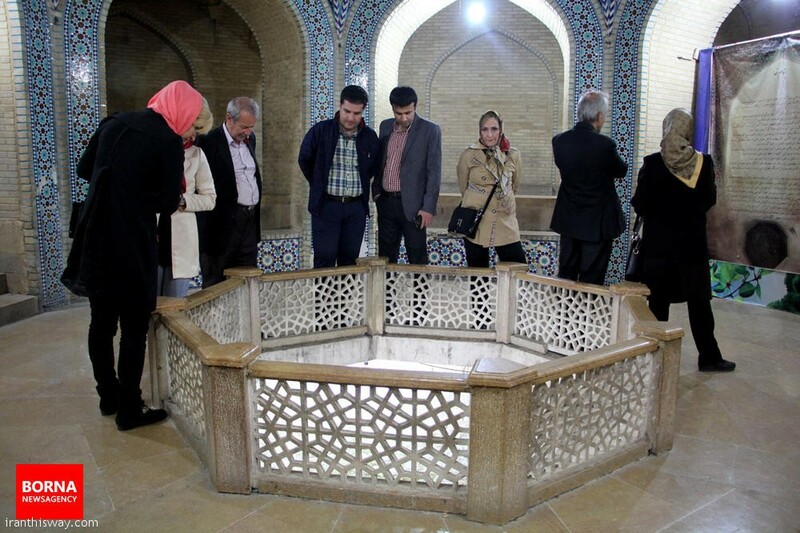 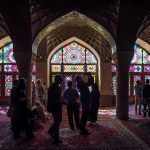 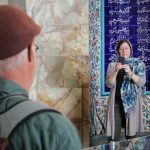 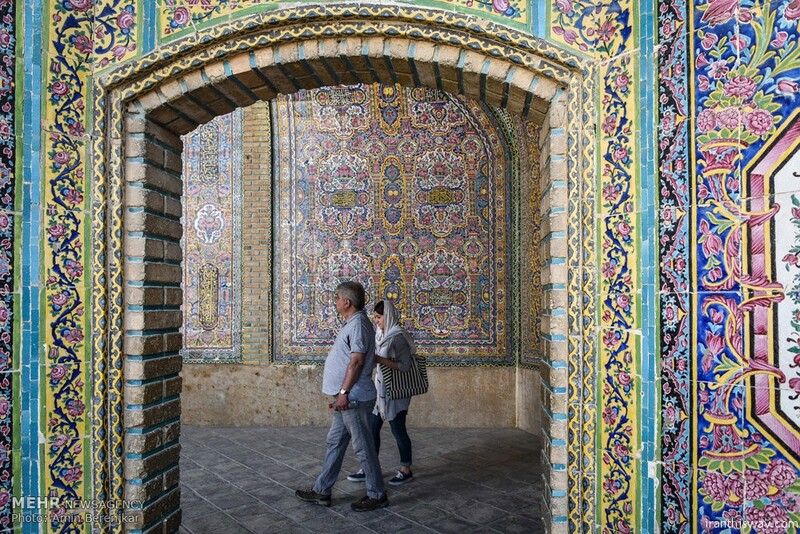 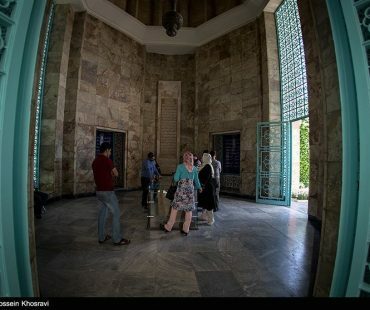 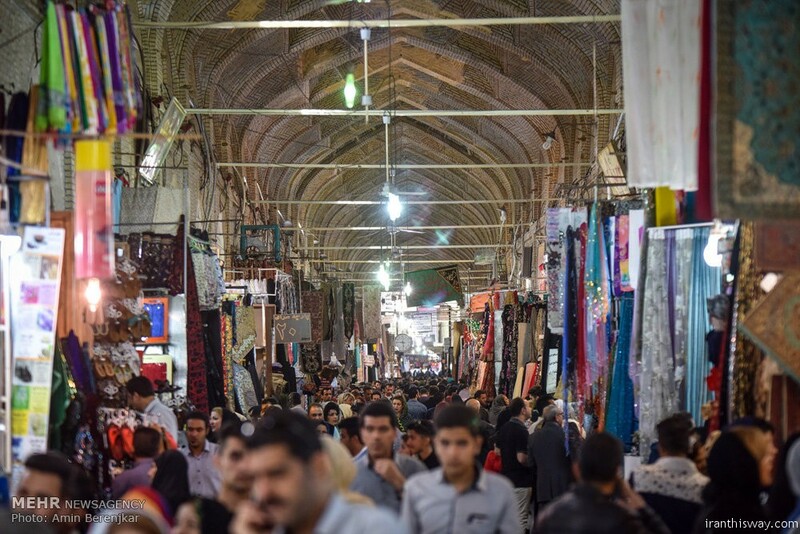 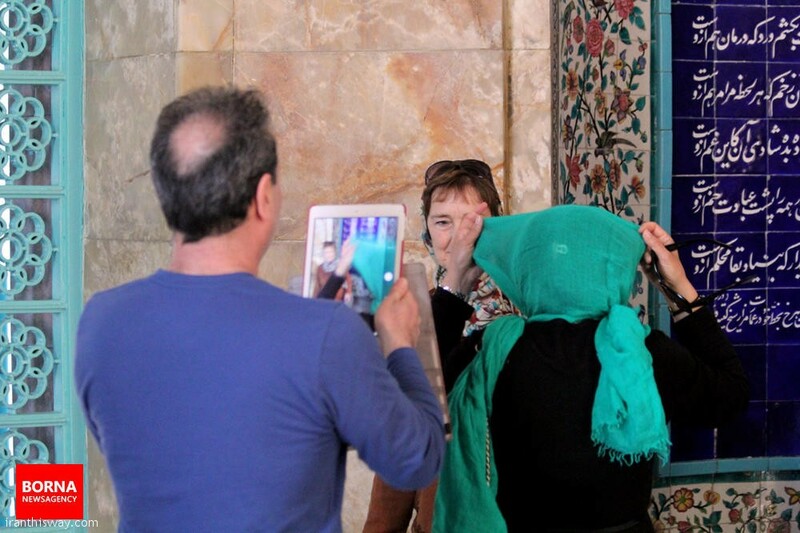 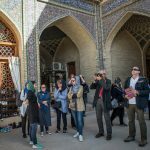 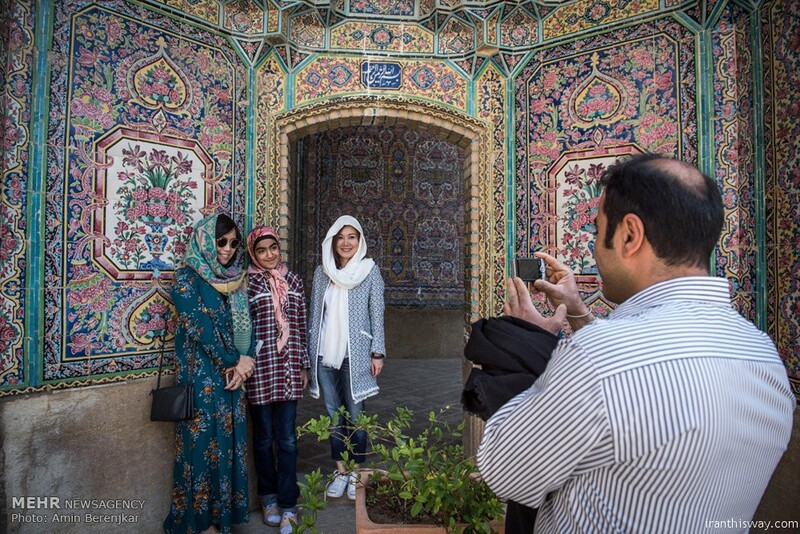 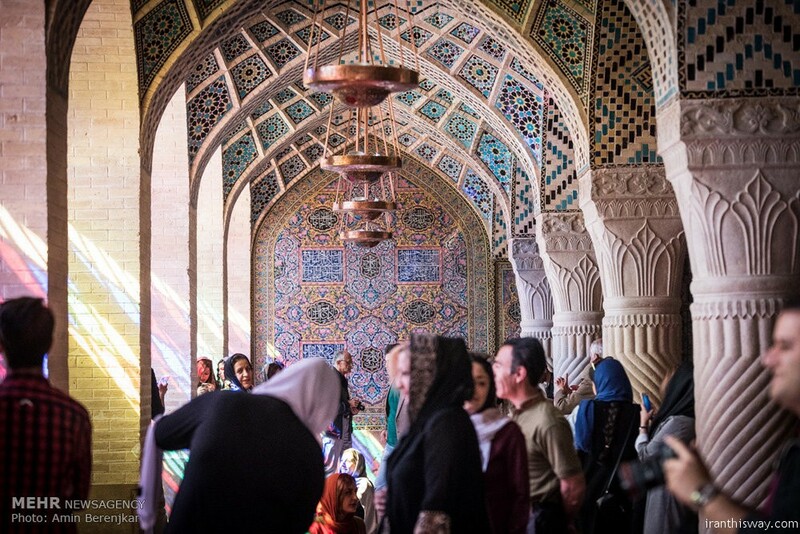 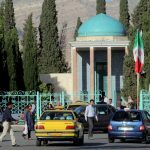 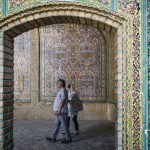 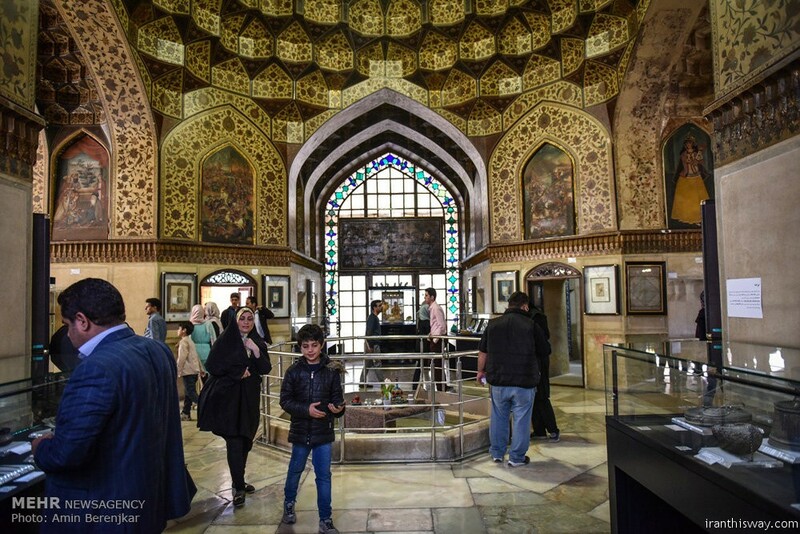 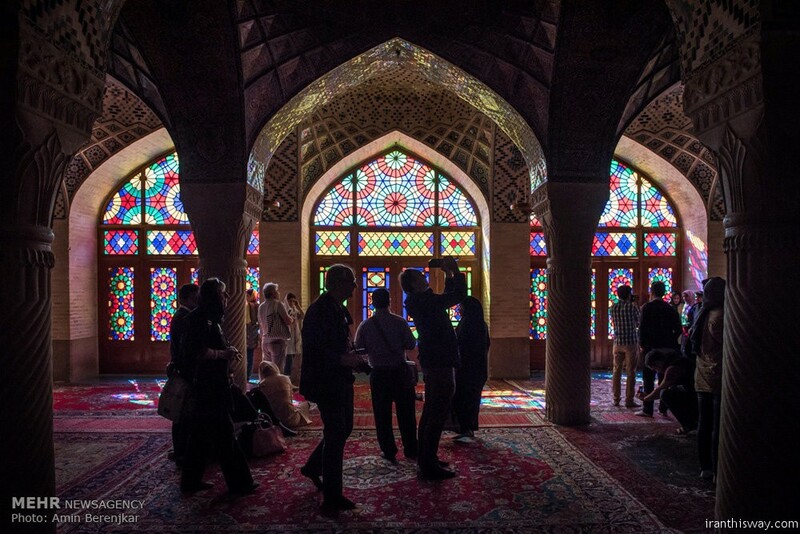 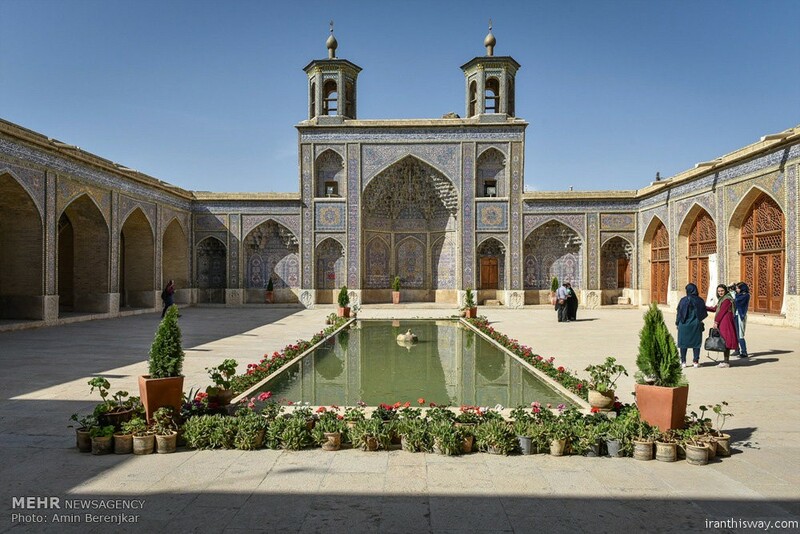 “Accordingly, two groups of Austrian tourists from Linz and Graz are scheduled to travel to Iranian city of Shiraz via charter flights in March, 2017,” he continued. 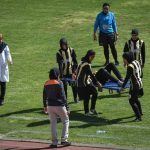 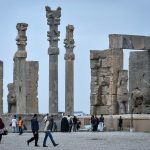 “They also made visits to the airport’s control tower, facilities of domestic and international terminals, delivery of services to passengers as well as equipment of handling firms present at the airport,” underlined the official. 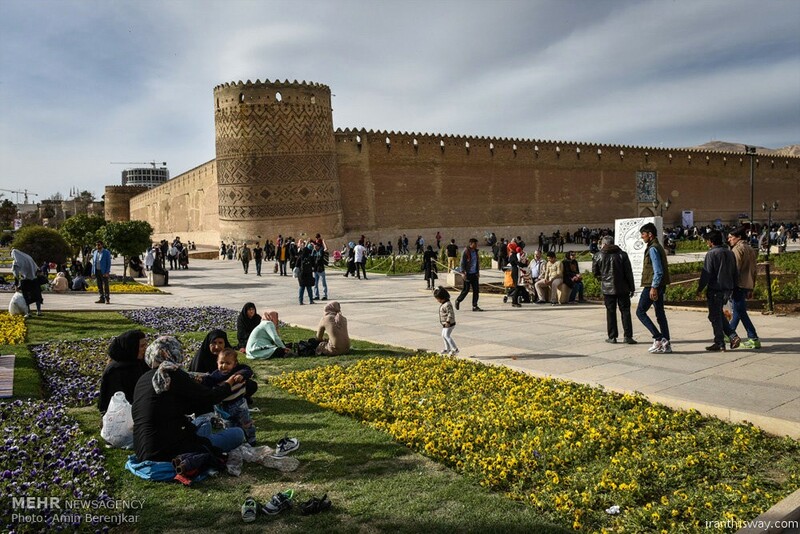 He also recalled that Shiraz International Airport is now undergoing development stages as a new international flight terminal with an area of 23 thousand square meters and capacity of 2.5 million passengers per year is under construction. 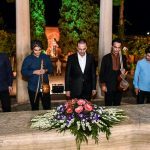 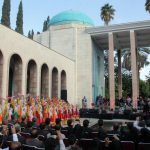 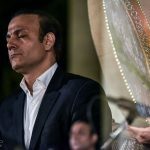 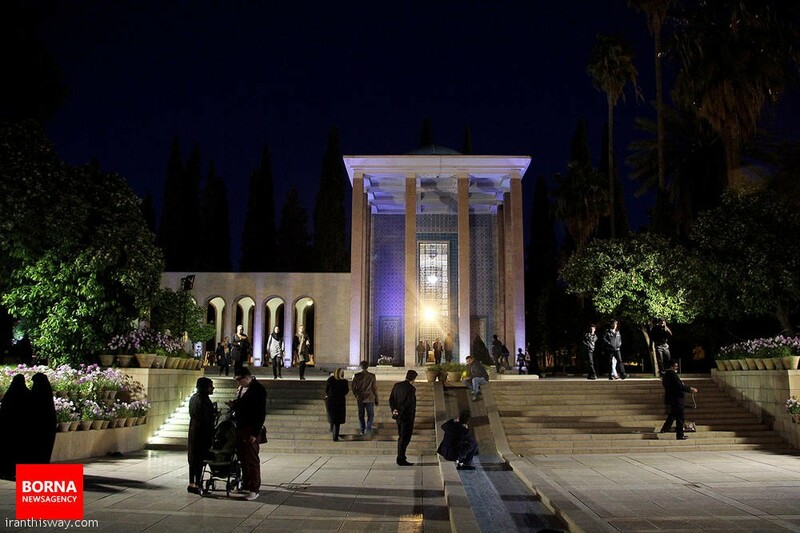 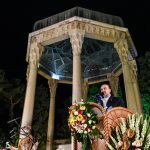 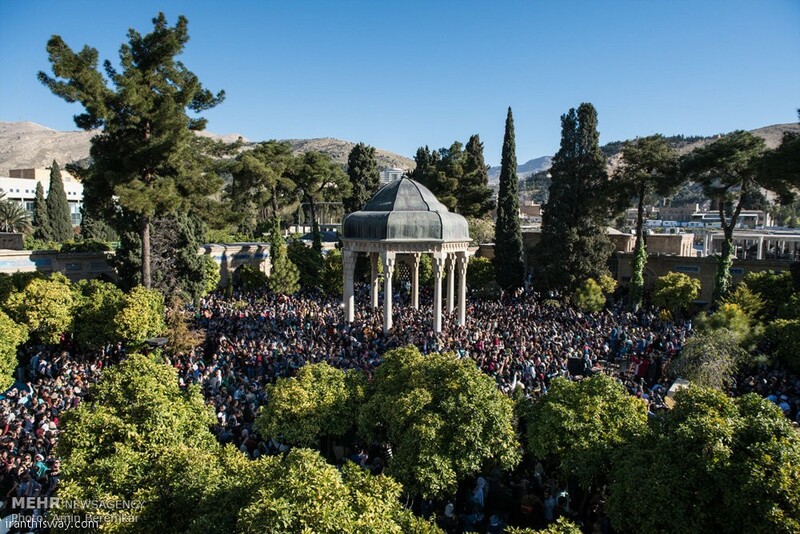 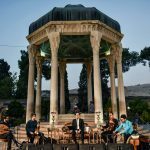 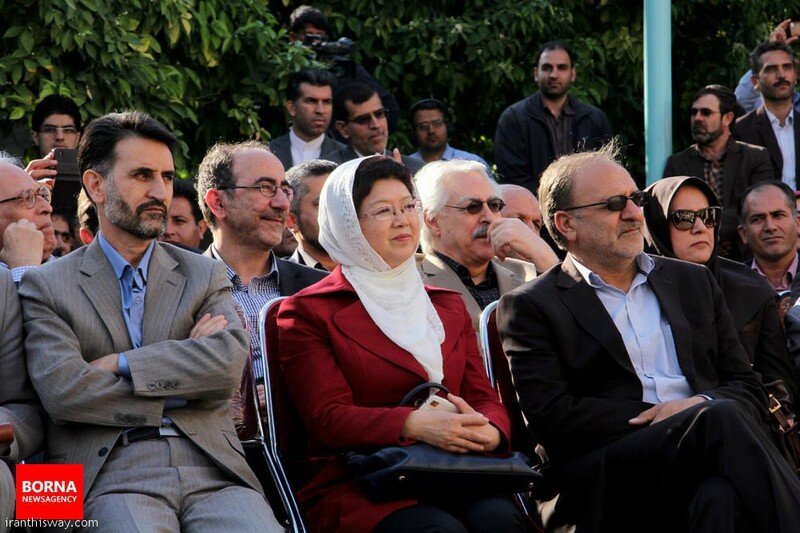 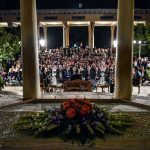 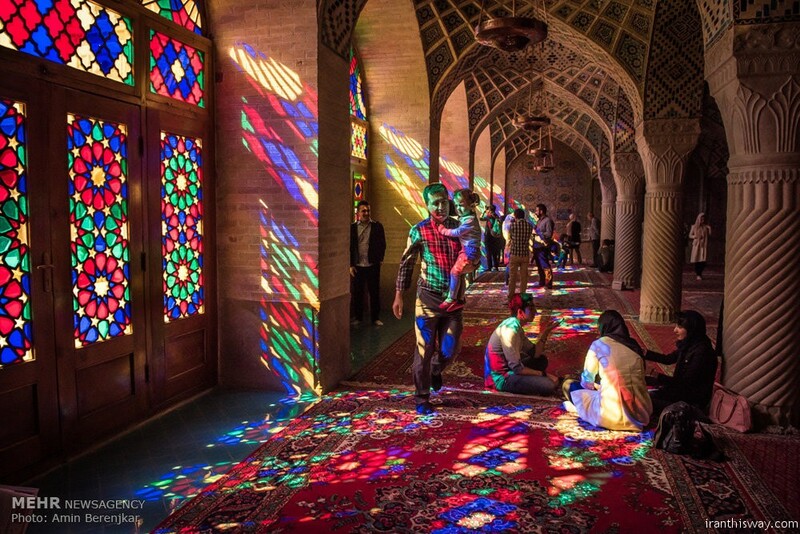 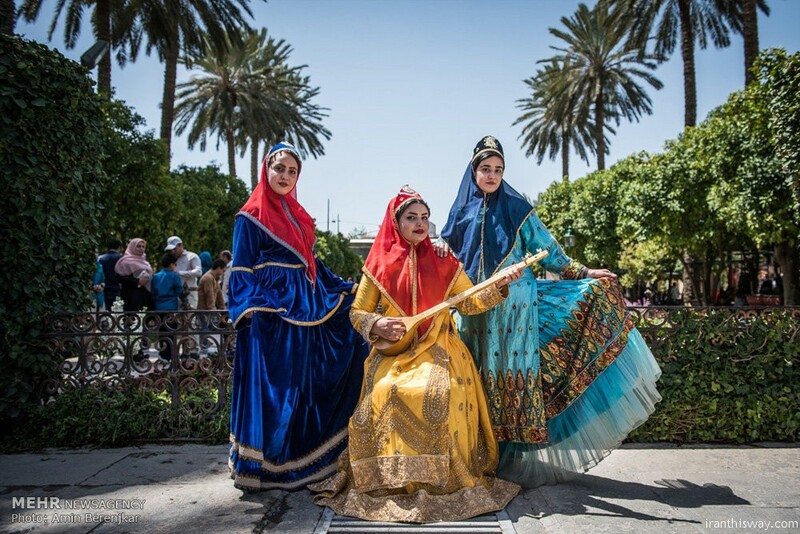 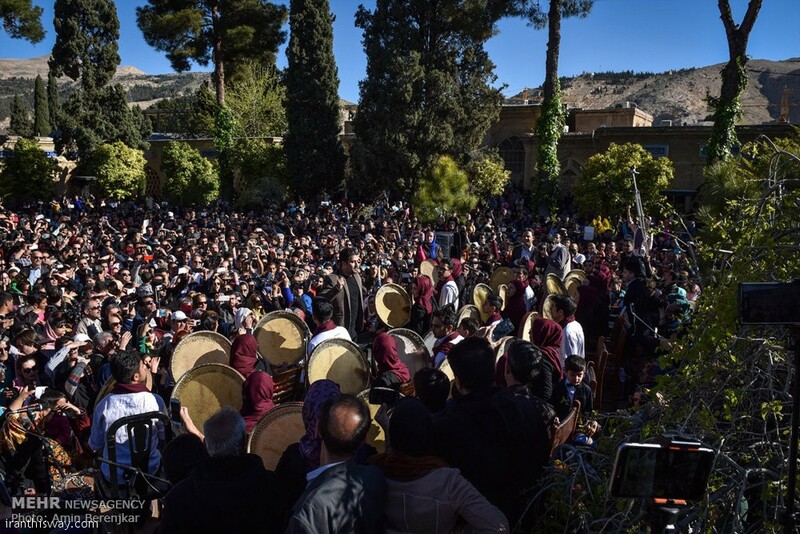 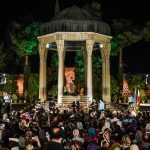 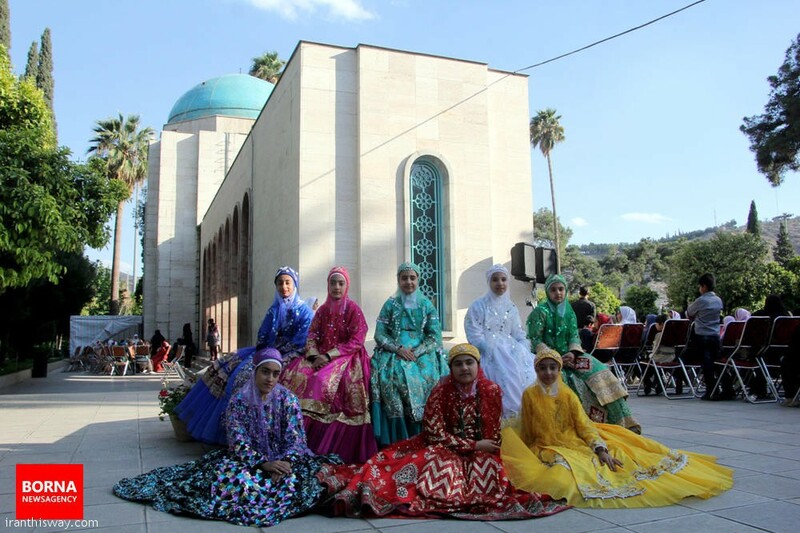 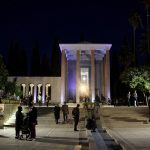 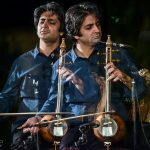 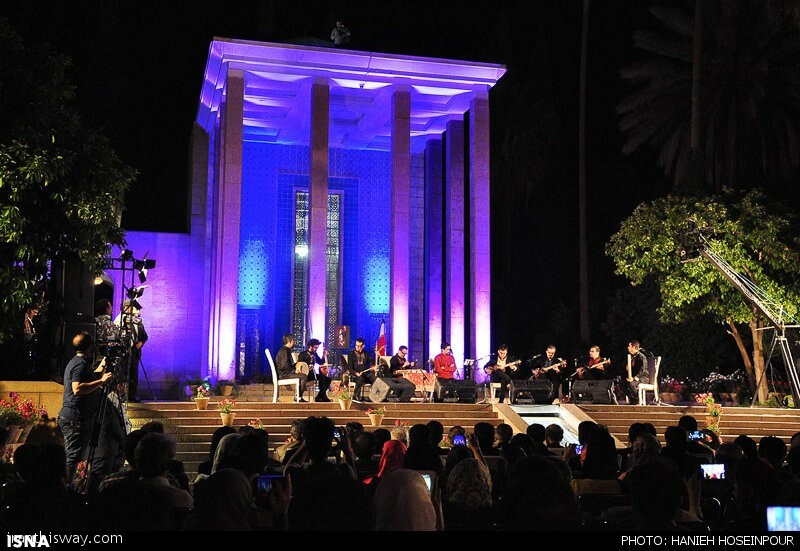 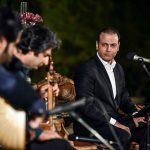 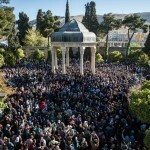 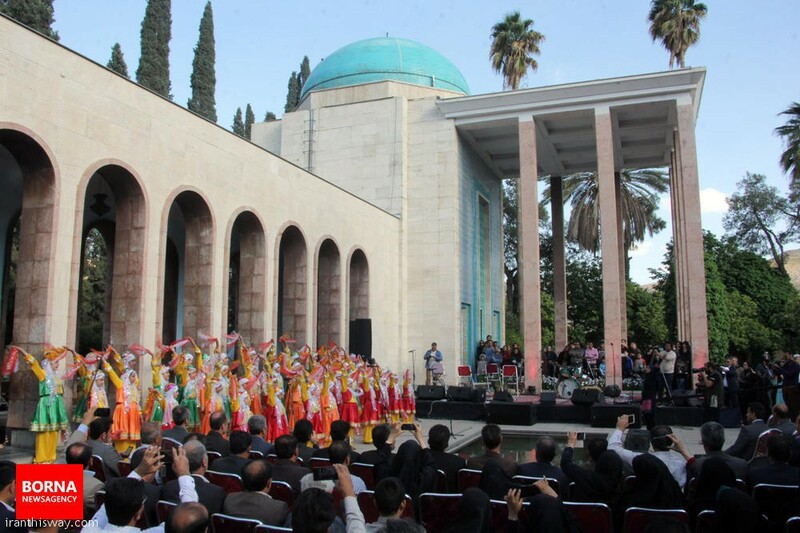 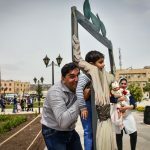 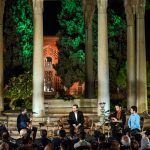 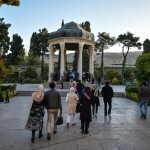 The southern city of Shiraz held a commemoration for the Persian mystic poet Hafez on Thursday. 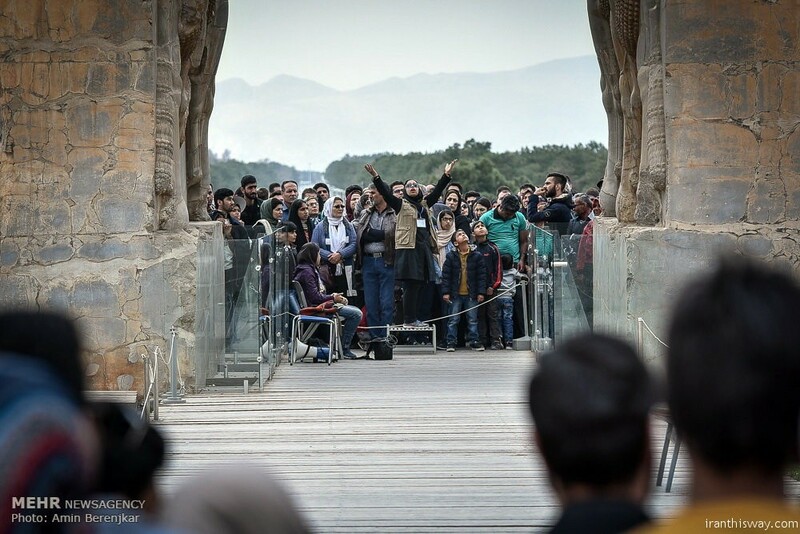 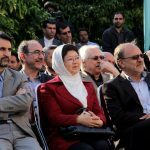 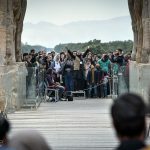 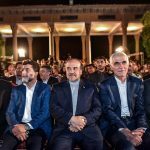 The ceremony was attended by Vice President of Iran and Head of Cultural Heritage, Handcrafts and Tourism Organization Masoud Soltanifar. 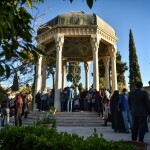 Persian lyric poet Hafiz (born Khwāja Šamsu d-Dīn Muḥammad Hāfez-e Šīrāzī) grew up in Shiraz. 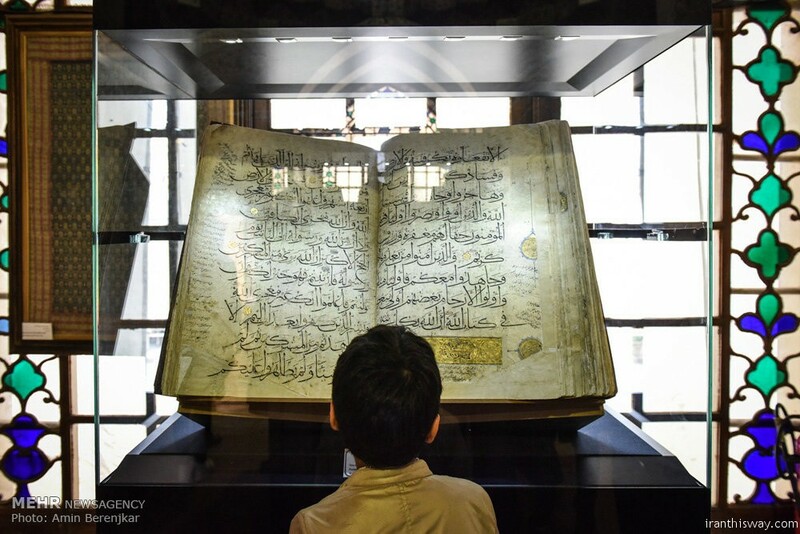 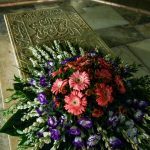 Very little is known about his life, but it is thought that he may have memorized the Qur’an after hearing his father recite passages. 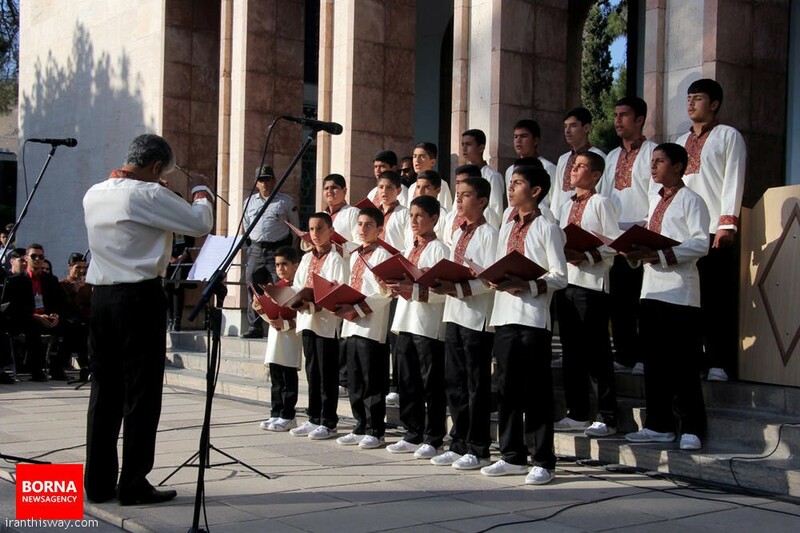 When his father died, he left school to work at a bakery and as a copyist. 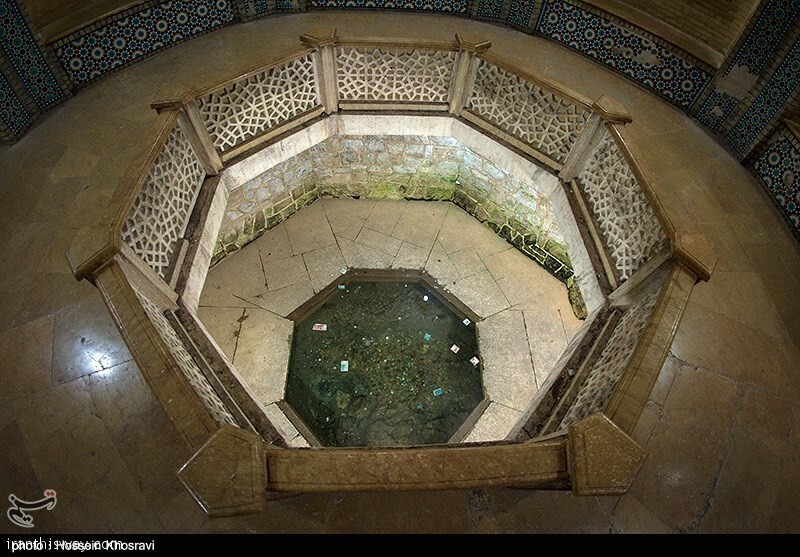 Hafiz became a poet at the court of Abu Ishak and also taught at a religious college. 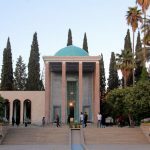 He is one of the most celebrated of the Persian poets, and his influence can be felt to this day. 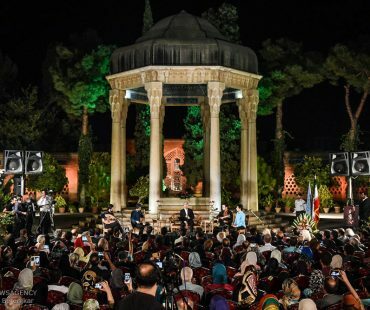 As the author of numerous ghazals expressing love, spirituality, and protest, he and his work continue to be important to Iranians, and many of his poems are used as proverbs or sayings. 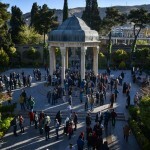 the 20 of April is “Saadi’s Day” in IRAN. 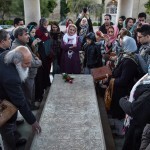 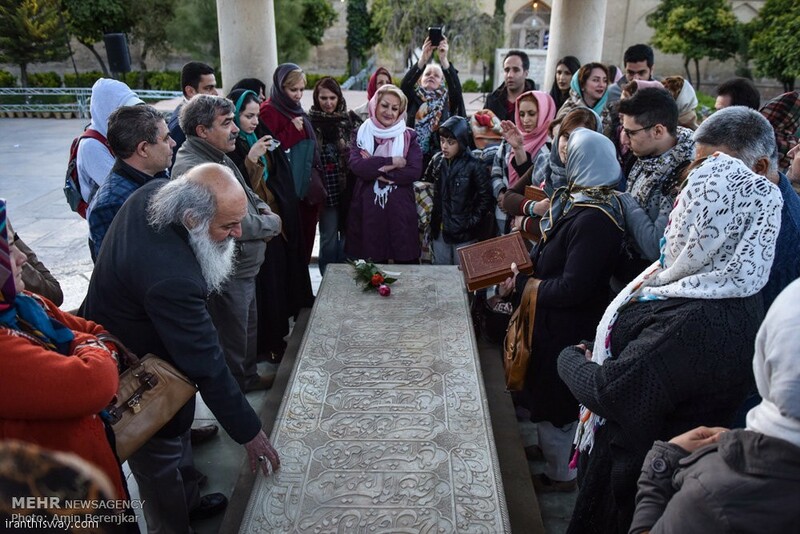 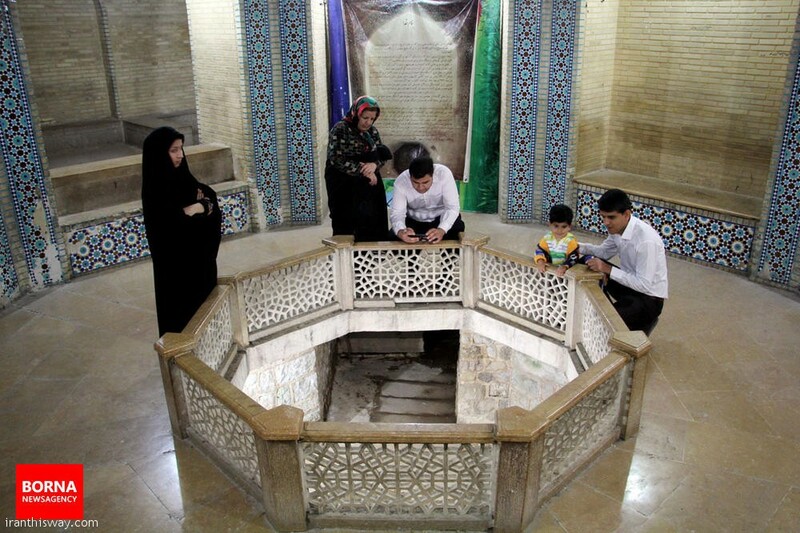 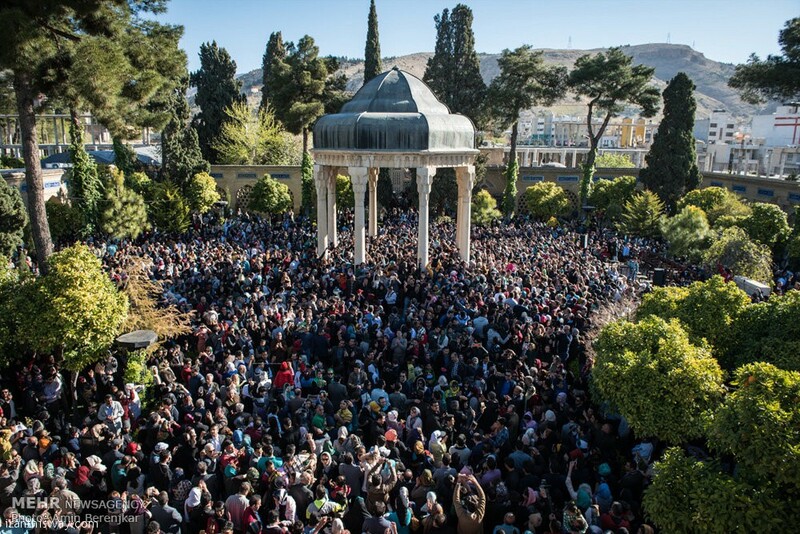 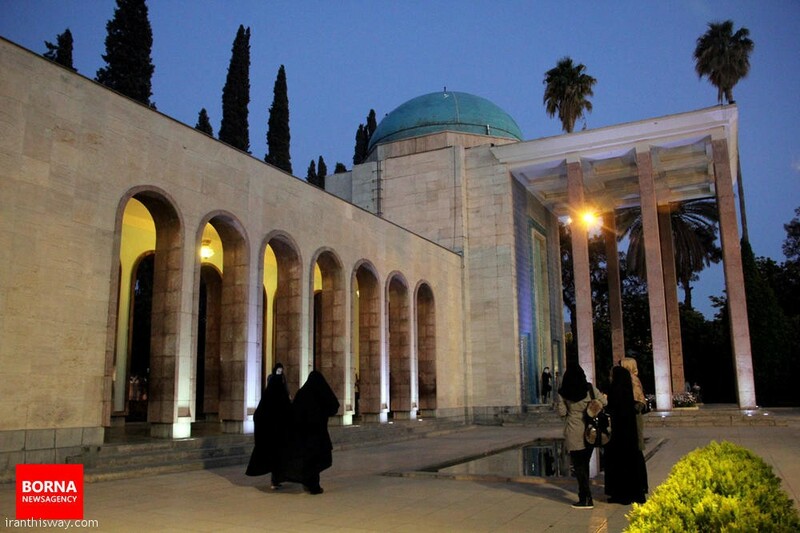 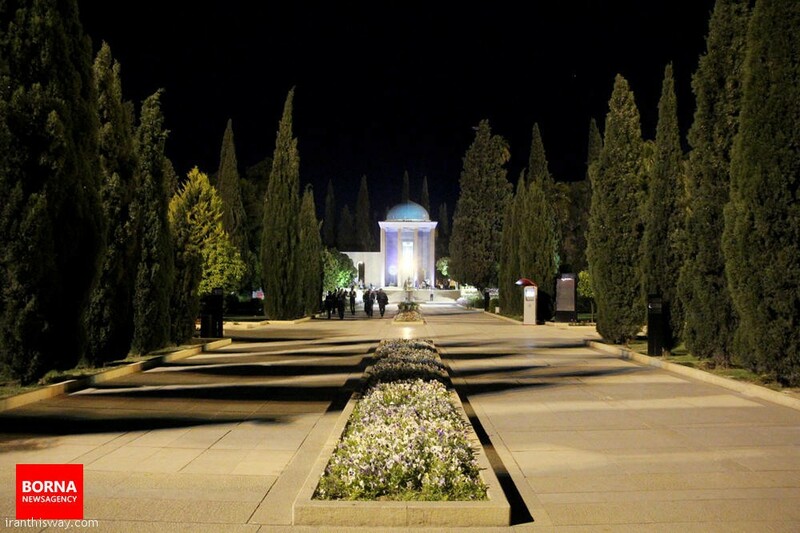 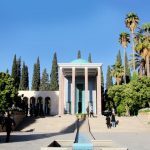 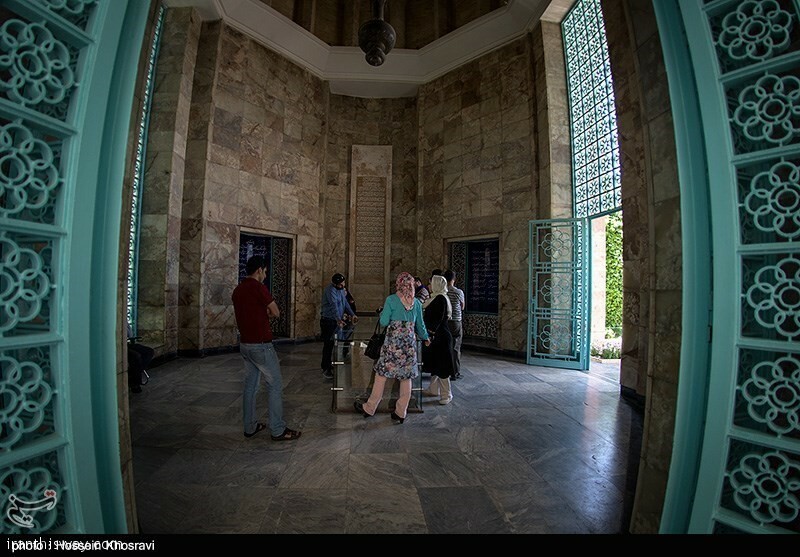 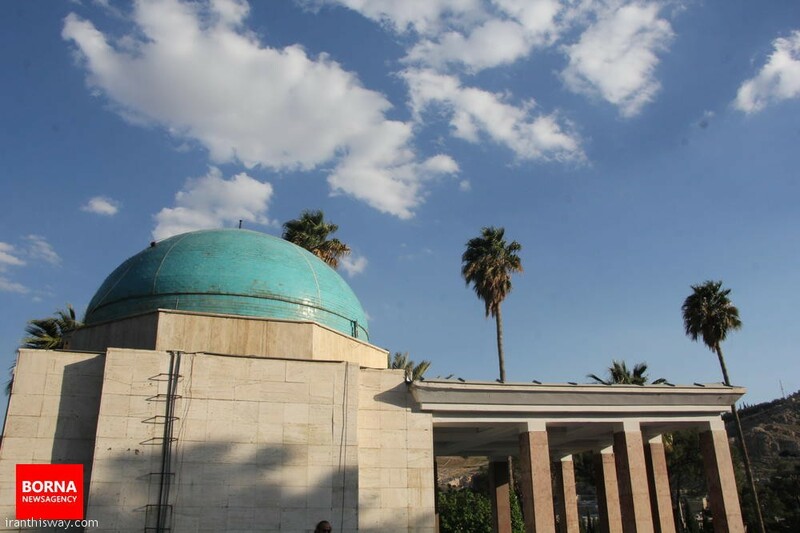 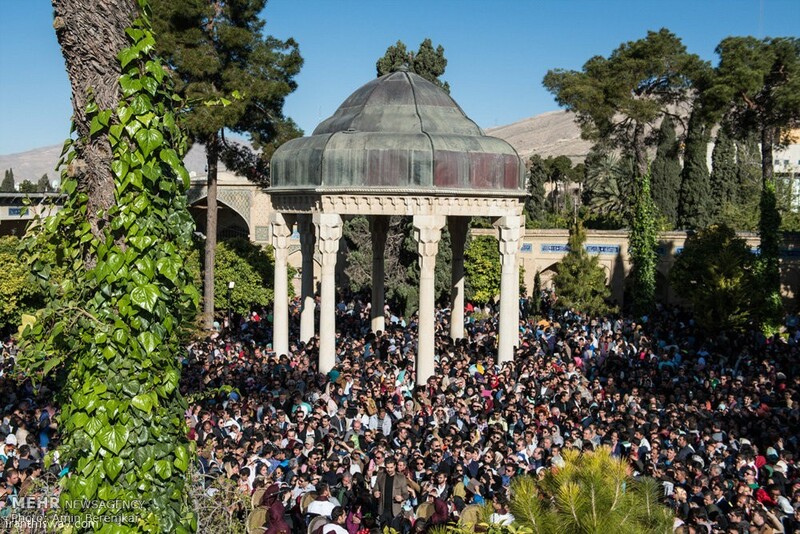 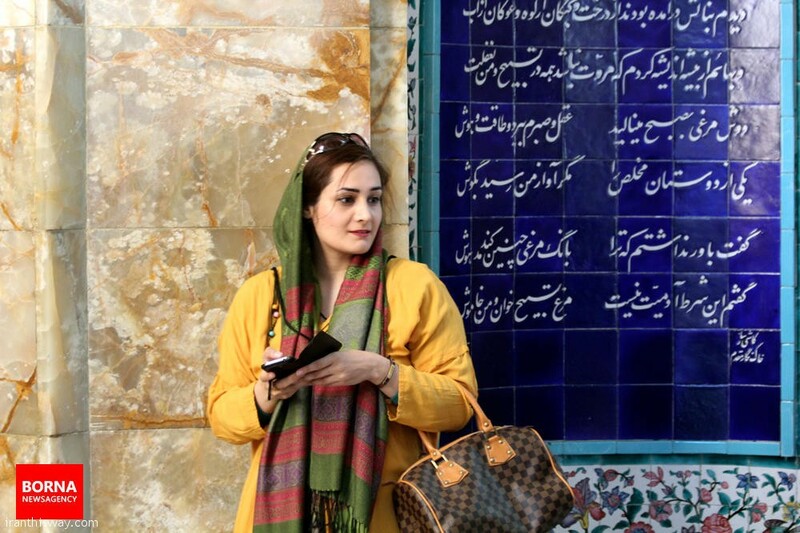 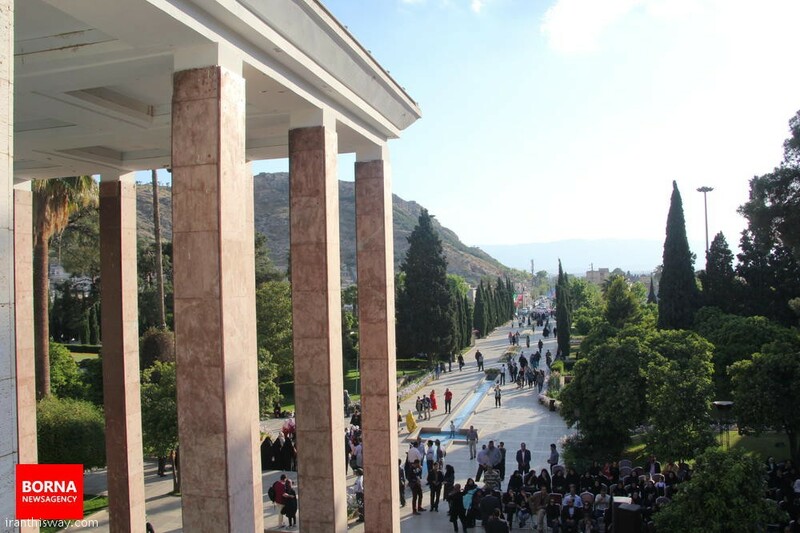 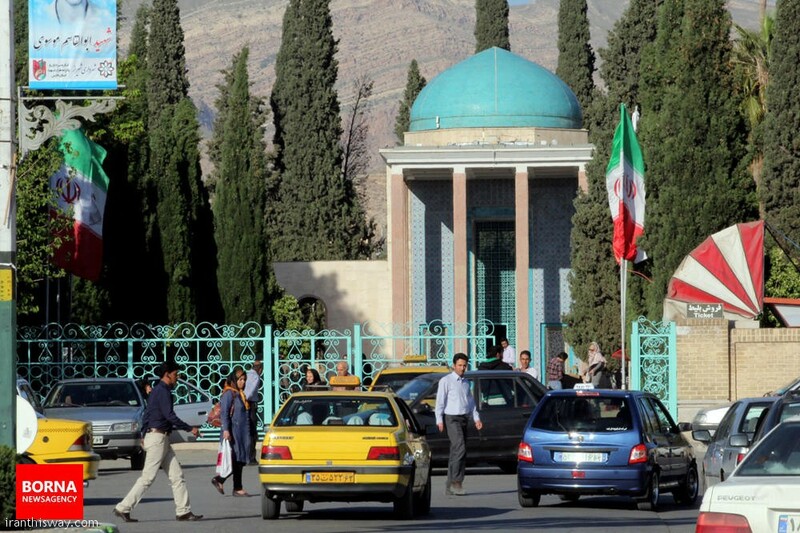 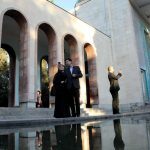 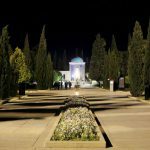 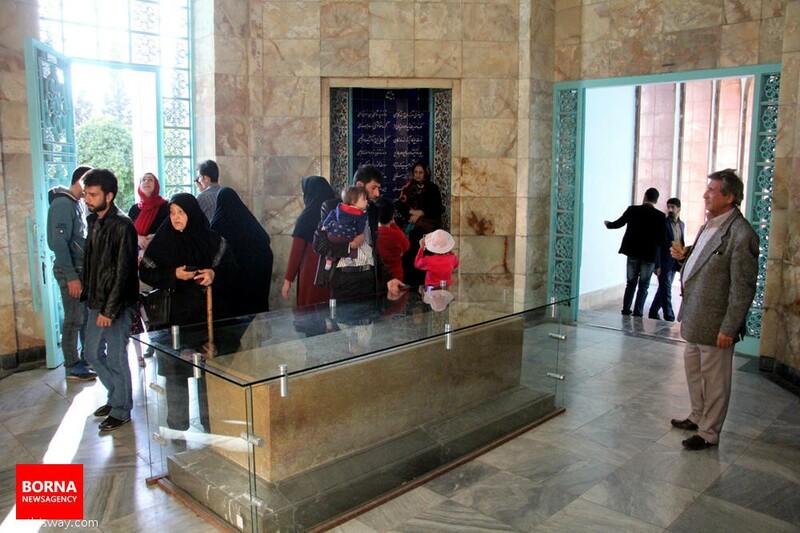 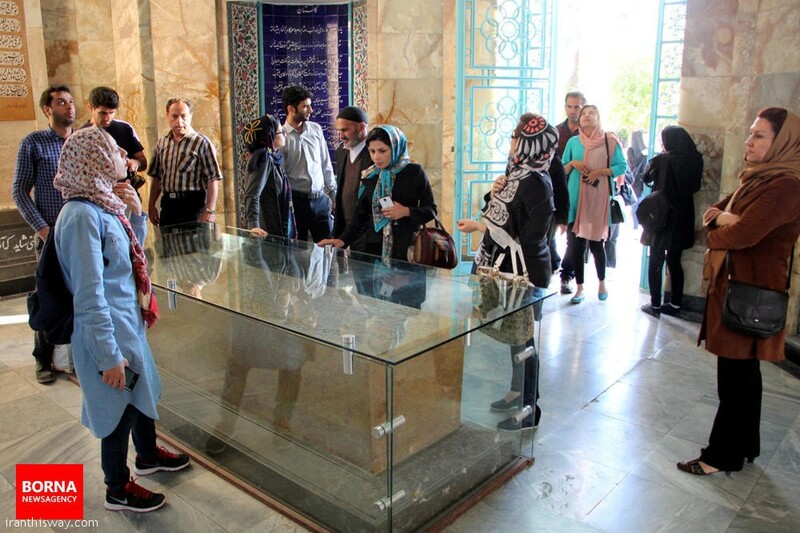 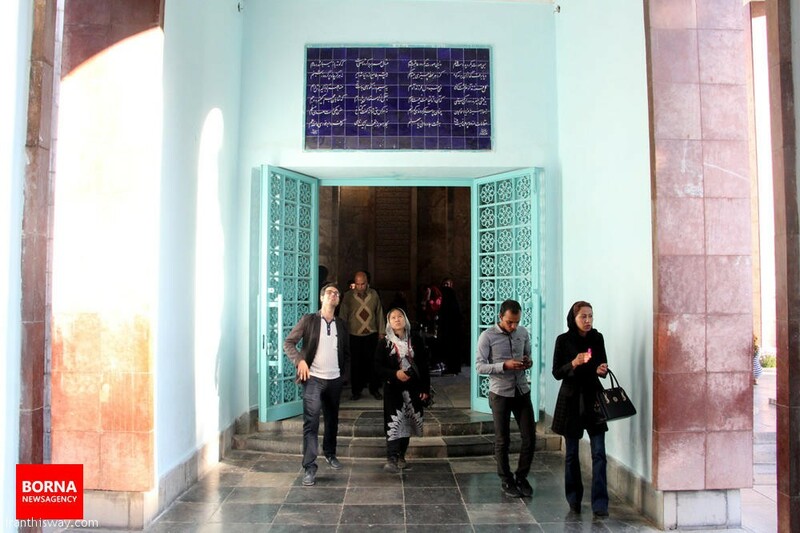 Many lovers of the great Persian poet Saadi gather at his grave in Shiraz and read his poetry. 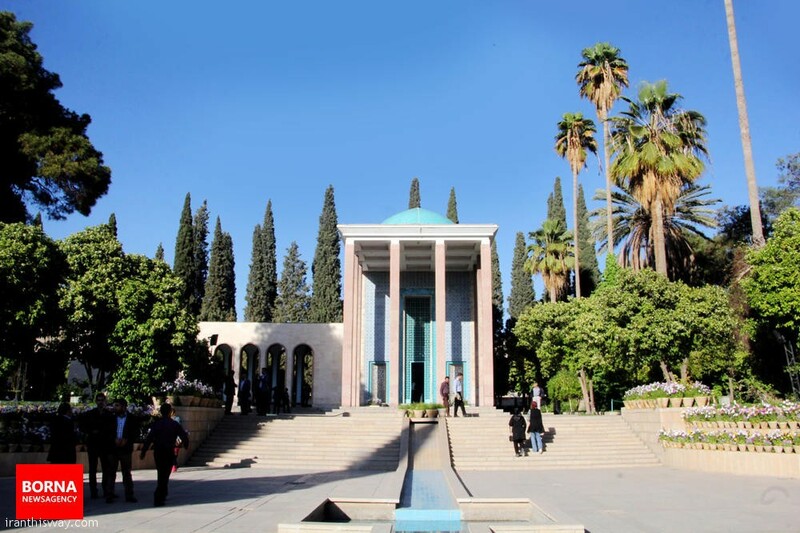 Saadi distinguished between the spiritual and the practical or mundane aspects of life. 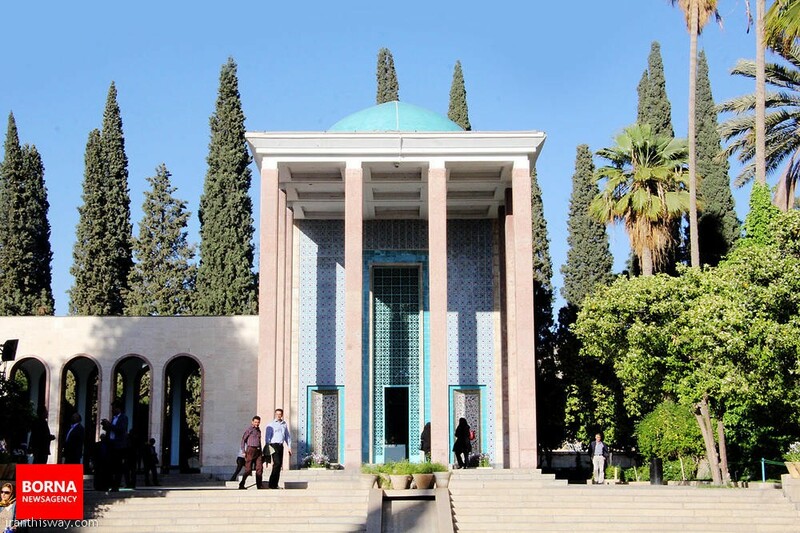 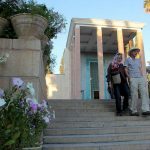 In his Bustan, for example, spiritual Saadi uses the mundane world as a spring board to propel himself beyond the earthly realms. 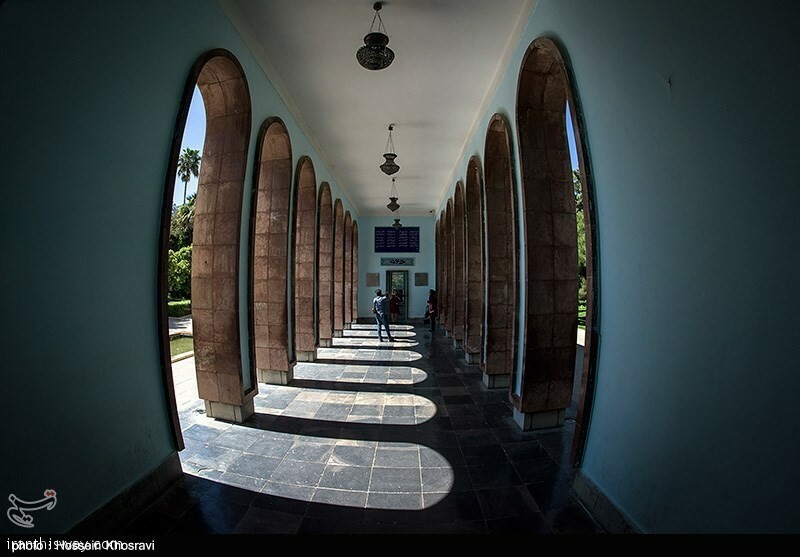 The images in Bustan are delicate in nature and soothing. 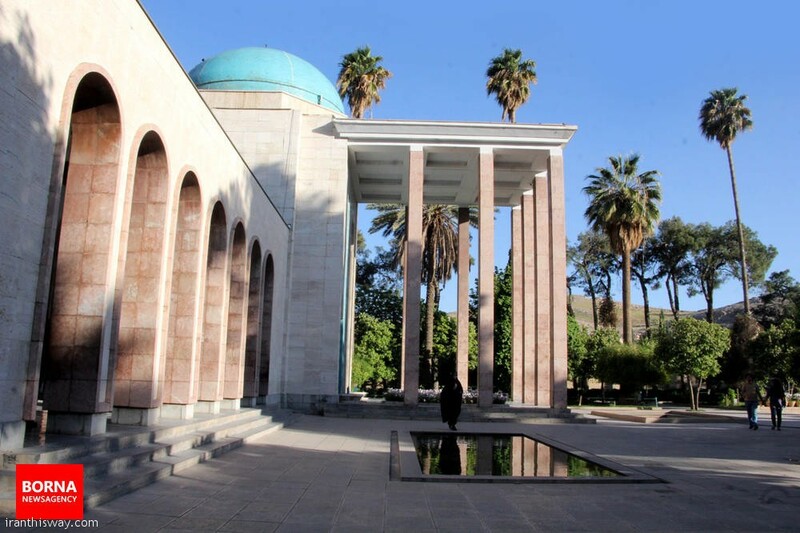 In the Gulistan, on the other hand, mundane Saadi lowers the spiritual to touch the heart of his fellow wayfarers. 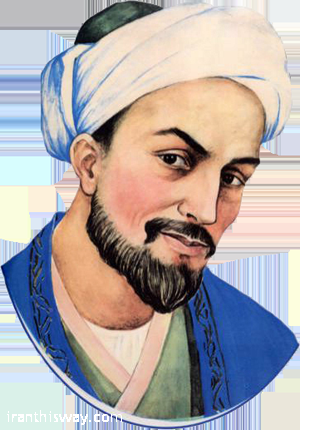 Here the images are graphic and, thanks to Saadi’s dexterity, remain concrete in the reader’s mind. 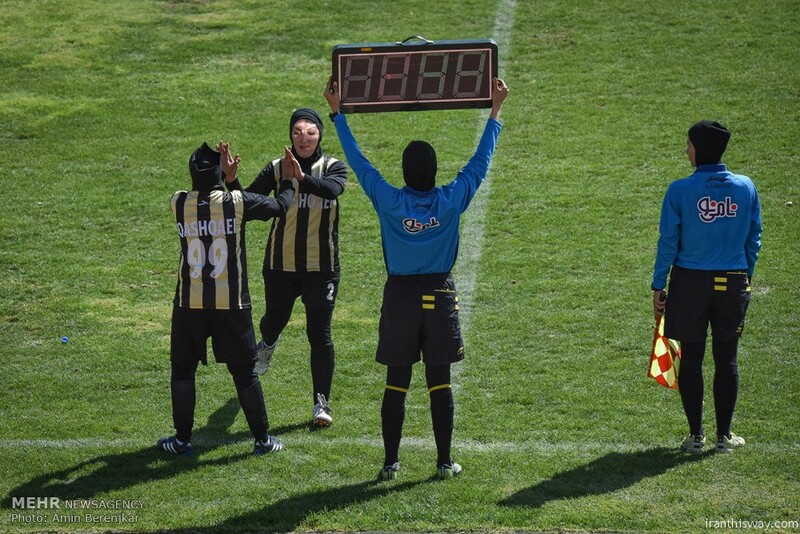 Realistically, too, there is a ring of truth in the division. 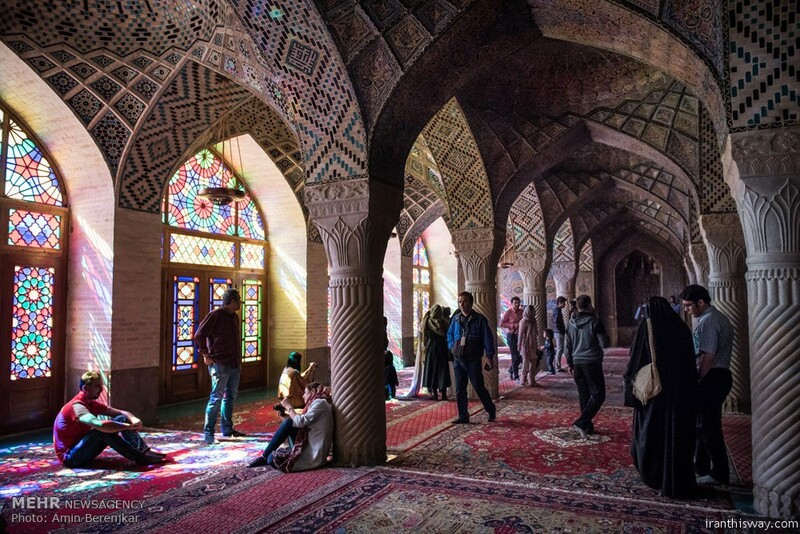 The Sheikh preaching in the Khanqah experiences a totally different world than the merchant passing through a town. 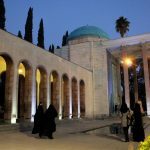 The unique thing about Saadi is that he embodies both the Sufi Sheikh and the travelling merchant. 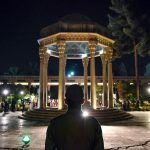 They are, as he himself puts it, two almond kernels in the same shell. 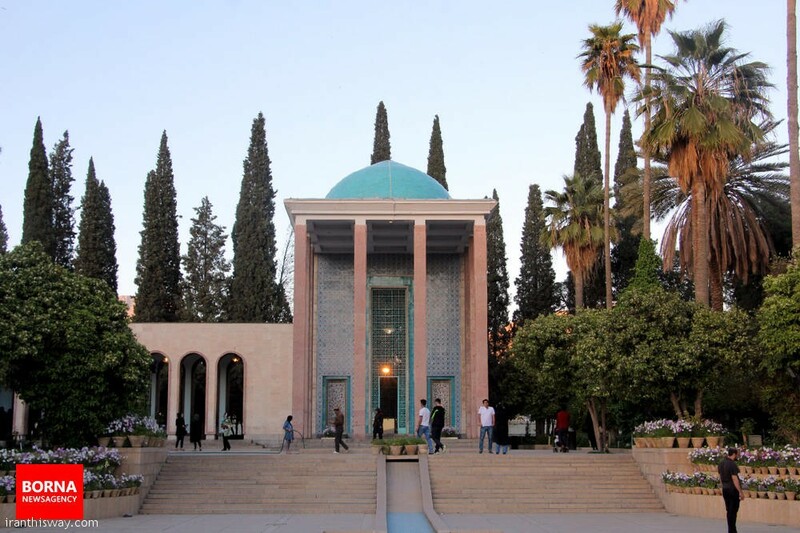 Saadi Shirazi, Sheikh Mosleh al-Din, was born in Shiraz around 1200. 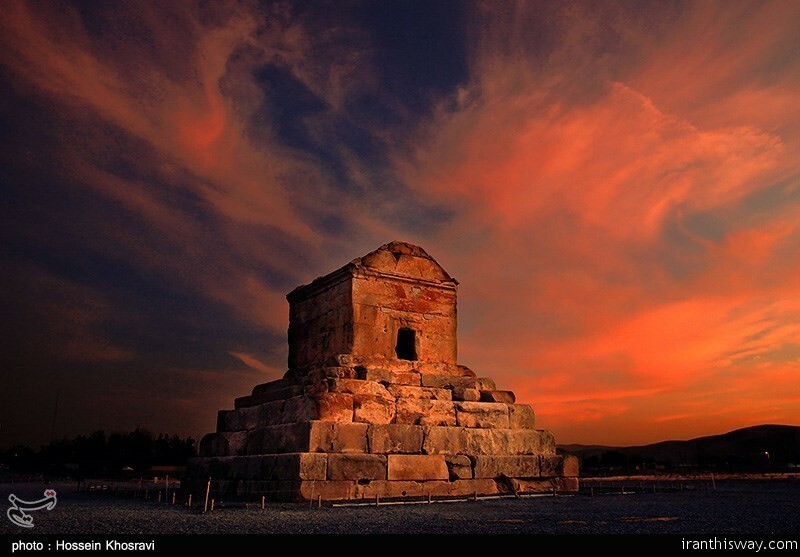 He died in Shiraz around 1292. 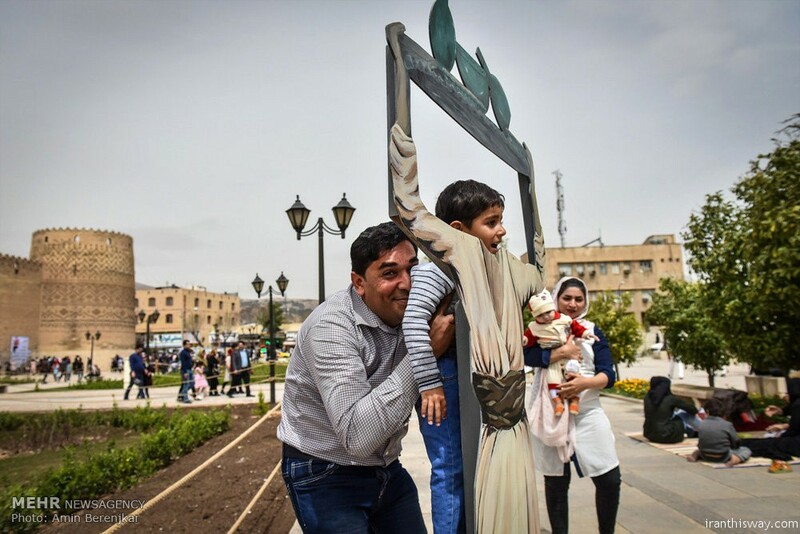 He lost his father in early childhood. 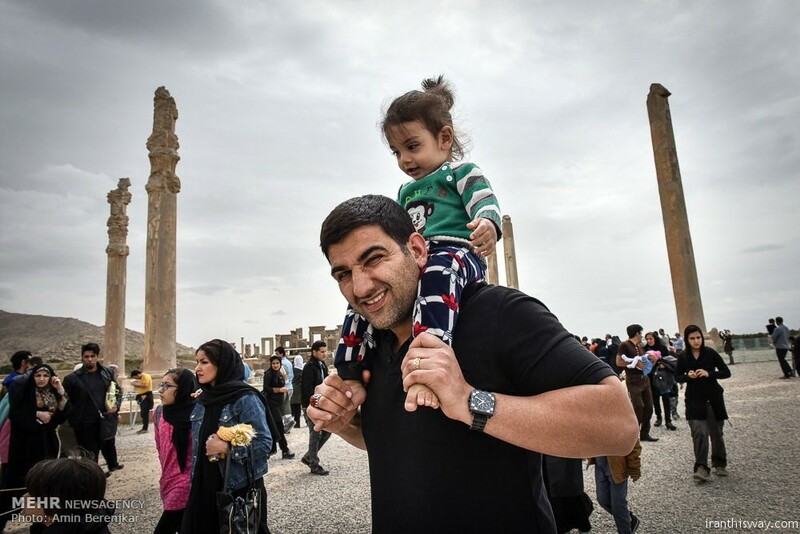 With the help of his uncle, Saadi completed his early education in Shiraz. 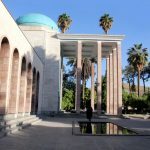 Later he was sent to study in Baghdad at the renowned Nezamiyeh College, where he acquired the traditional learning of Islam. 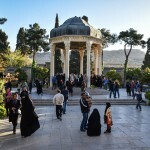 His best known works are the Bostan (The Orchard) and the Golestan (The Rose Garden). 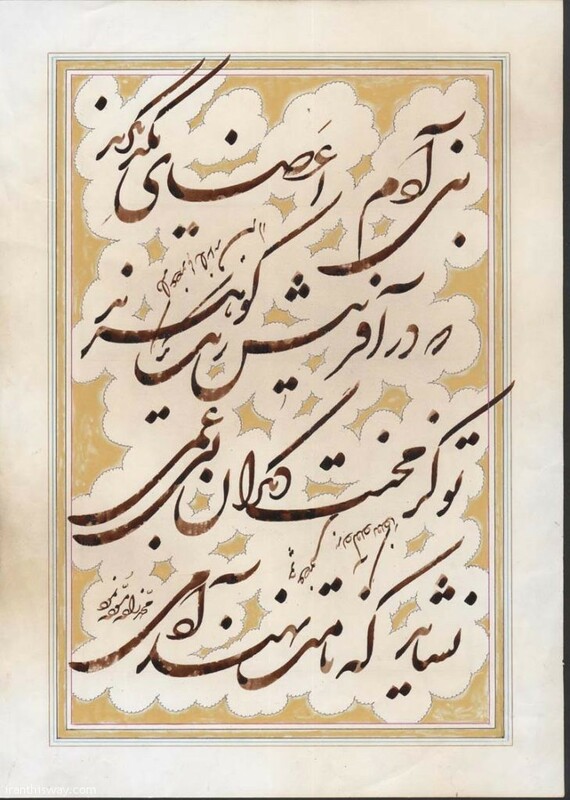 The Bostan is entirely in verse (epic metre) and consists of stories aptly illustrating the standard virtues recommended to Muslims (justice, liberality, modesty, contentment) as well as of reflections on the behaviour of dervishes and their ecstatic practices. 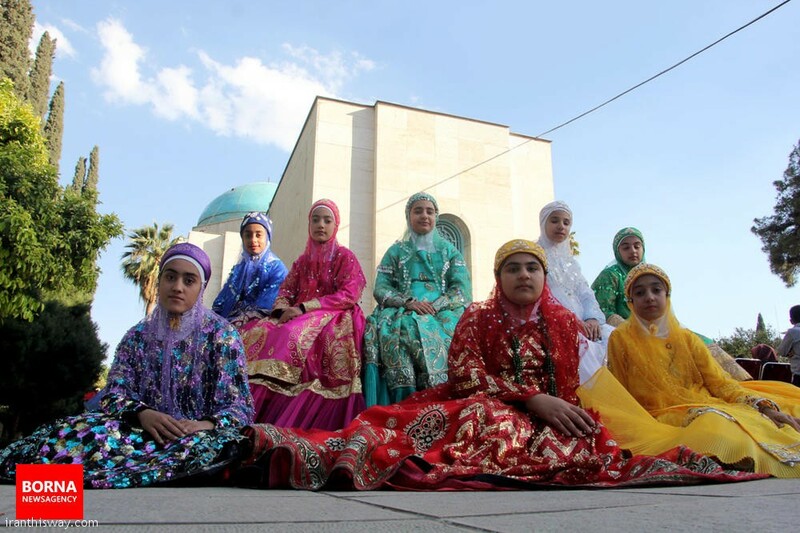 The Golestan is mainly in prose and contains stories and personal anecdotes. The text is interspersed with a variety of short poems, containing aphorisms, advice, and humorous reflections. 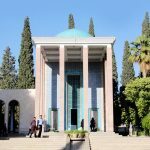 Saadi demonstrates a profound awareness of the absurdity of human existence. 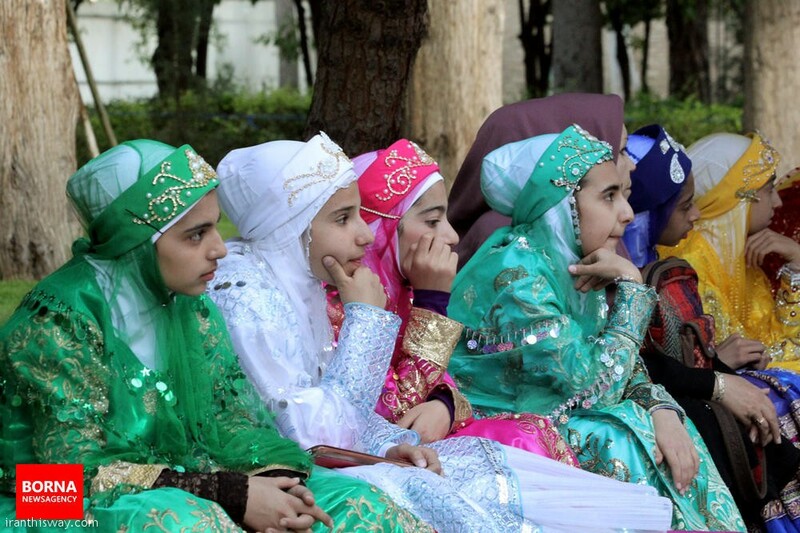 The fate of those who depend on the changeable moods of kings is contrasted with the freedom of the dervishes. 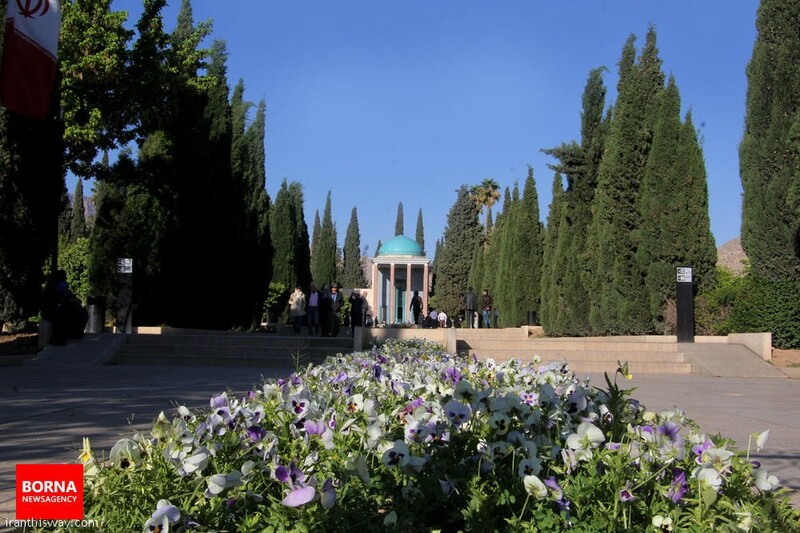 Saadi distinguished between the spiritual and the practical or mundane aspects of life. 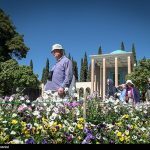 In his Bostan, for example, spiritual Saadi uses the mundane world as a spring board to propel himself beyond the earthly realms. 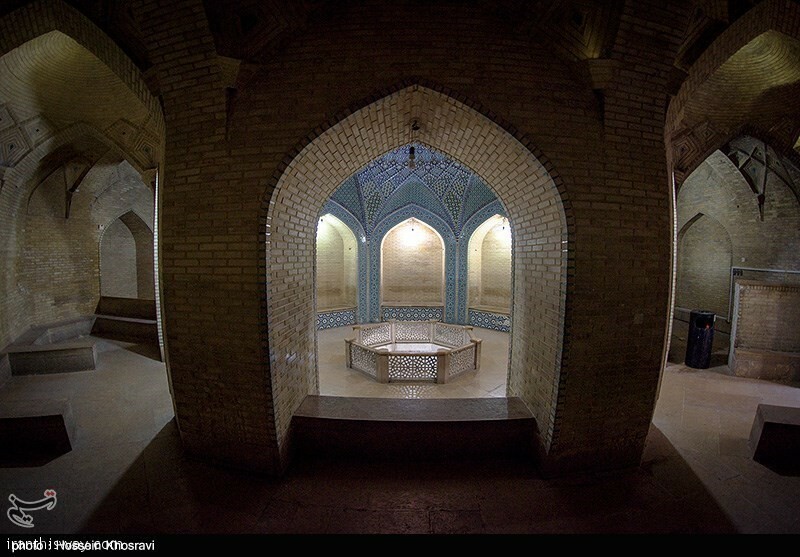 The images in Bostan are delicate in nature and soothing. 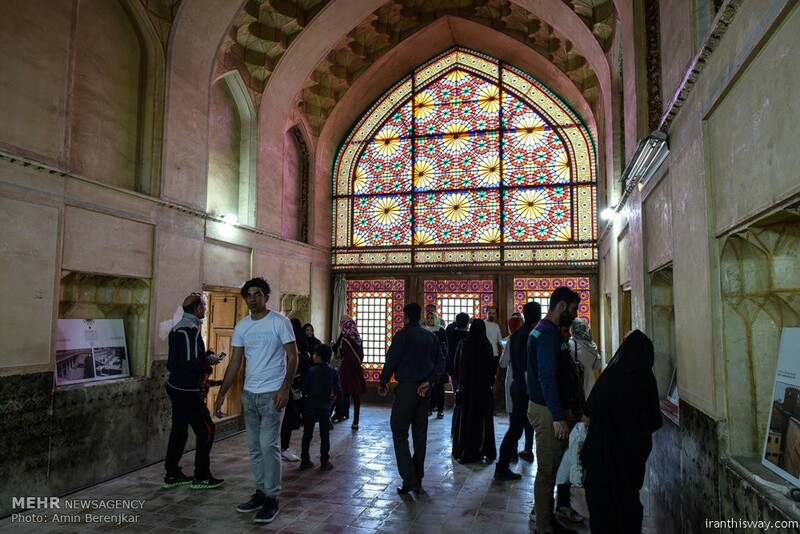 In the Golestan, on the other hand, mundane Saadi lowers the spiritual to touch the heart of his fellow wayfarers. 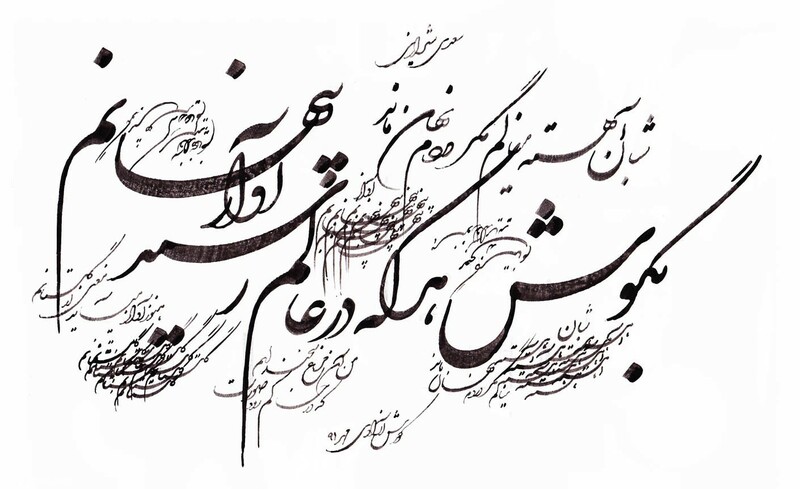 Here the images are graphic and, thanks to Saadi’s dexterity, remain concrete in the reader’s mind. 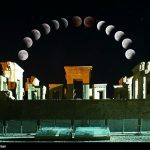 Realistically, too, there is a ring of truth in the division. 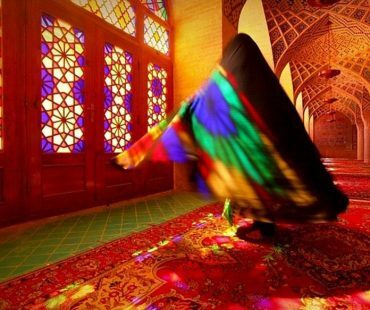 The Shaykh preaching in the Khaniqah experiences a totally different world than the merchant passing through a town. 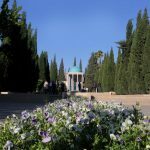 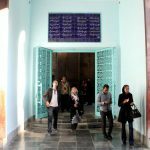 The unique thing about Saadi is that he embodies both the Sufi Shaykh and the traveling merchant. 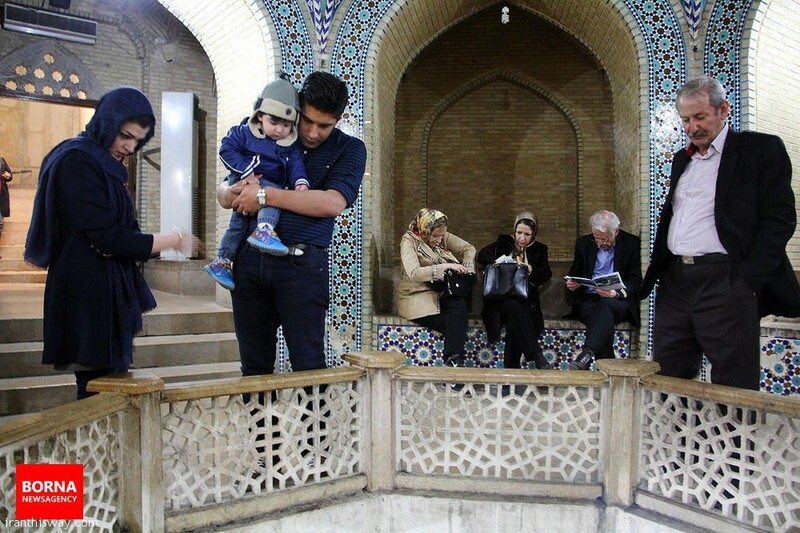 They are, as he himself puts it, two almond kernels in the same shell. 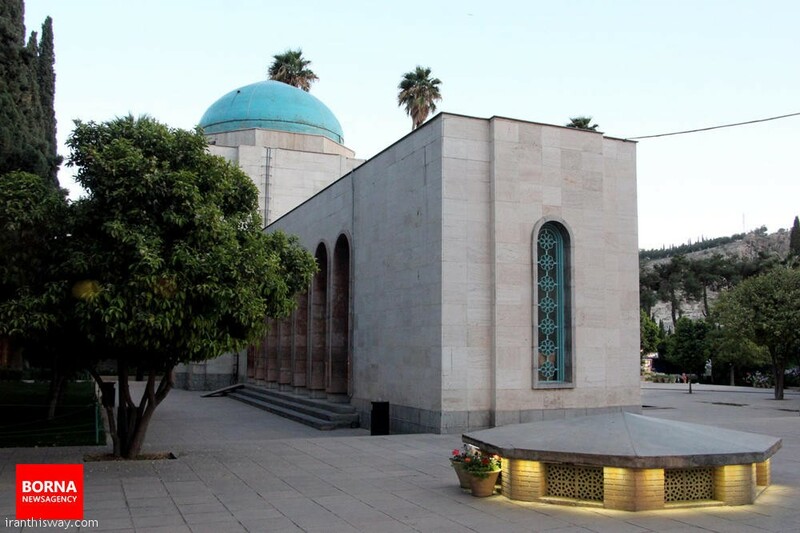 Saadi’s prose style, described as “simple but impossible to imitate” flows quite naturally and effortlessly. 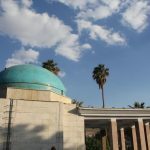 Its simplicity, however, is grounded in a semantic web consisting of synonymy, homophony, and oxymoron buttressed by internal rhythm and external rhyme. 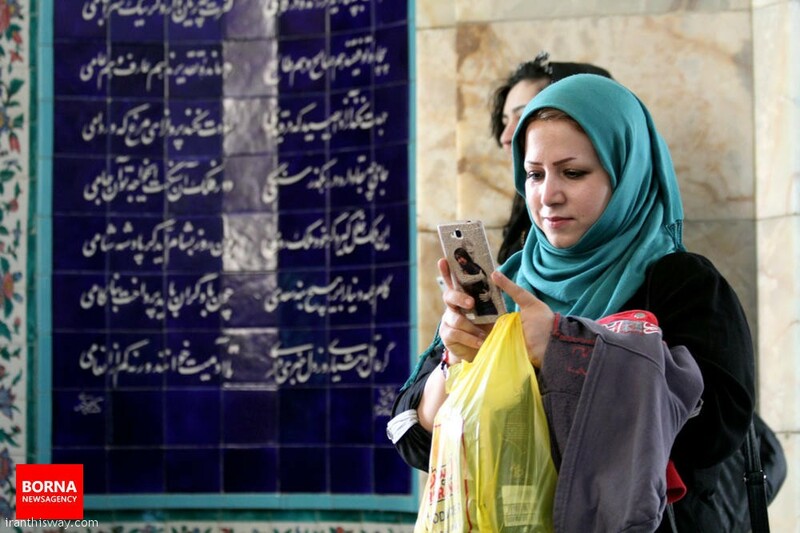 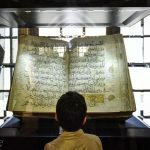 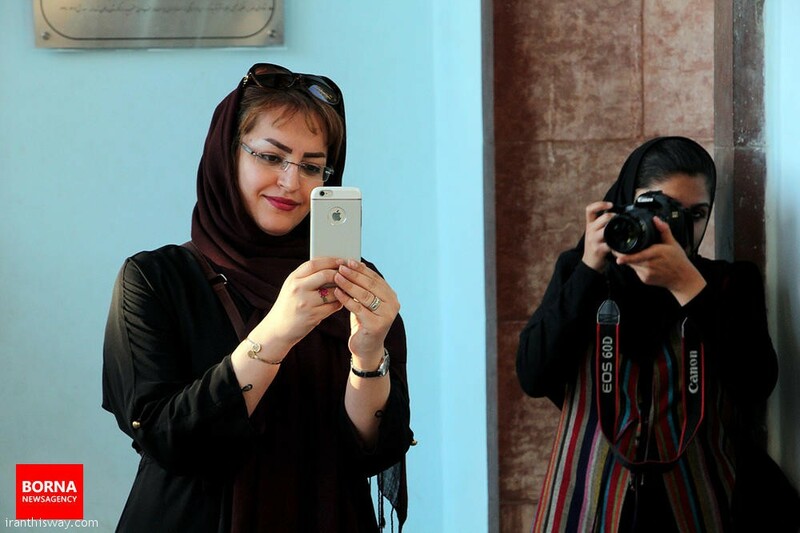 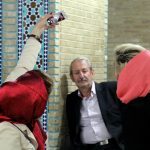 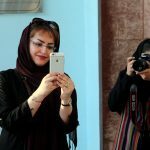 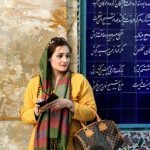 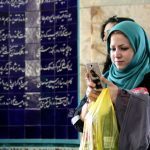 Iranian authors over the years have failed to imitate its style in their own language, how can foreigners translate it into their own language, no matter what language? 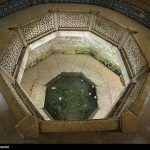 O wise man, wash your hands of that friend who associates with your enemies. 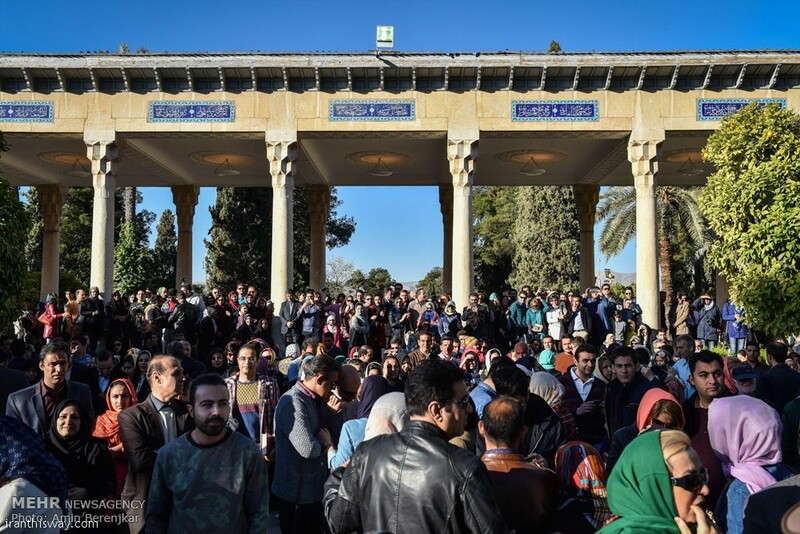 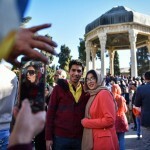 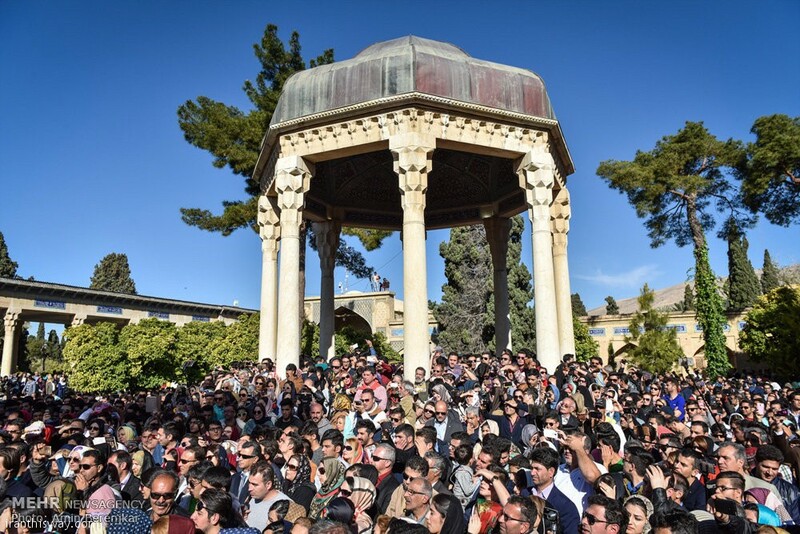 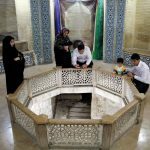 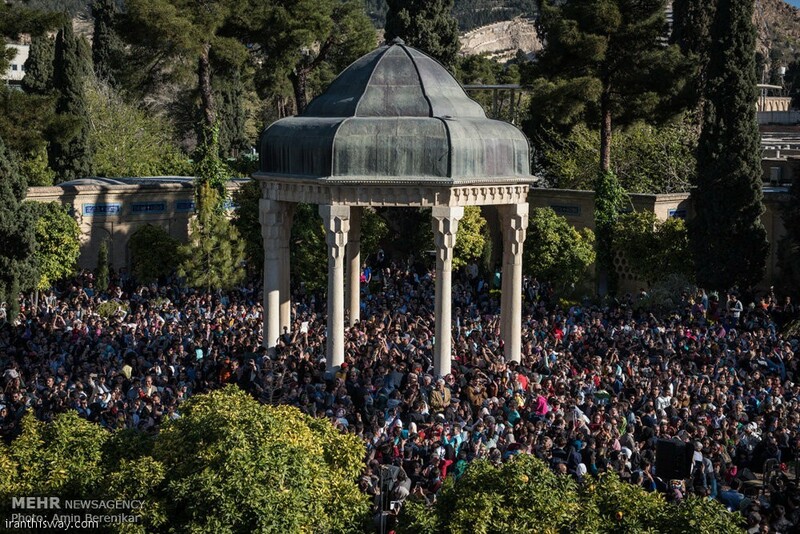 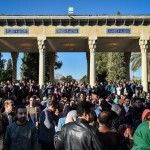 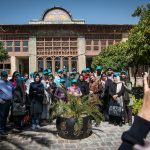 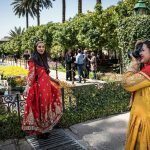 Iranians gathered in Hāfezieh, tomb of Hafez, to celebrate the Nowruz and new Persian year on Sunday March 20, 2016 in Shiraz.. Photo: Mehrnews. 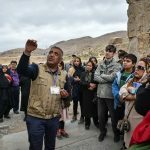 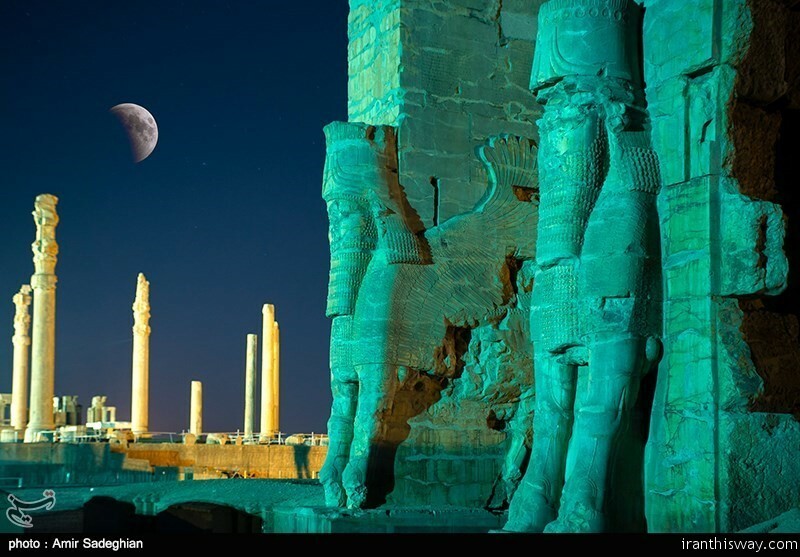 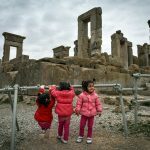 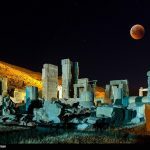 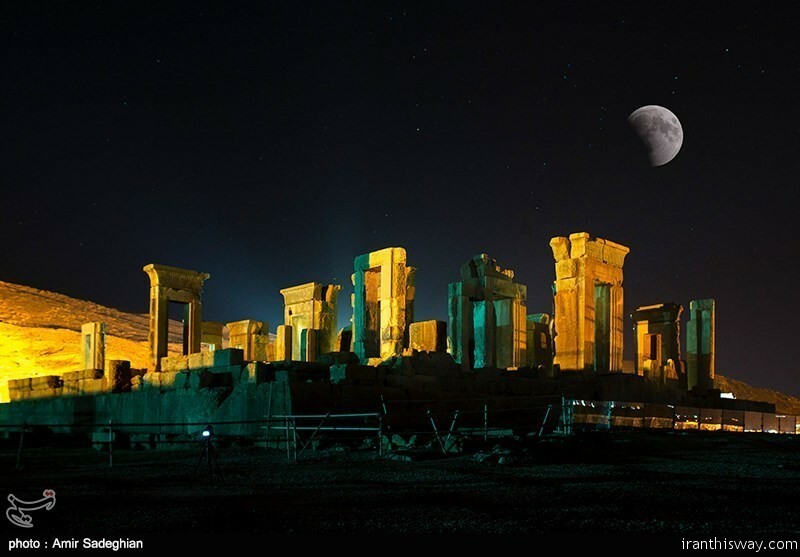 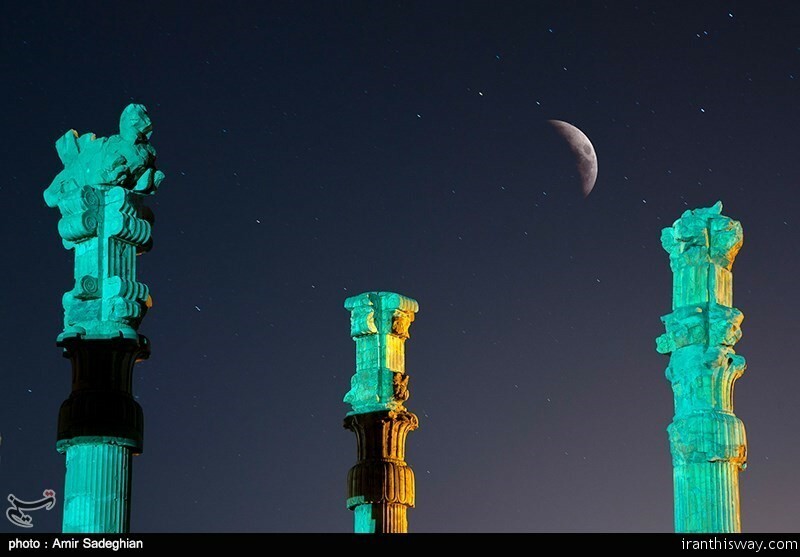 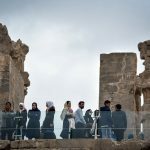 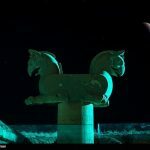 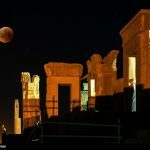 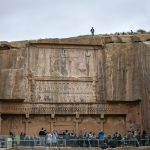 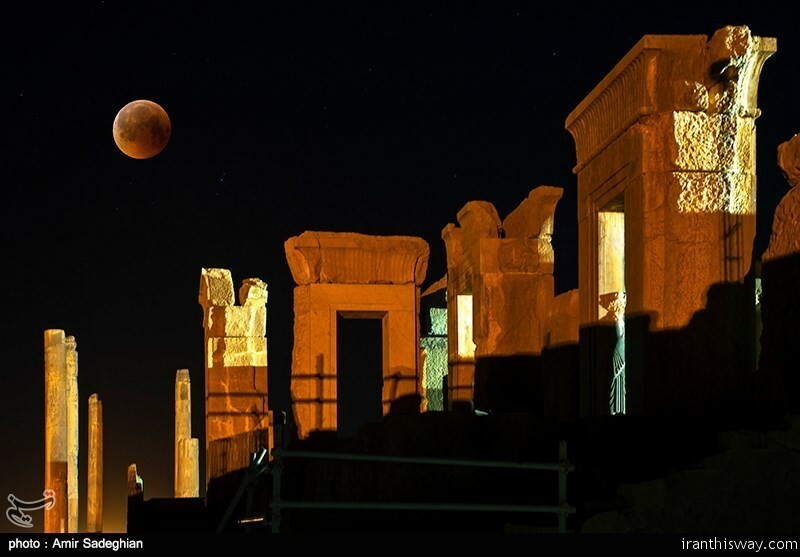 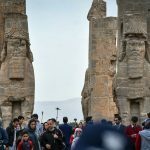 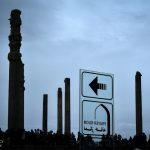 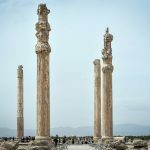 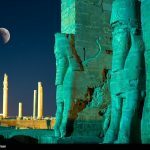 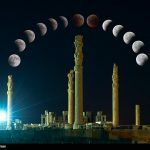 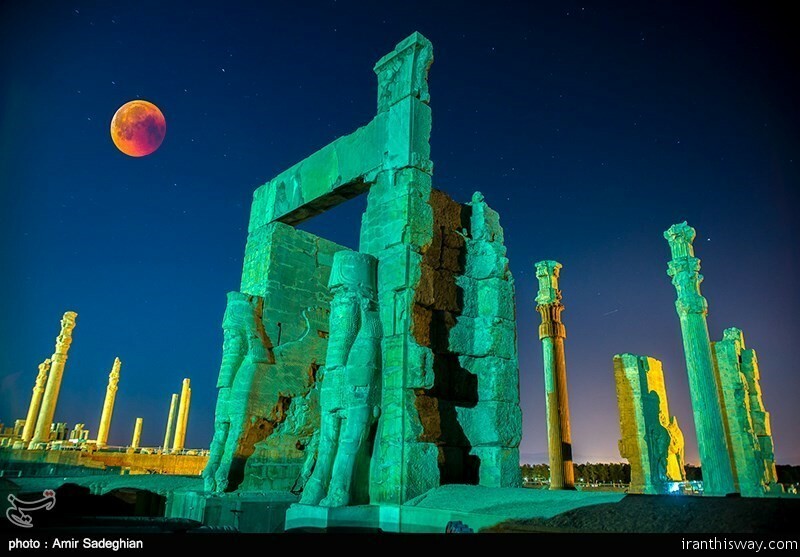 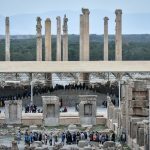 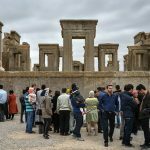 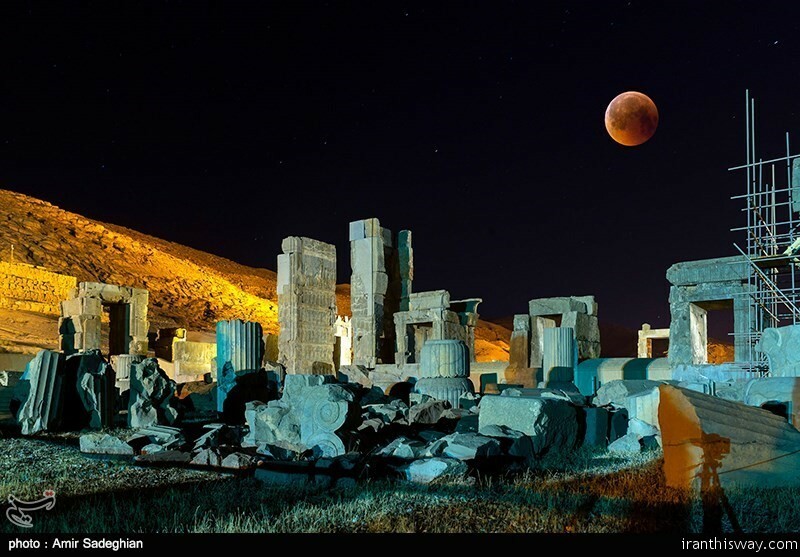 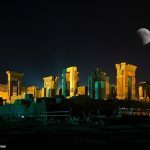 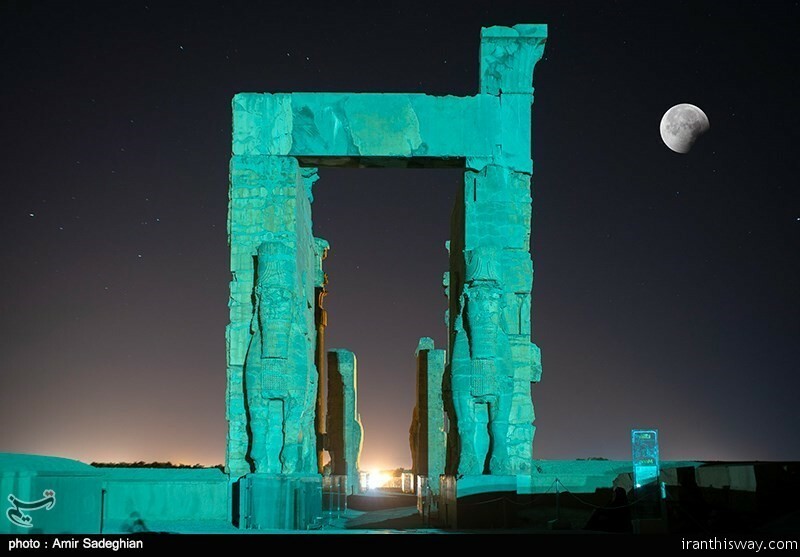 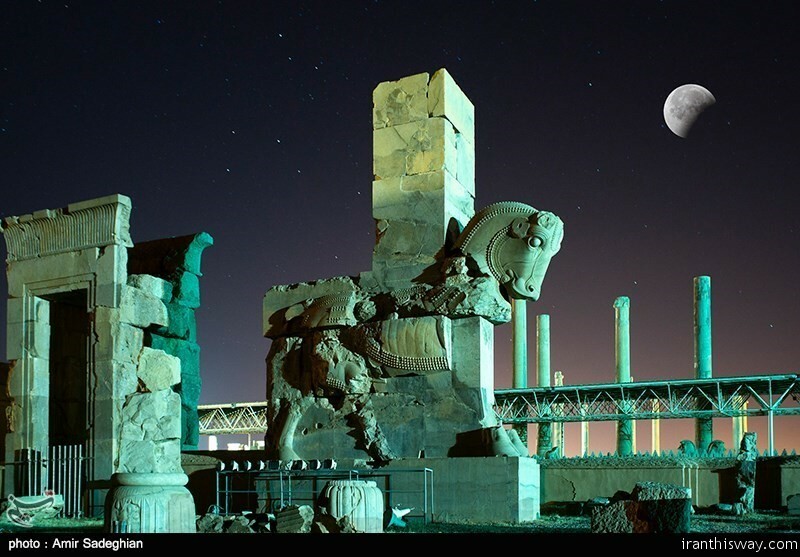 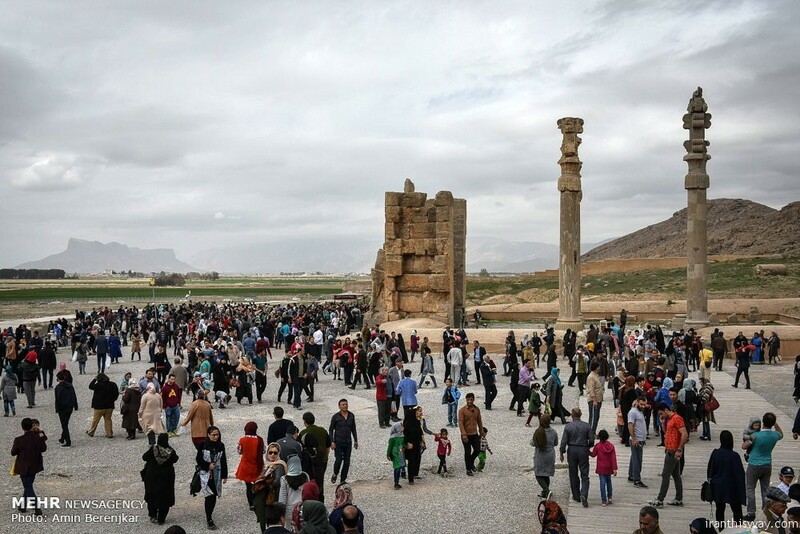 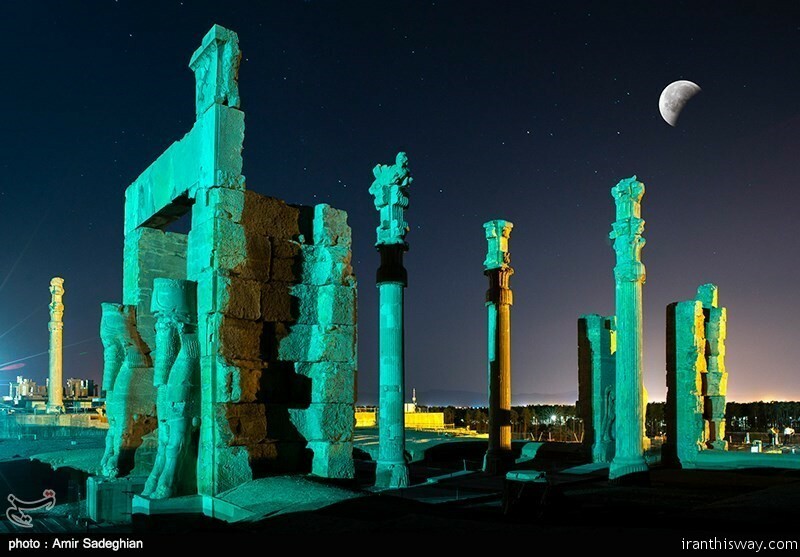 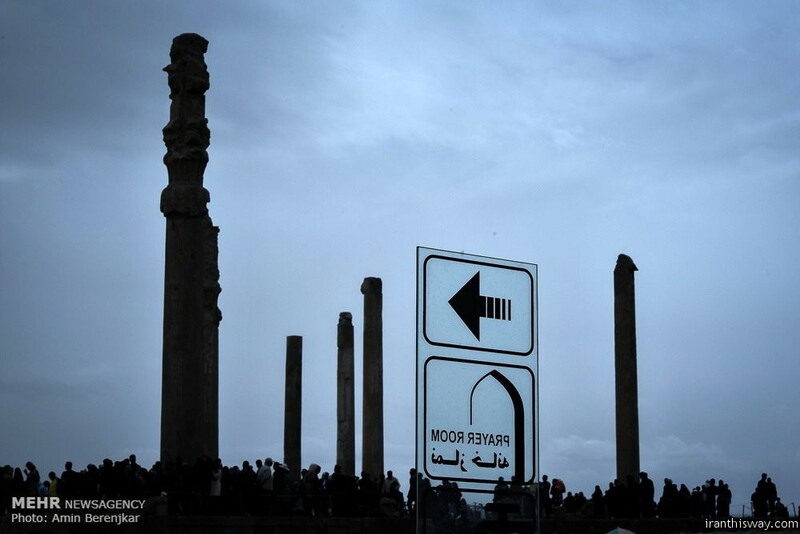 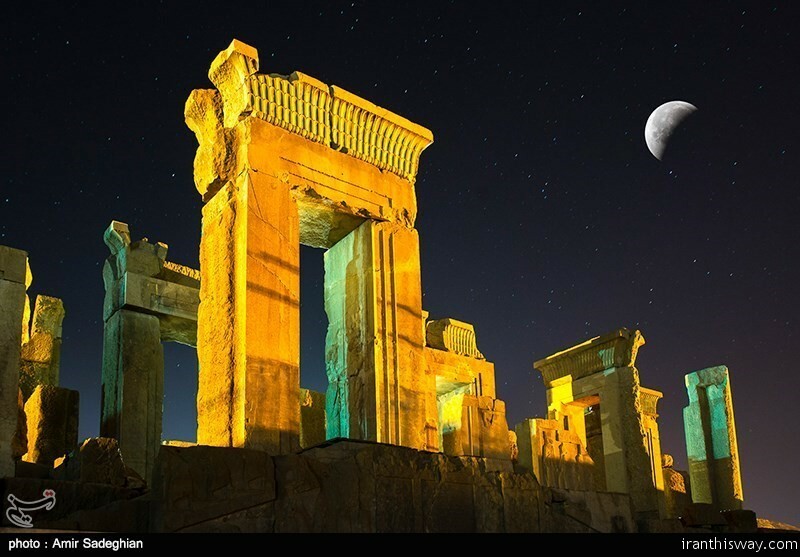 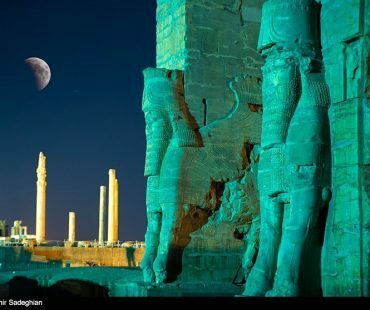 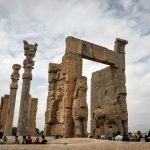 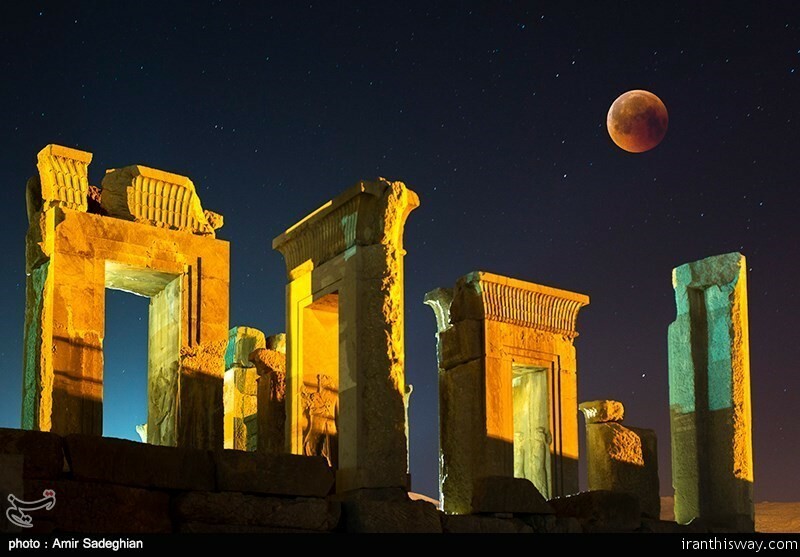 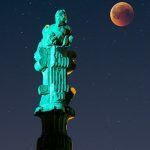 The 21st century’s longest total lunar eclipse was observed in Iran’s Persepolis (Takht-e Jamshid in Persian), the ceremonial capital of the Achaemenid Empire (ca. 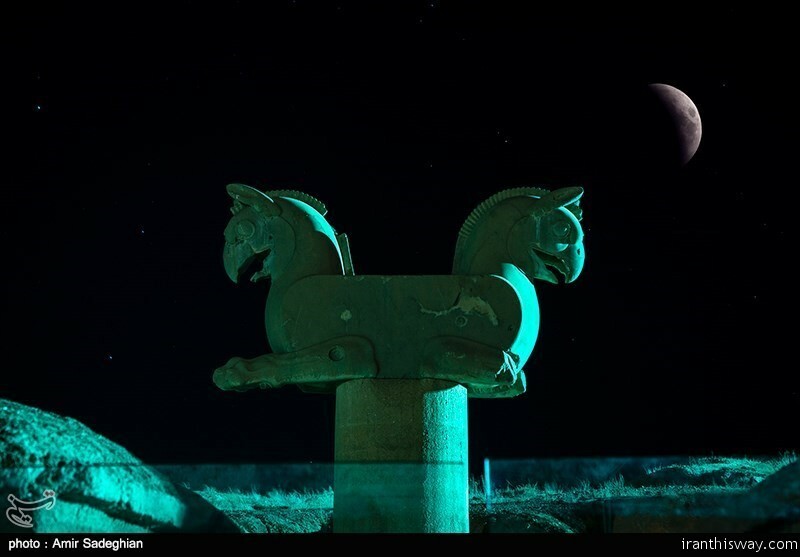 550–330 BC), located 60 km northeast of the southern city of Shiraz. 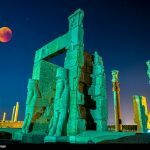 Persepolis (Old Persian: ‘Parseh’, New Persian:Takht-e Jamshid’) was an ancient ceremonial capital of the Persian Empire. 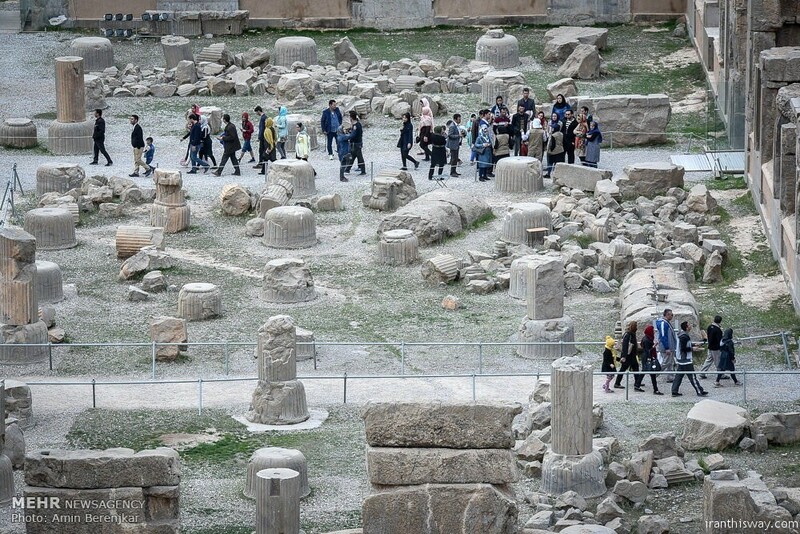 The largest and most complex building in Persepolis was the audience hall, or Apadana with 72 columns. 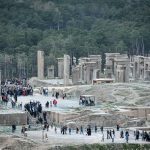 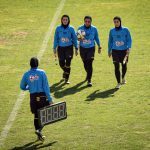 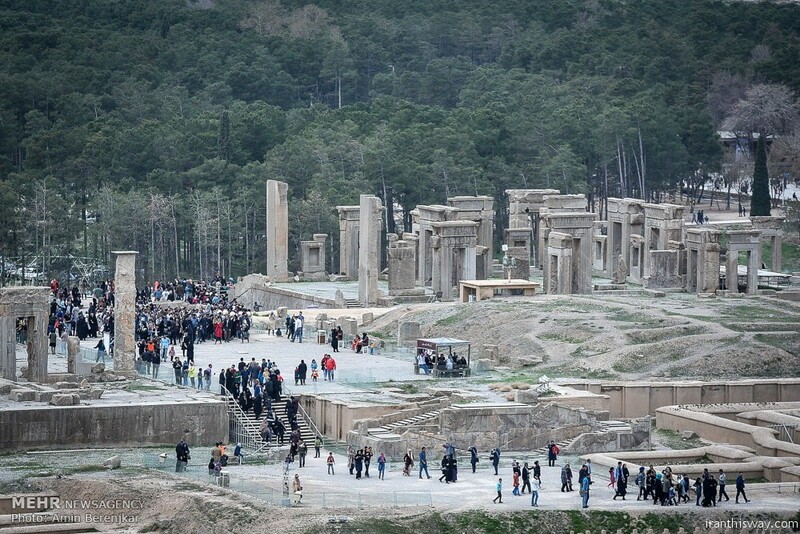 Persepolis is situated some 70 km northeast of the modern city of Shiraz in the Fars Province of Iran (Persia). 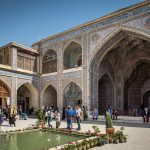 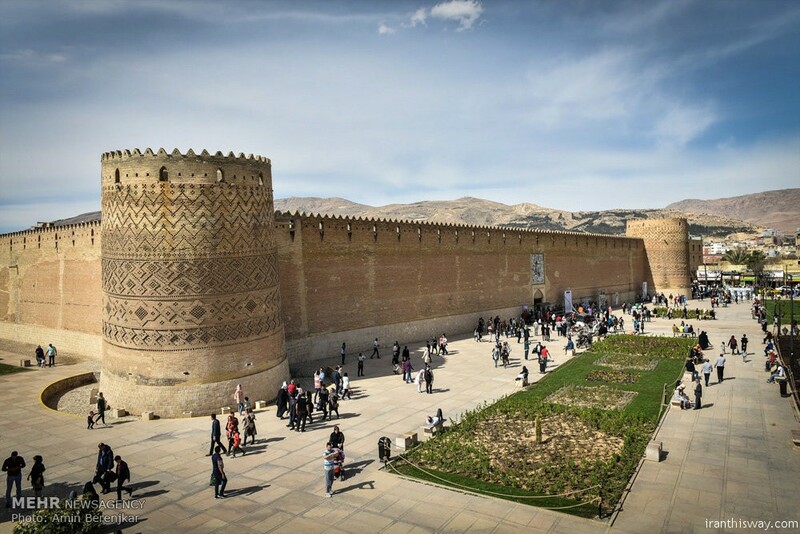 In contemporary Persian language the site is known as Takht-e Jamshid (Throne of Jamshid) and Parseh. 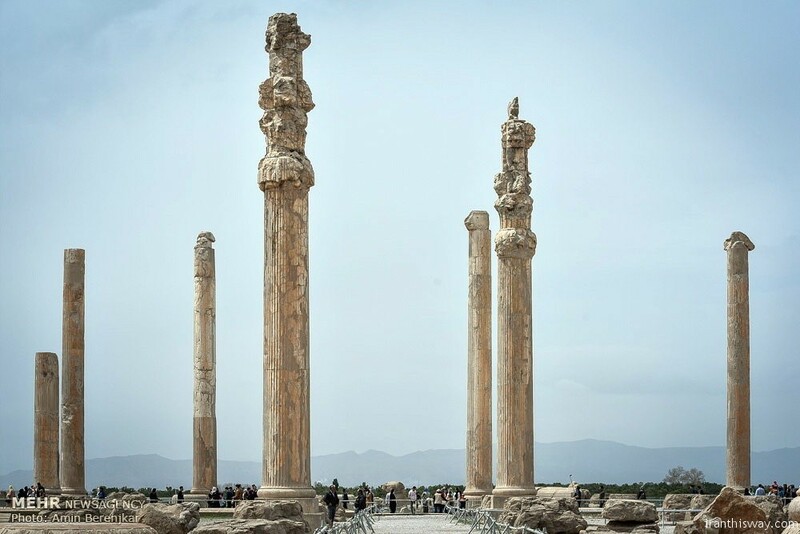 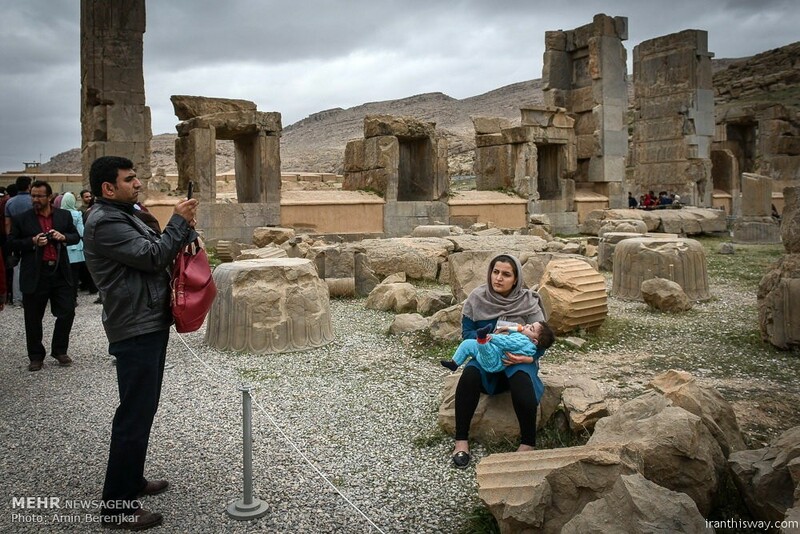 To the ancient Persians, the city was known as Parsa, meaning The City of Persians, Persepolis being the Greek interpretation of the name Περσες (meaning Persian)+ πόλις (meaning city). 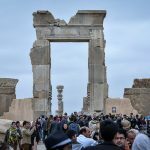 The first westerner to visit Persepolis was Antonio de Gouveia from Portugal who wrote about cuneiform inscriptions following his visit in 1602. 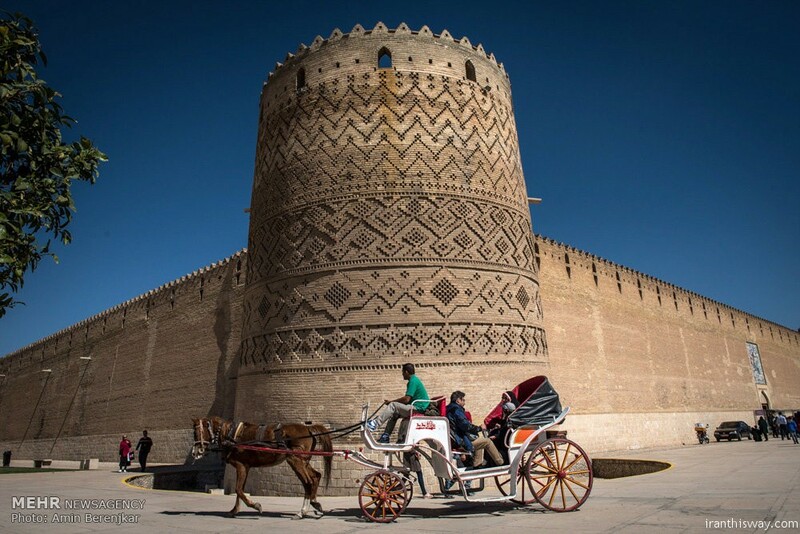 His first written report on Persia, the “Jornada”, was published in 1606. 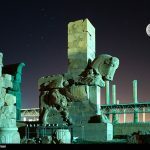 The first scientific excavation at Persepolis was carried out by Ernst Herzfeld in 1931, commissioned by the Oriental Institute of the University of Chicago. 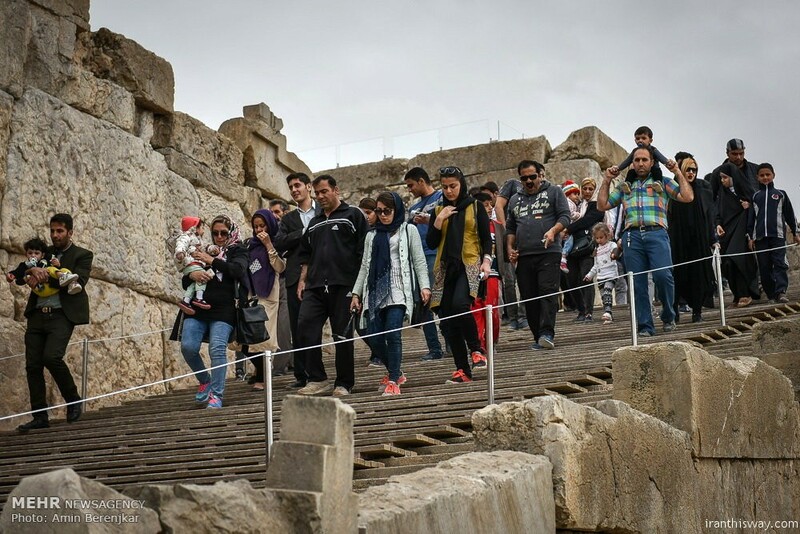 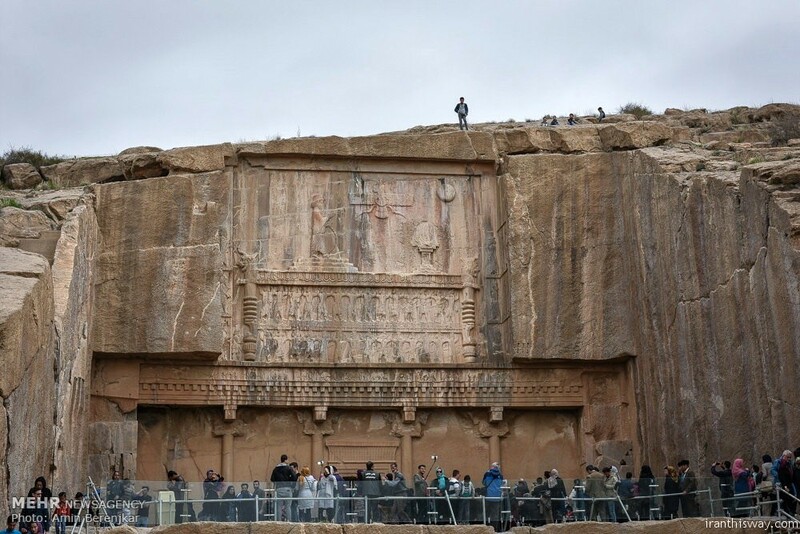 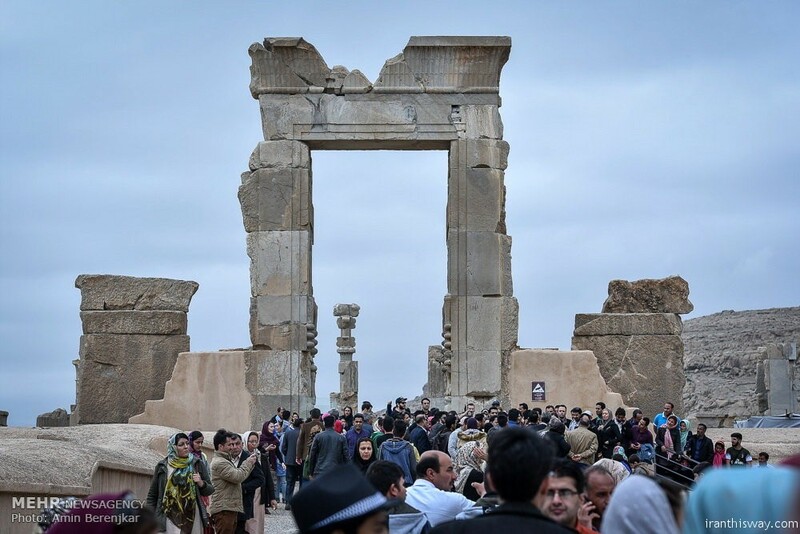 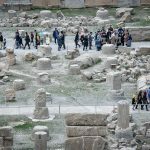 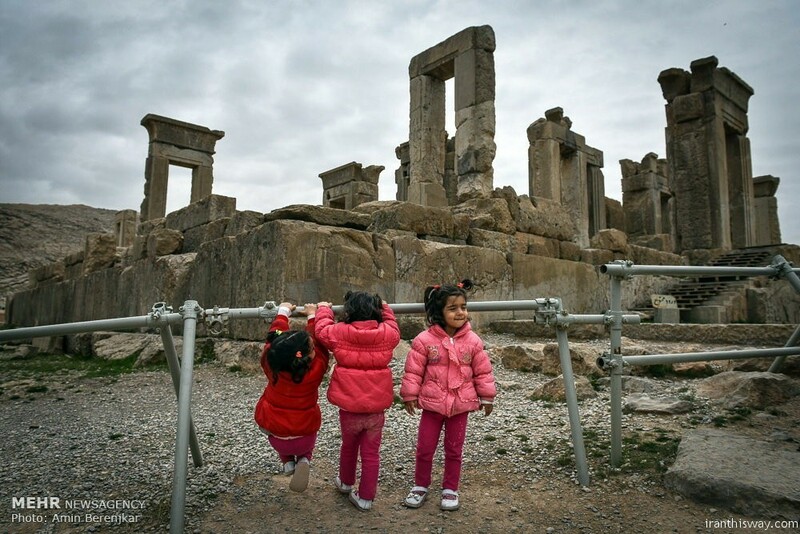 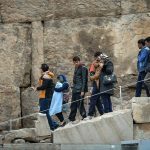 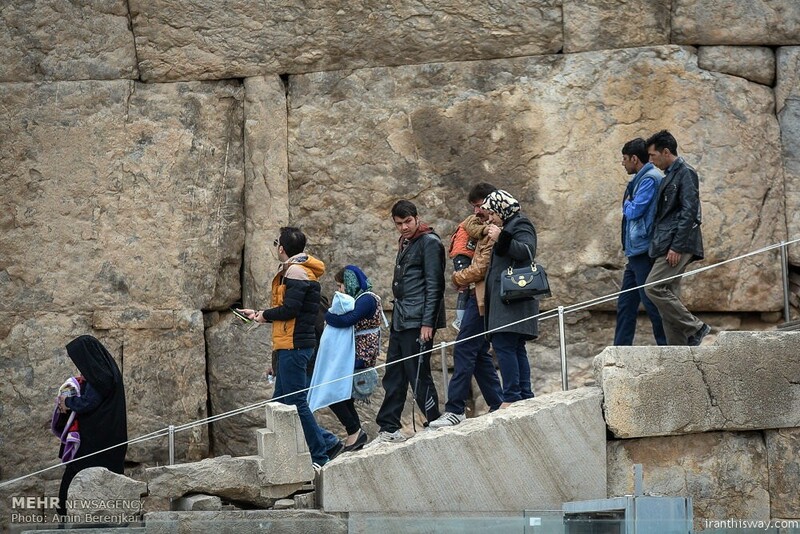 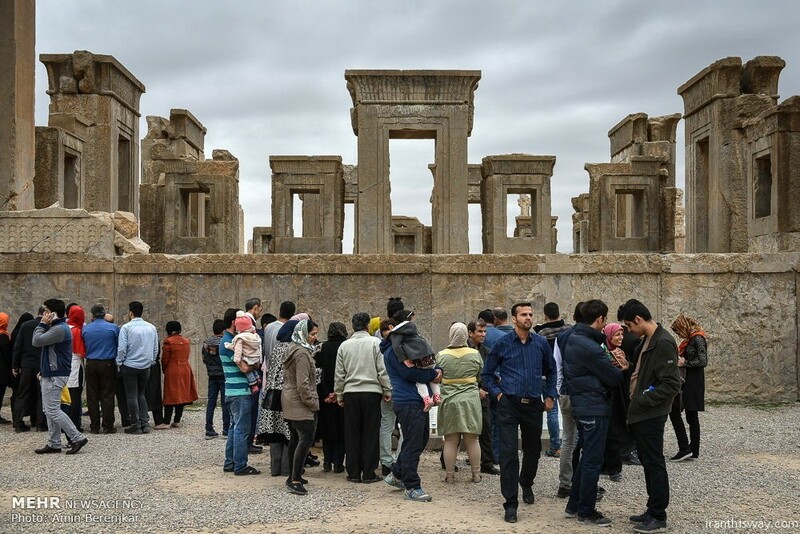 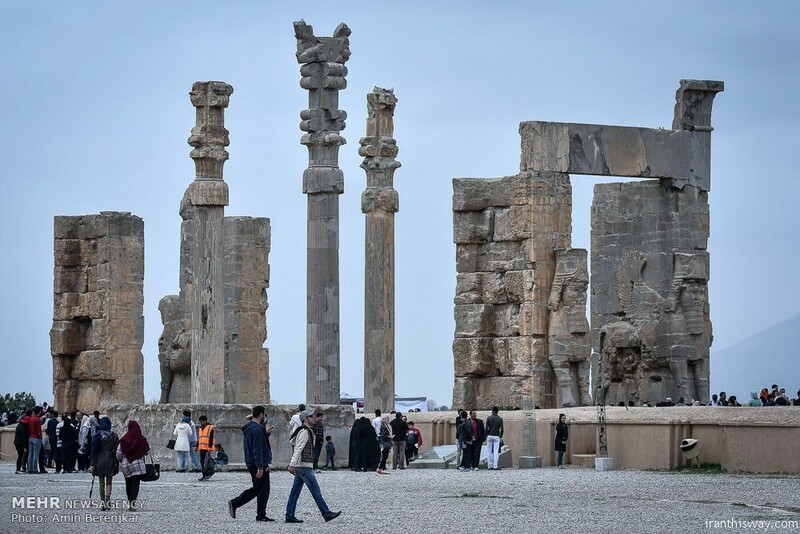 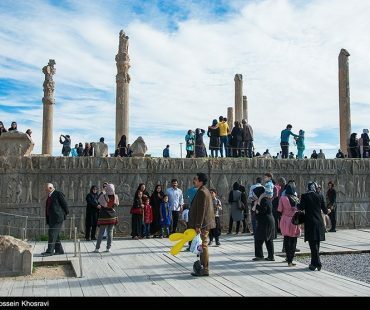 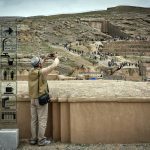 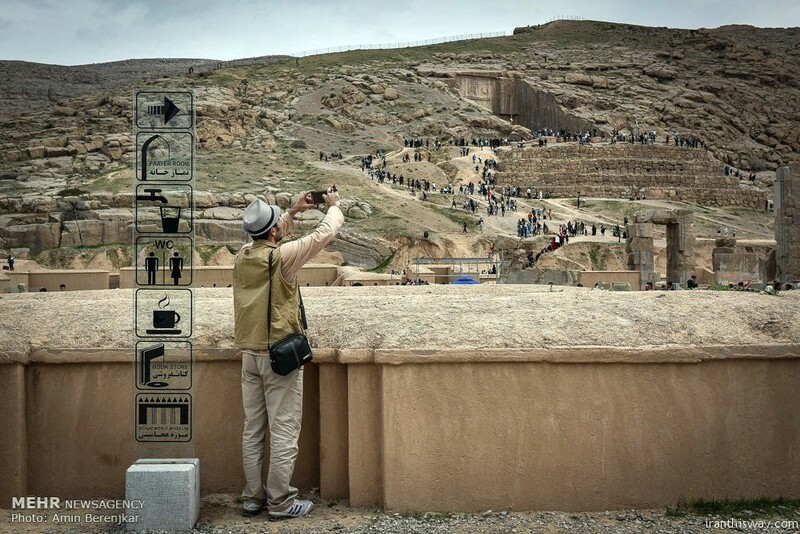 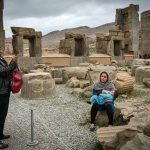 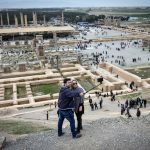 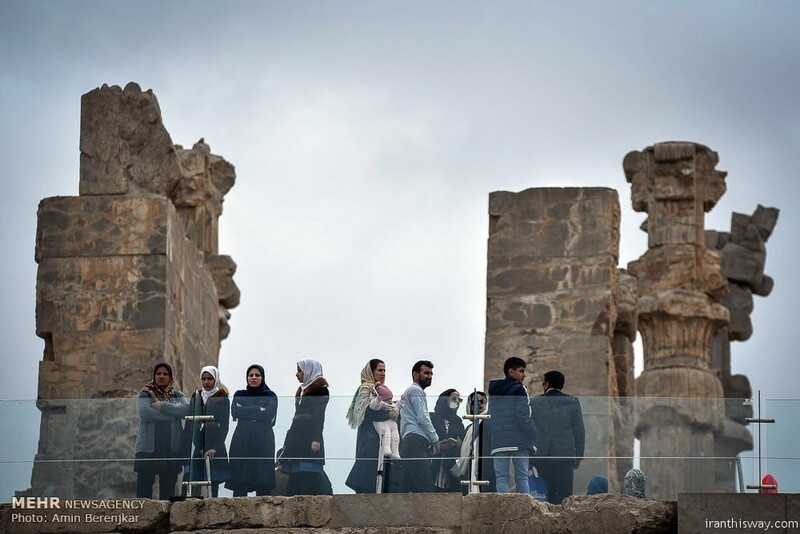 He believed the reason behind the construction of Persepolis was the need for a majestic atmosphere, as a symbol for their empire and to celebrate special events, especially the “Nowruz”, (the Persian New Year held on 21 March). 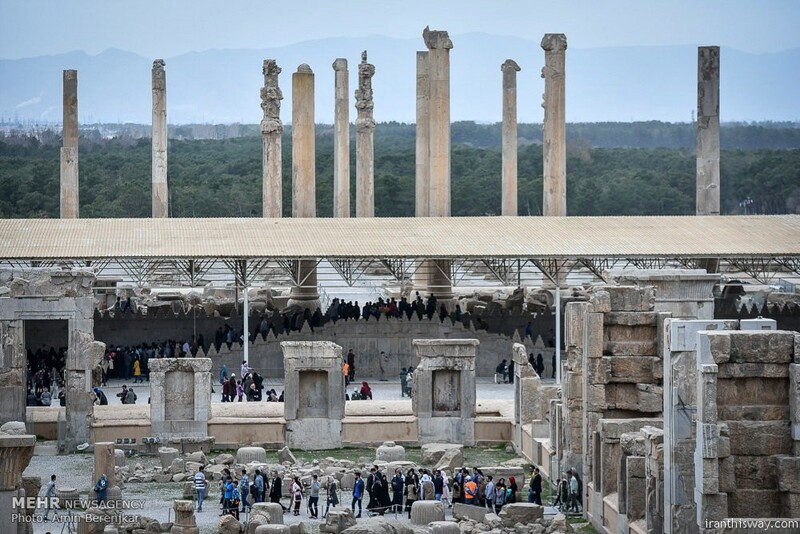 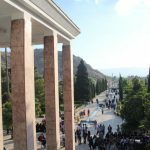 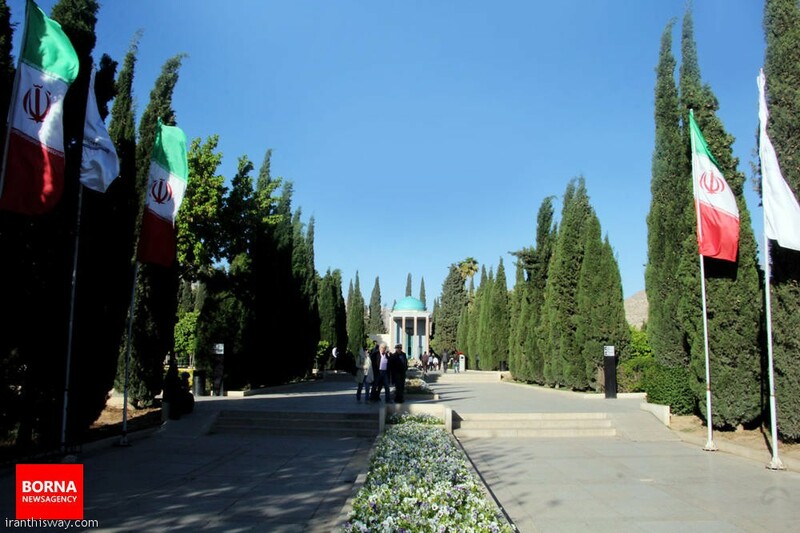 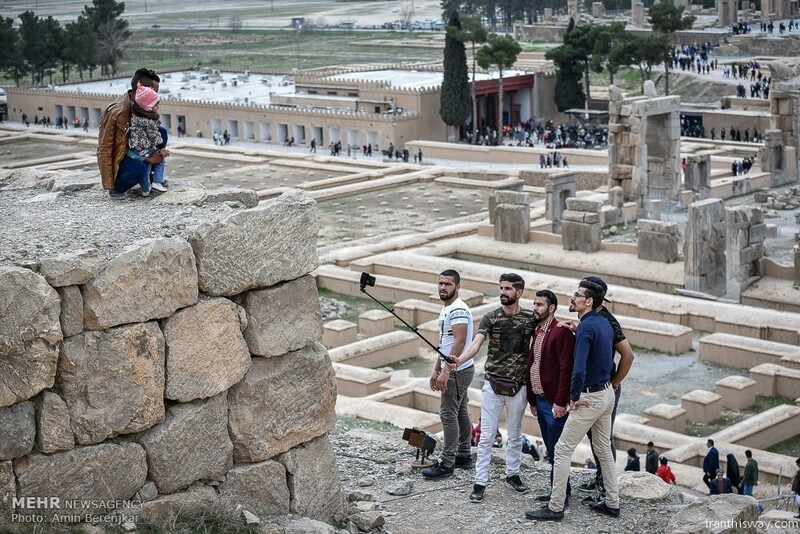 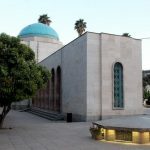 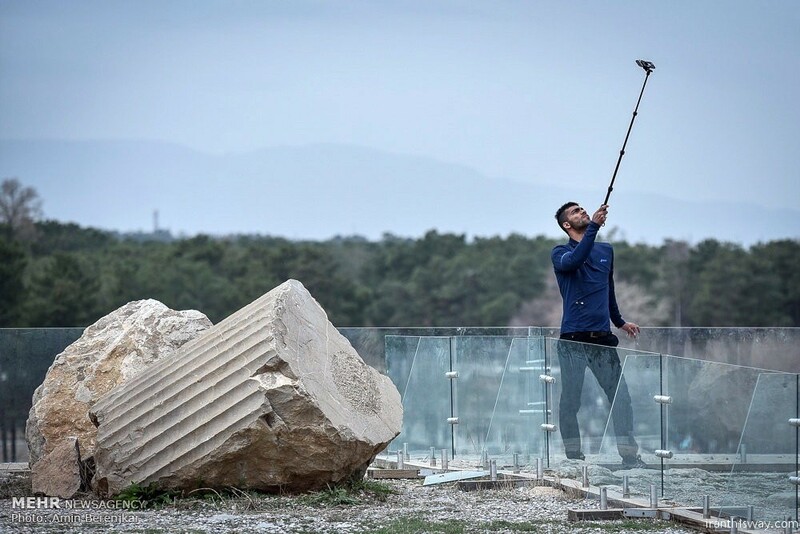 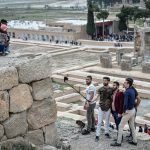 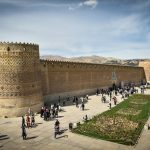 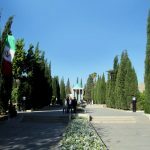 For historical reasons and deep rooted interests it was built on the birthplace of the Achaemenid dynasty, although this was not the centre of their Empire at that time. 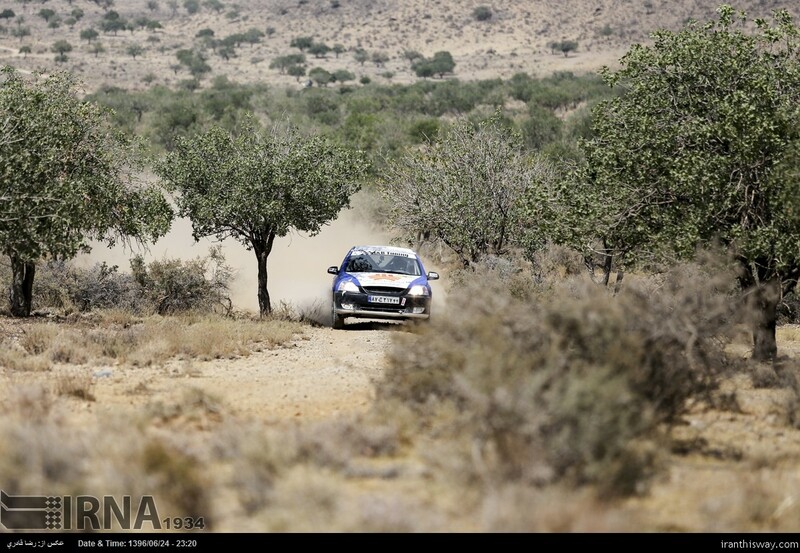 Azerbaijan, Russia, Iran and India started testing the North-South Transport Corridor as part of a sports car rally. 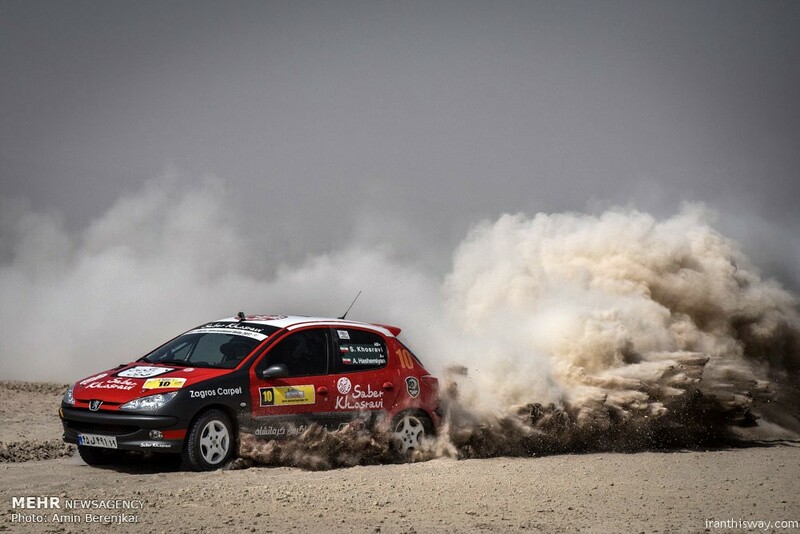 The event is organized jointly by the Federation of Freight Forwarders of India and the sports club ‘Kalinga Motor’, said Iran’s Ministry of Roads and Urban Development, reported Trend News Agency. 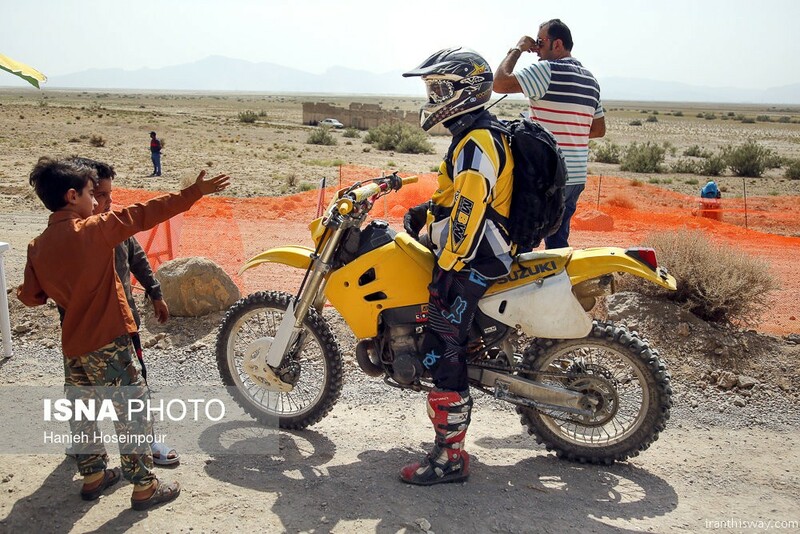 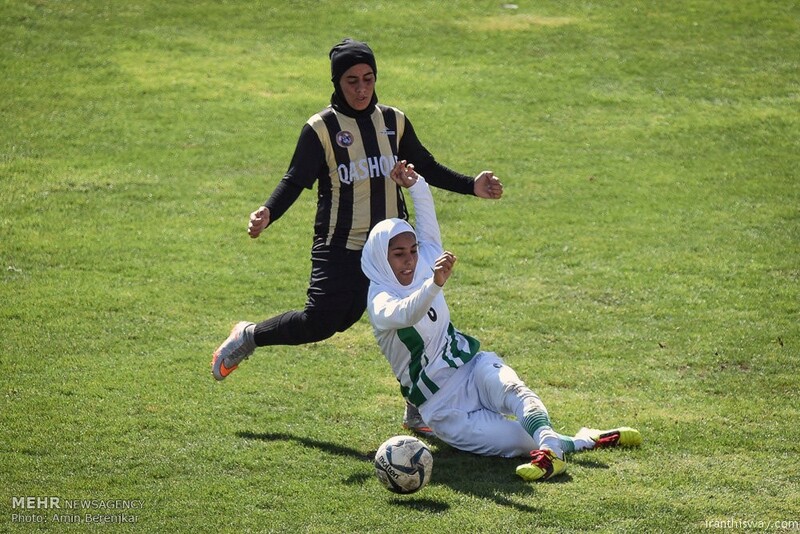 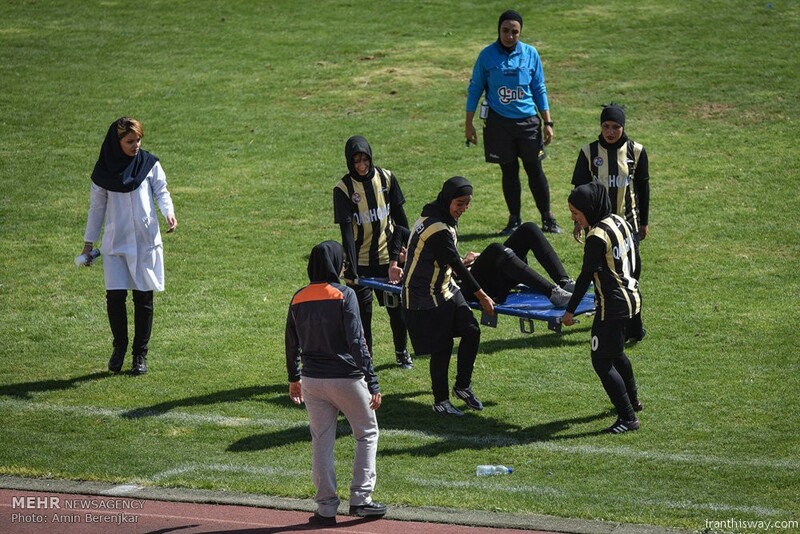 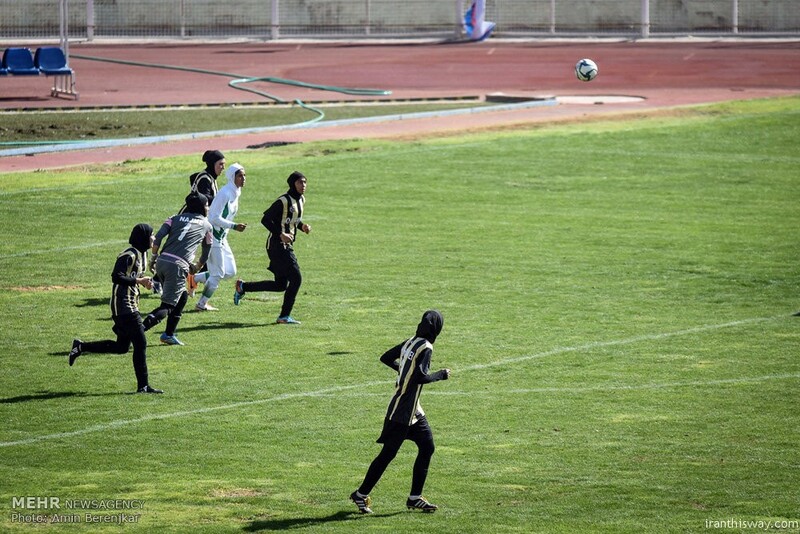 Iranian entities organizing the race are the Ministries of Foreign Affairs and Road Facilities, the Federation of Motorcycles and Vehicles and the Customs Board of the Islamic Republic of Iran. 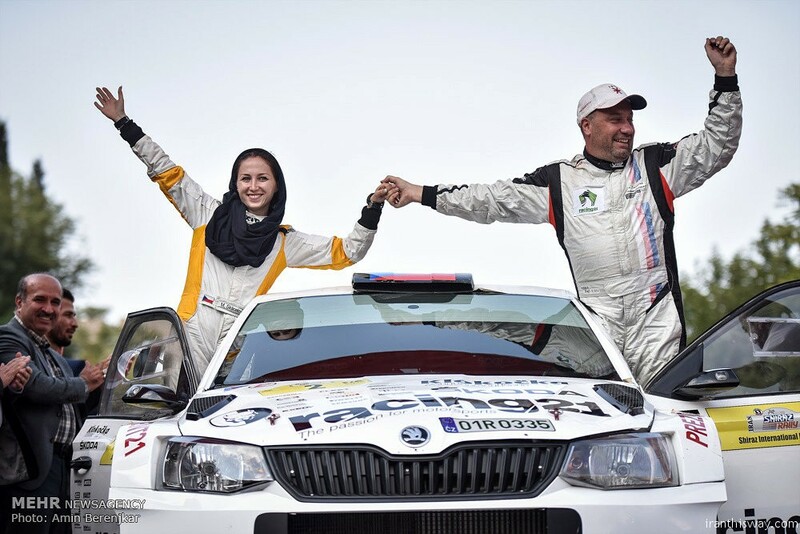 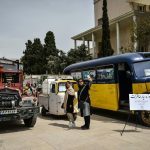 The 30-day rally will cover the route from extending from Shiraz, Isfahan, Tehran, Qazvin, Rasht to Astara port on Iranian territory and onward to Moscow and St. Petersburg and back again to finish in Chabahar. 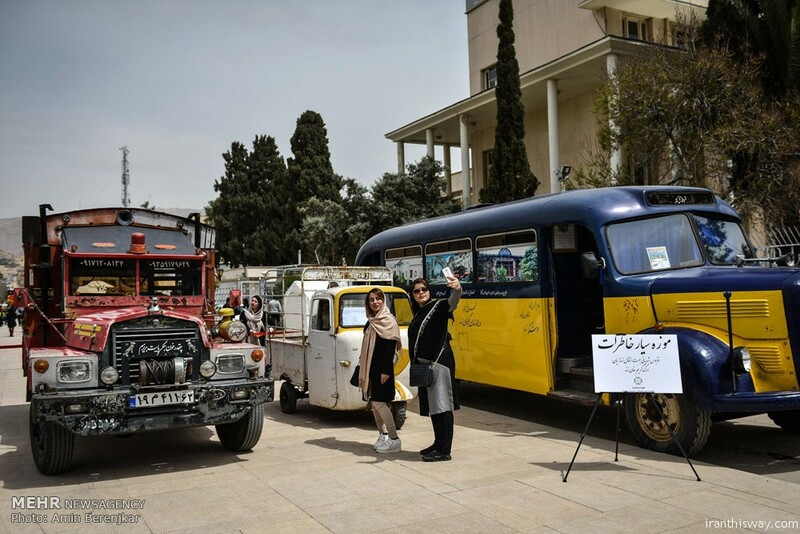 Twenty trucks are participating in the competitions, one from Russia, Iran and Azerbaijan, while the rest will belong to the Indian teams. 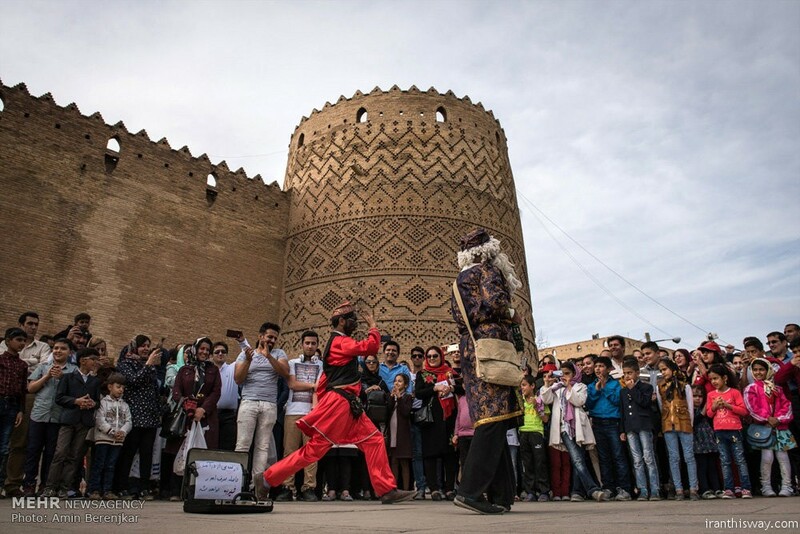 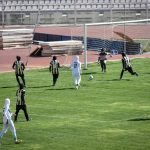 Around 39 participants are taking part in the competition. 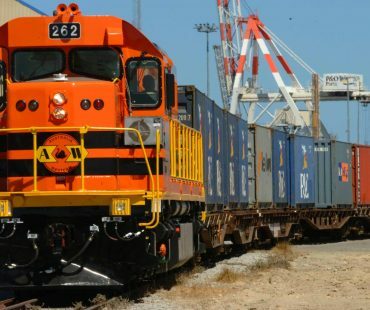 The North-South transport corridor is designed to connect Northern Europe with India and Southeast Asia. 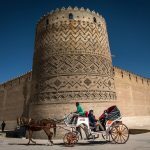 The route will also link the railways of Iran, Azerbaijan and Russia. 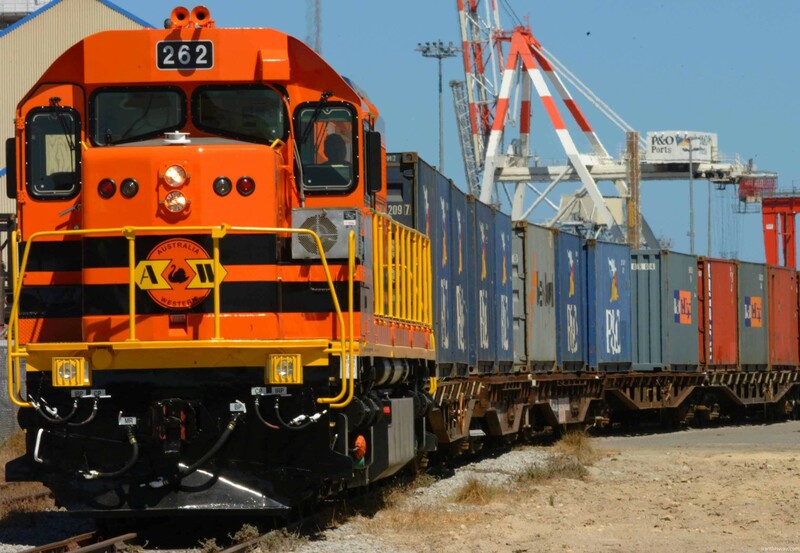 In the initial stage, six million tons of cargo are planned to be transported through the corridor per year and the figure will eventually rise to 15-20 million tons.